Usayama castle (宇佐山城) is located at the top of Usayama mountain, one of about 200 meter height from hillside in the north part of Otsu city. 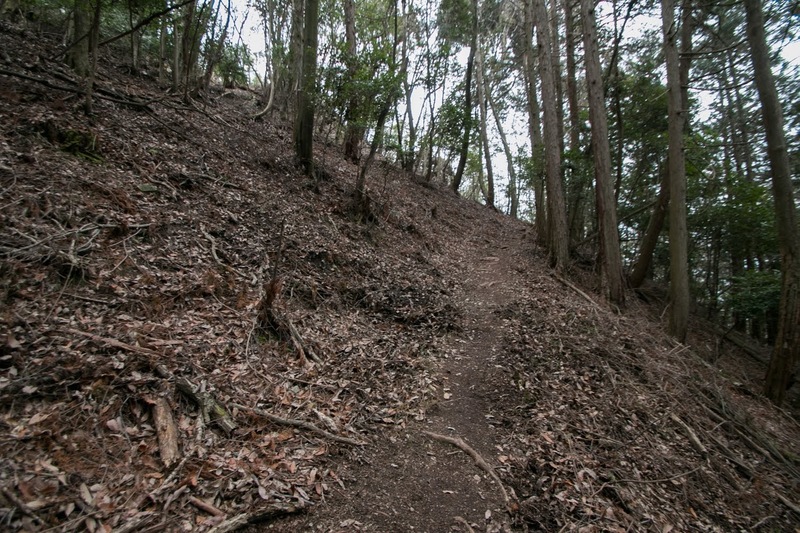 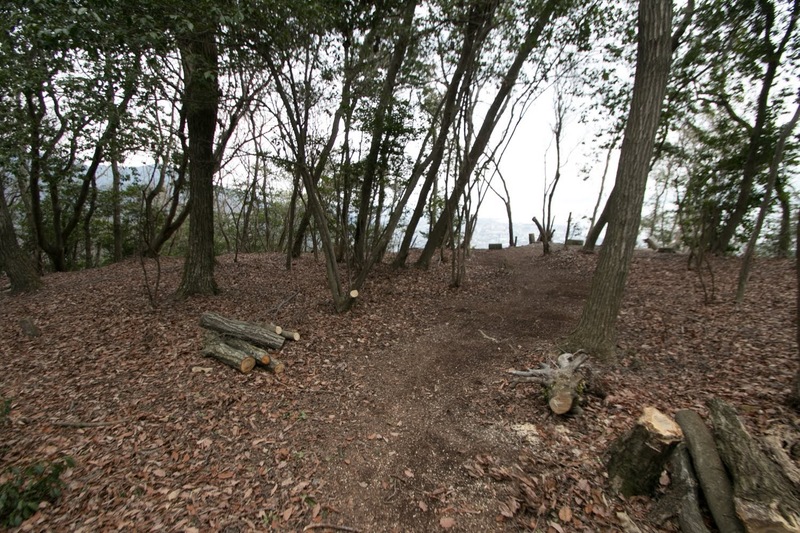 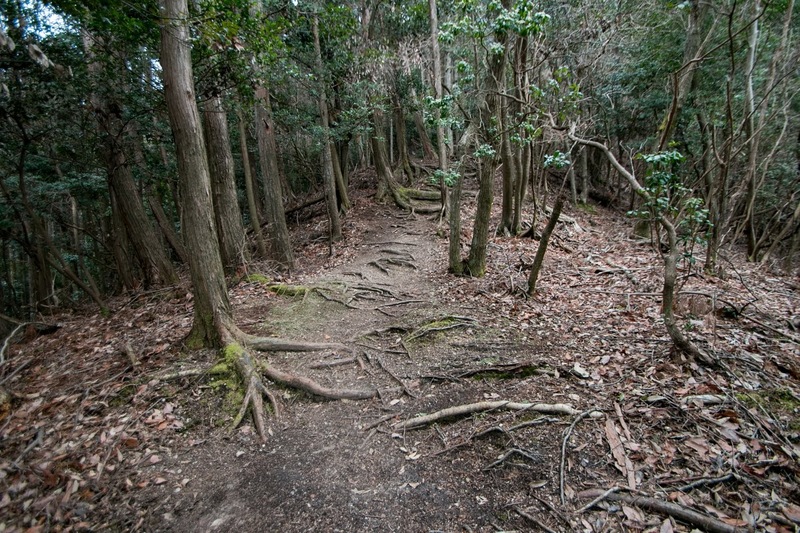 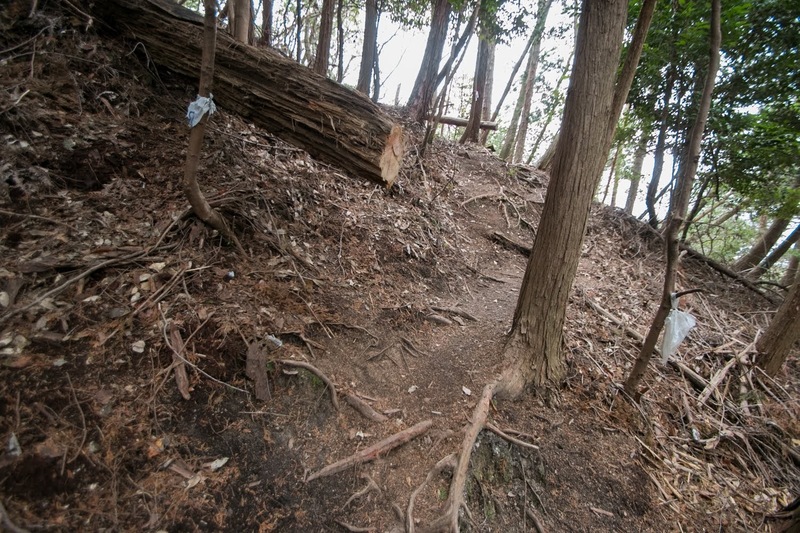 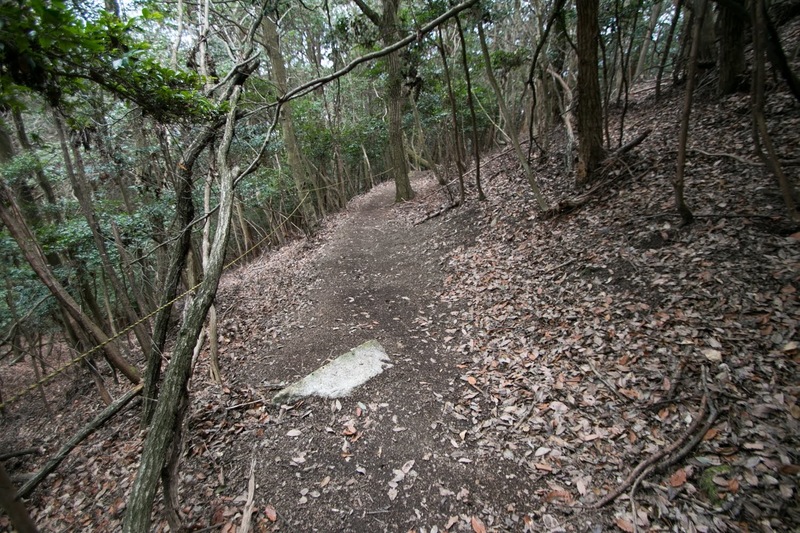 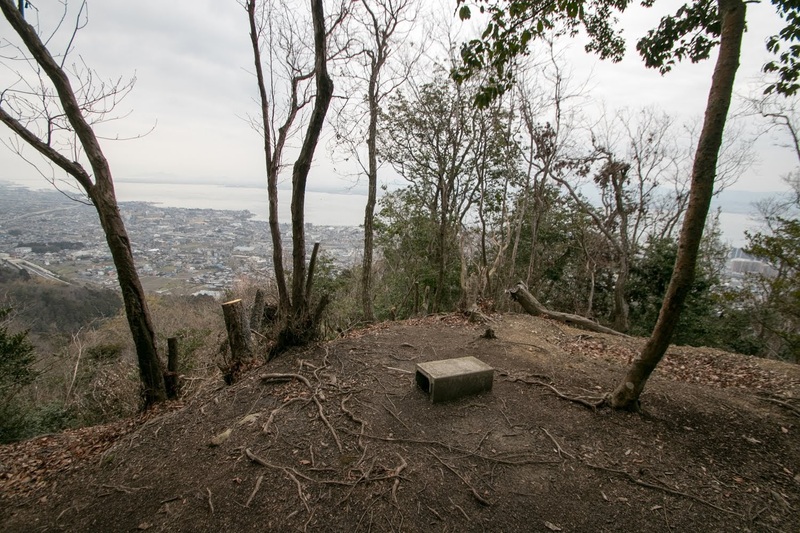 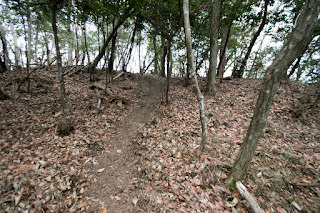 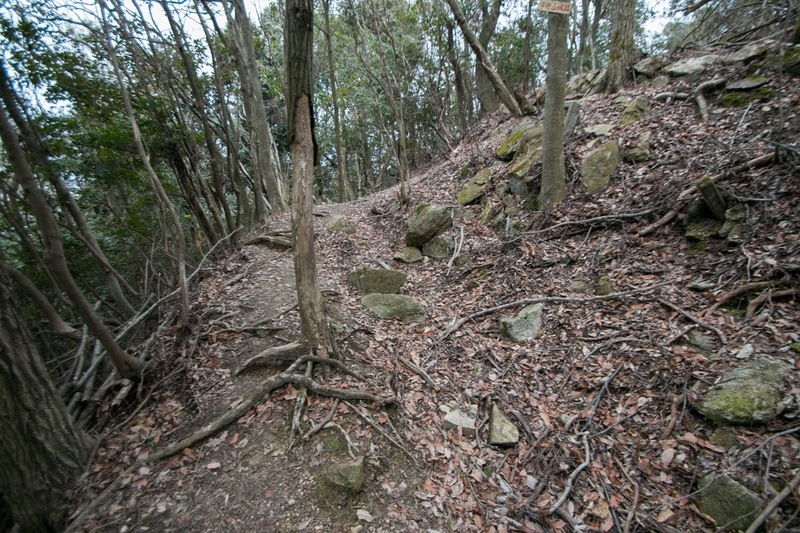 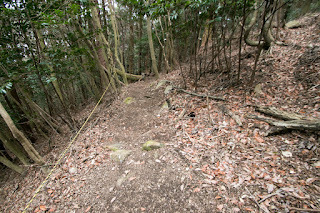 Usayama mountain stands next of narrow path of only 1 kilometer wide between the mountain and Lake Biwako, and its steep slope toward Lake Biwako gives good perspective looking down on the lake. 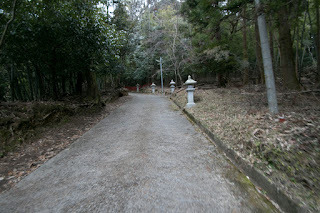 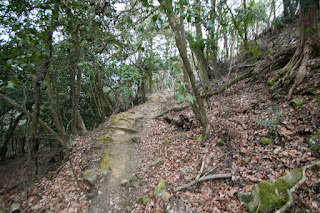 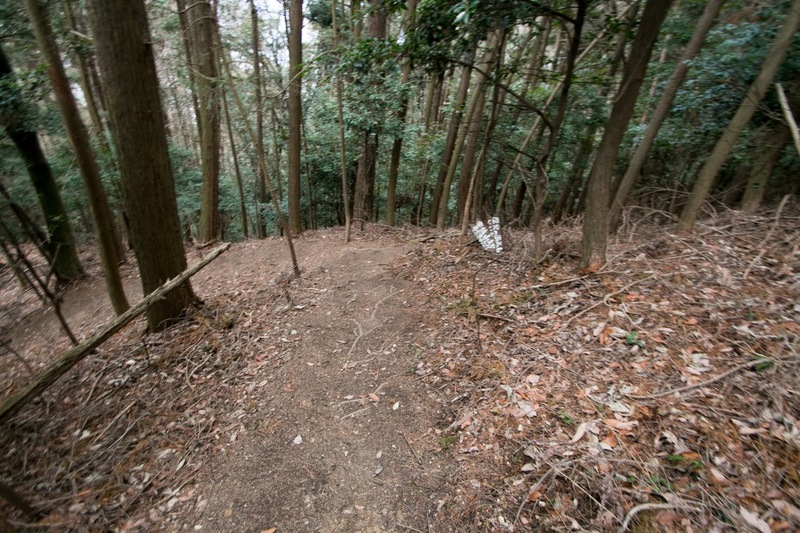 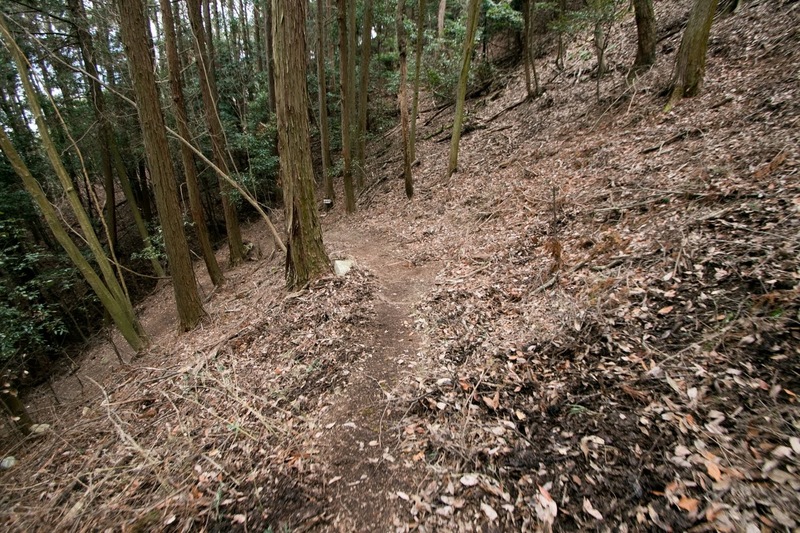 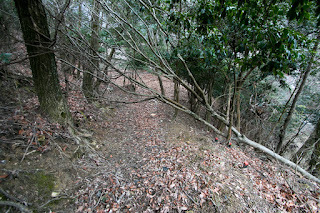 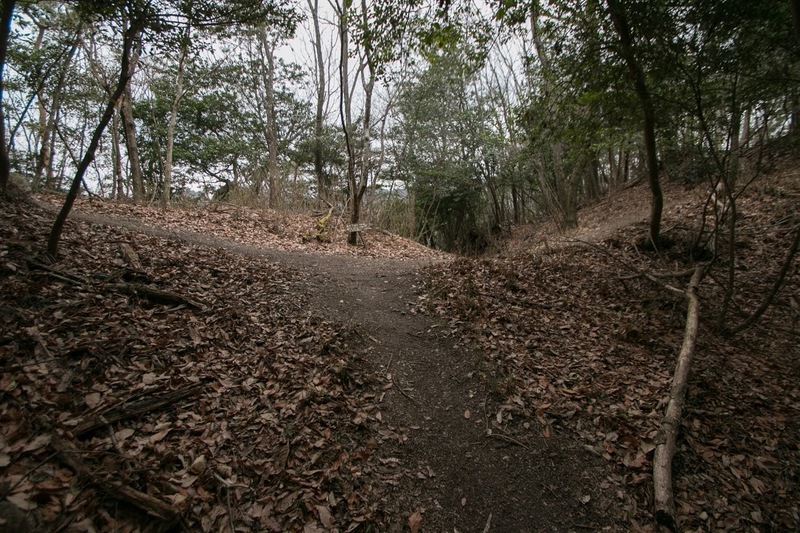 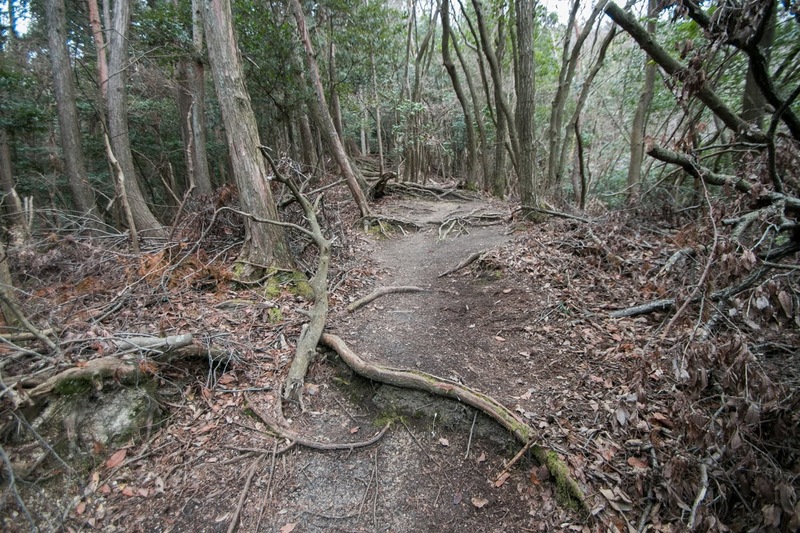 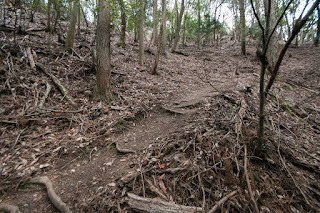 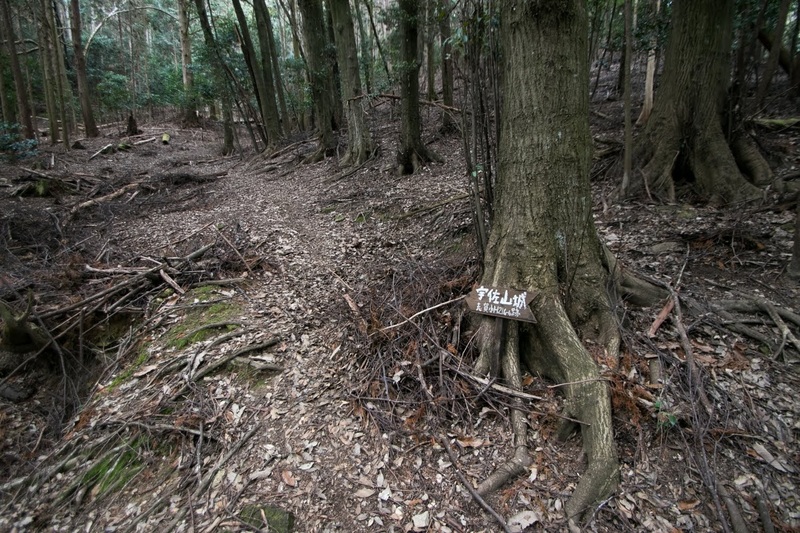 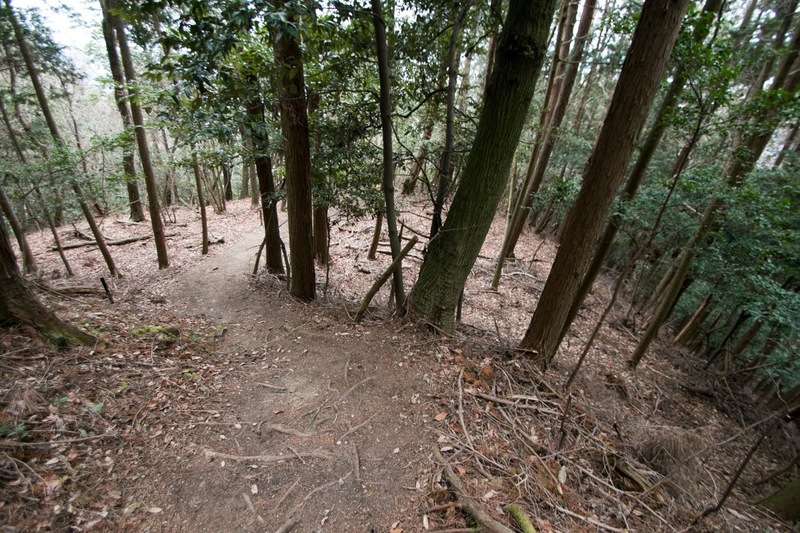 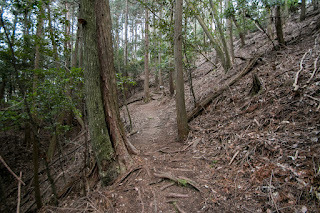 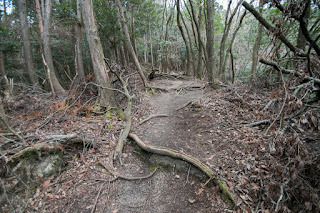 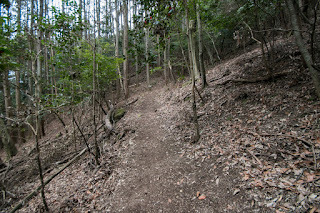 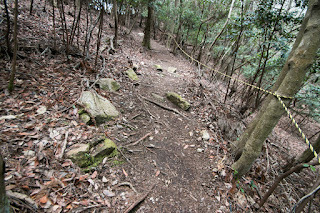 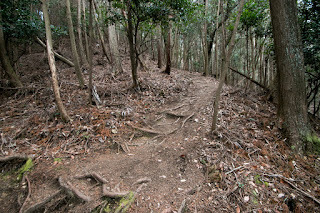 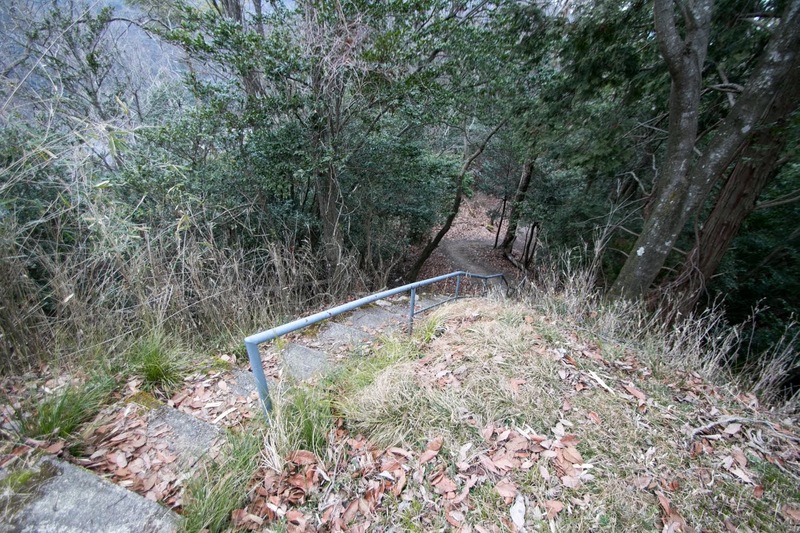 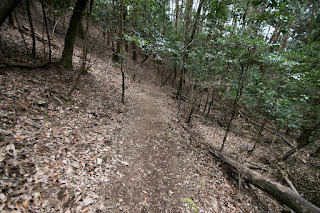 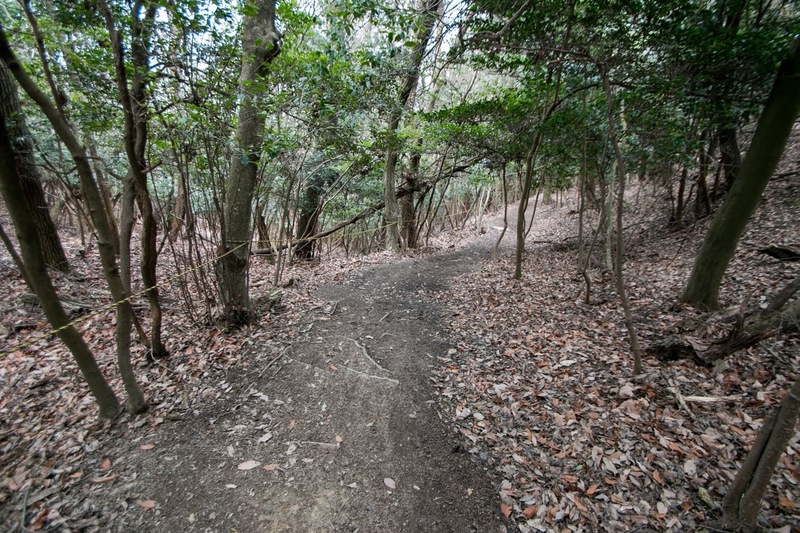 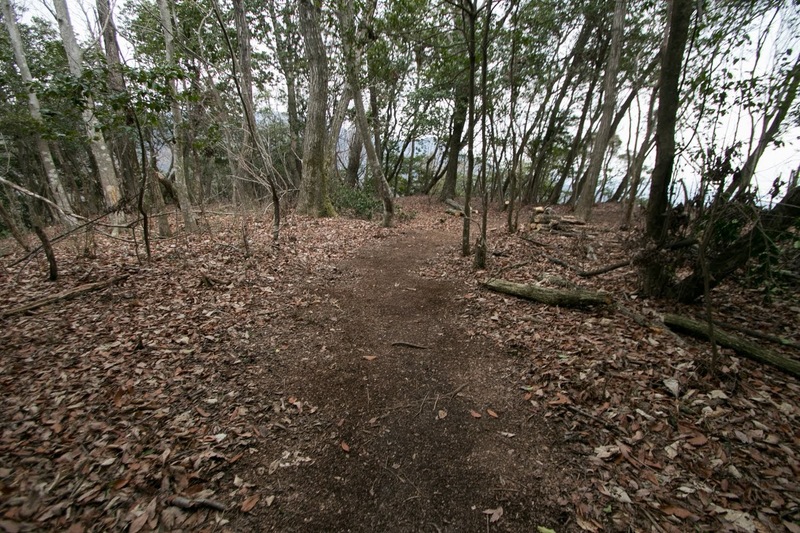 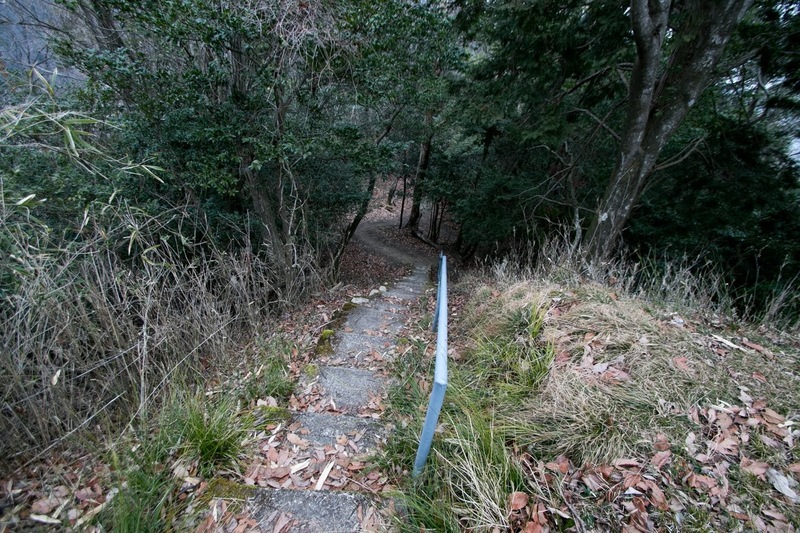 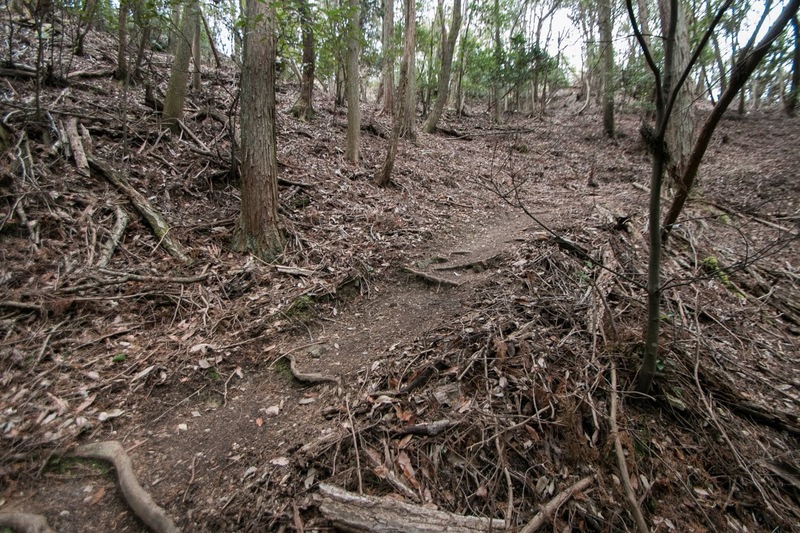 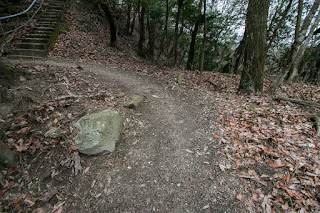 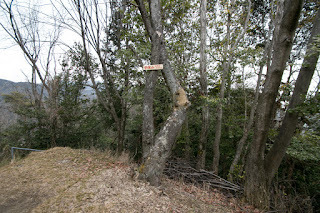 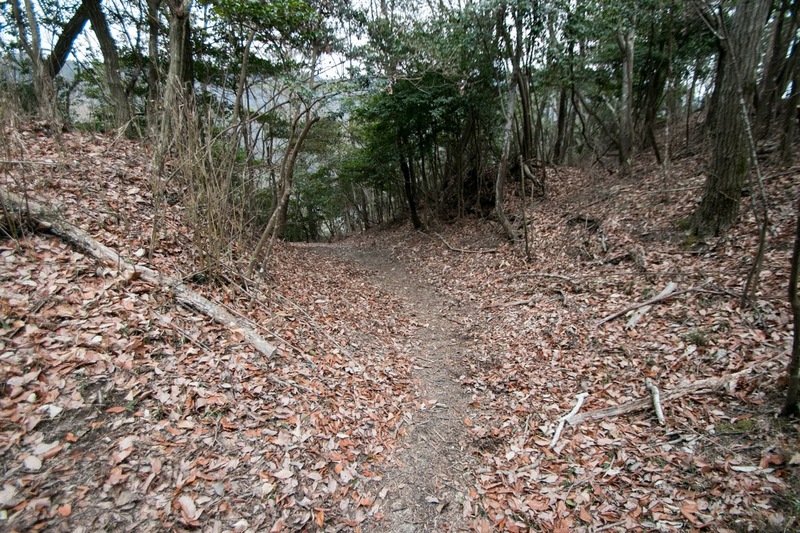 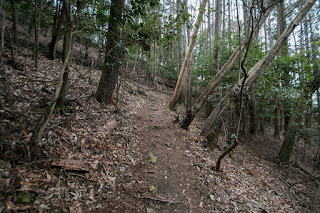 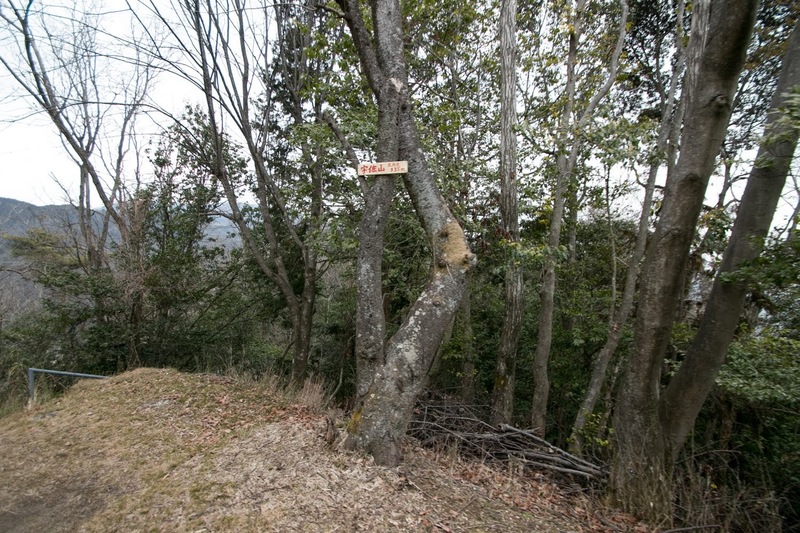 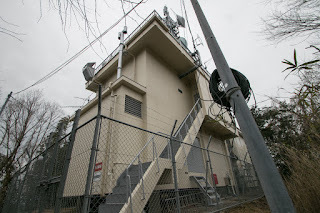 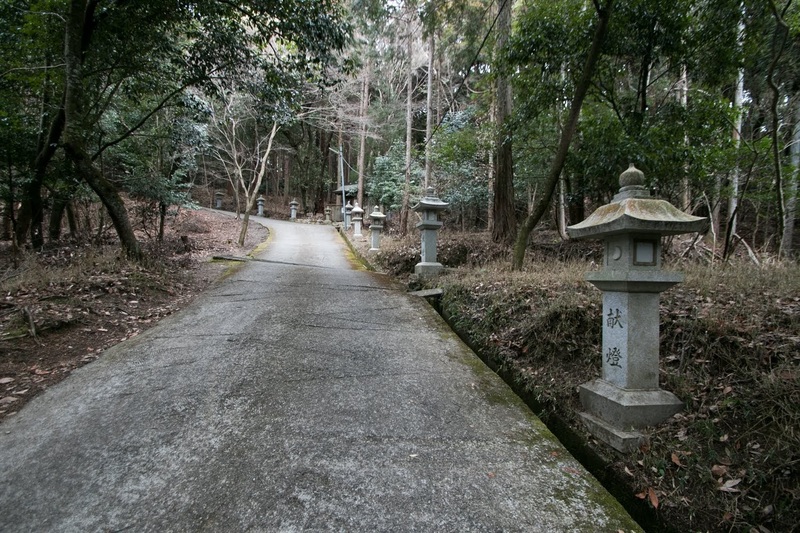 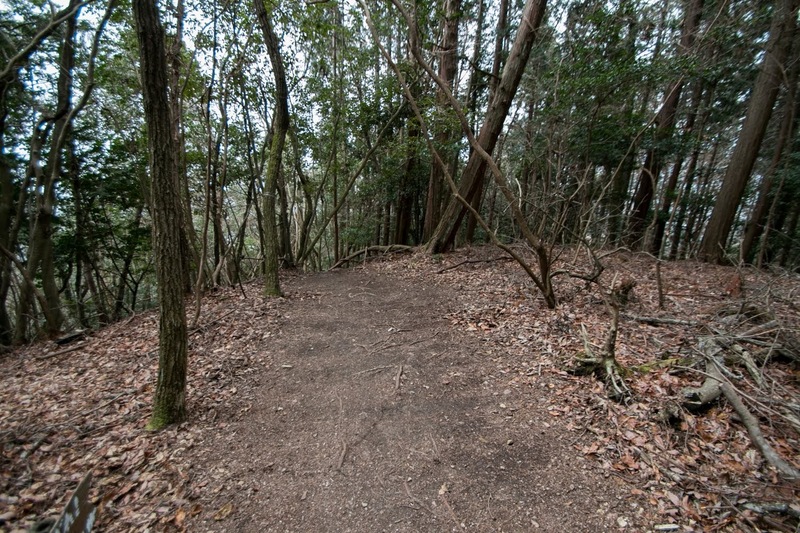 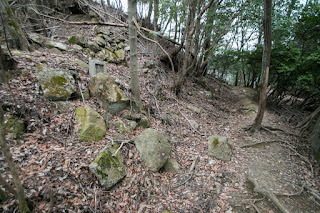 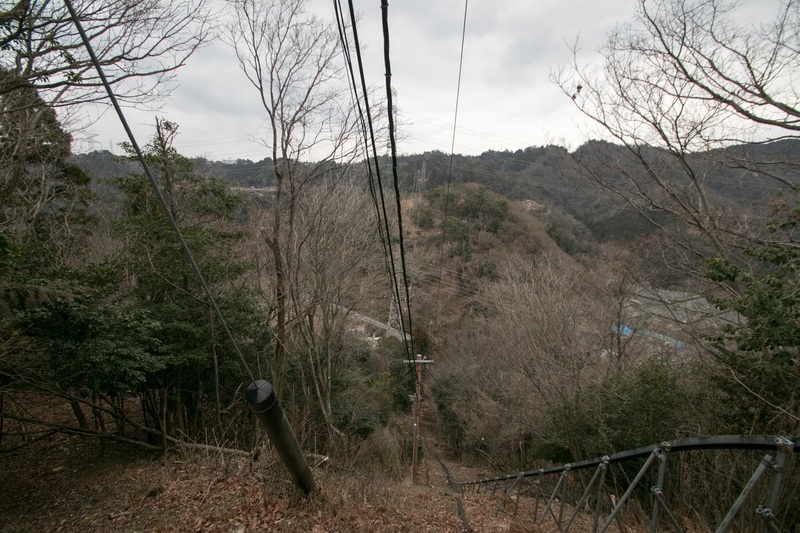 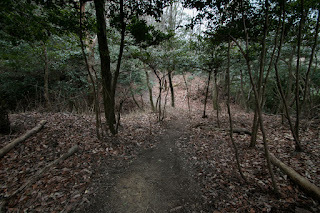 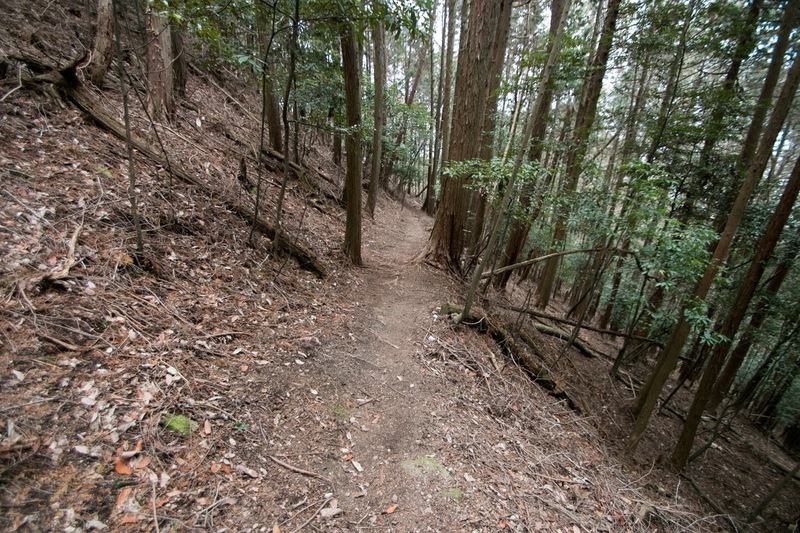 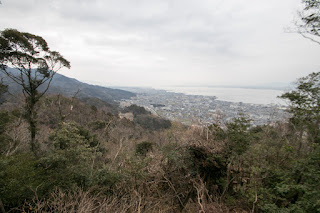 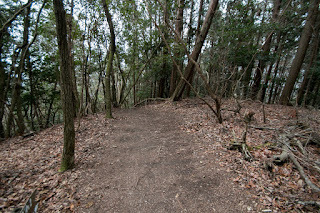 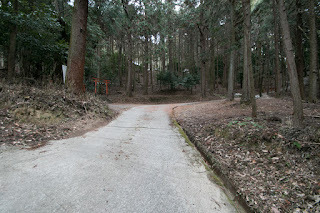 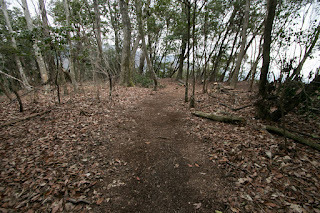 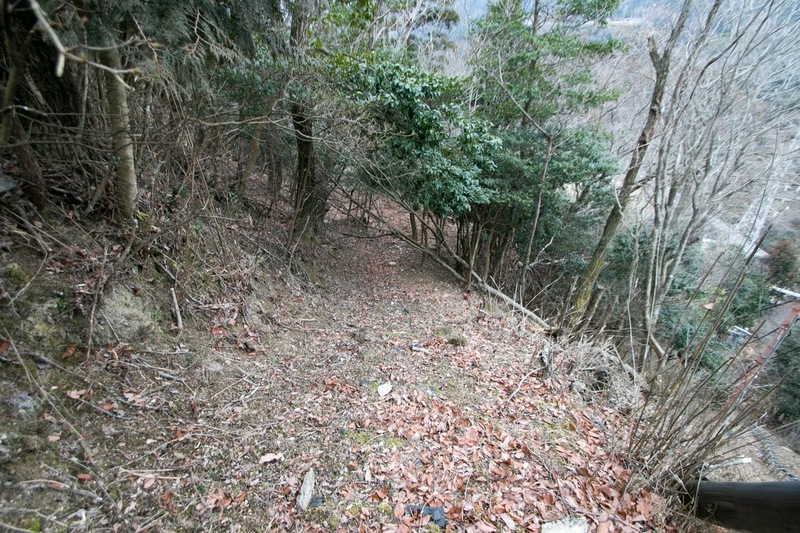 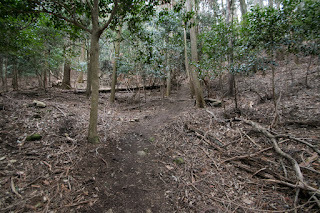 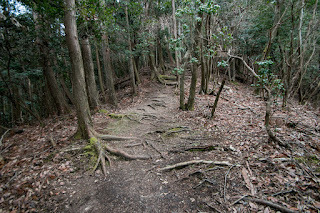 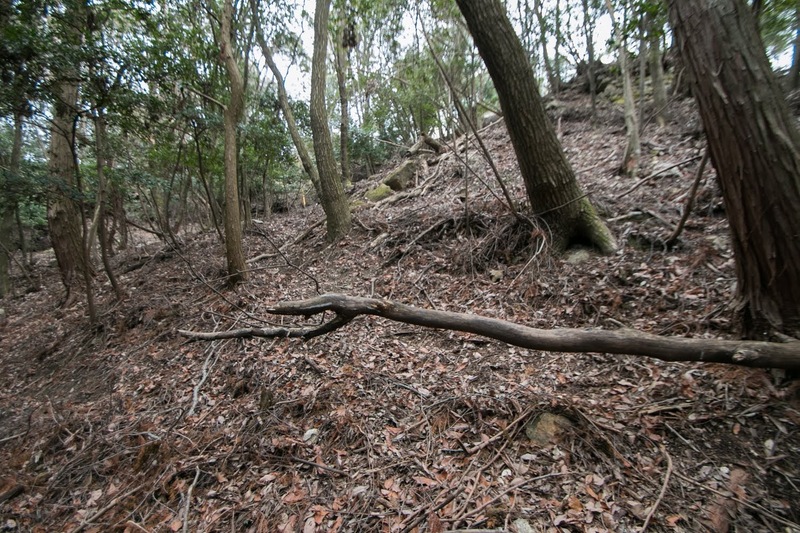 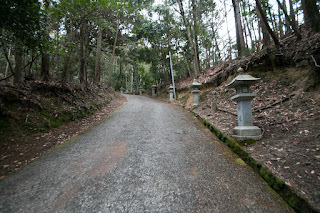 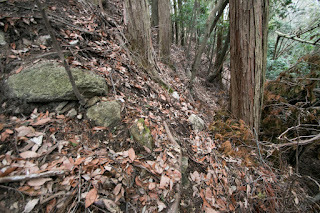 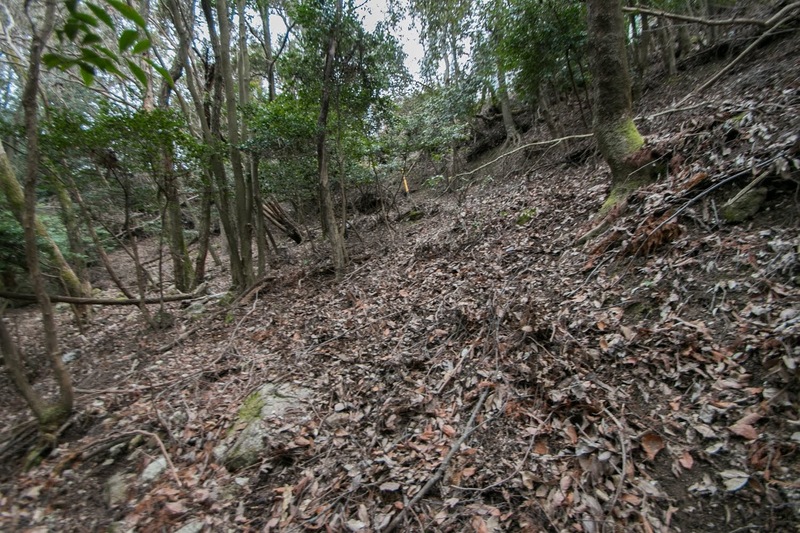 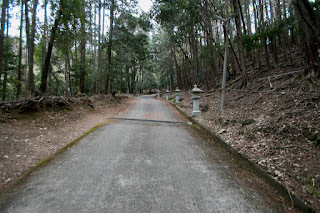 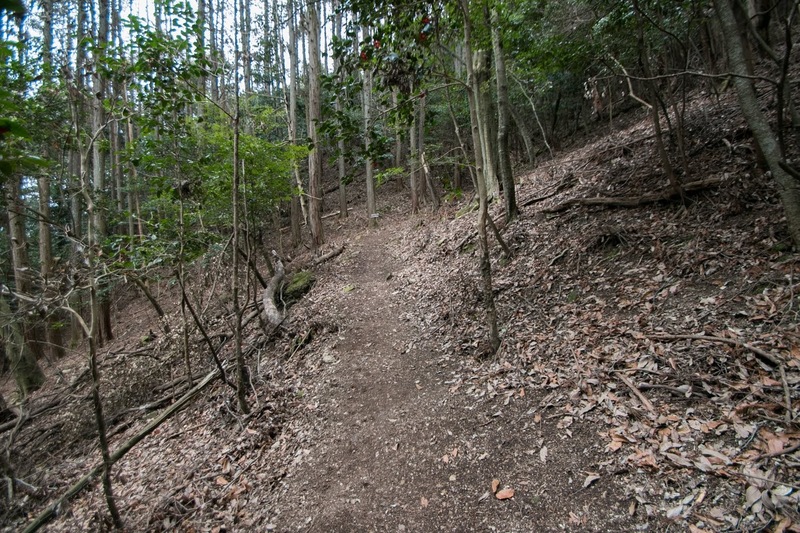 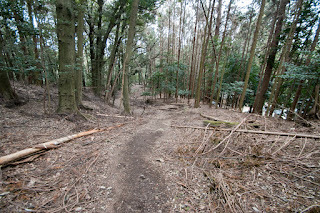 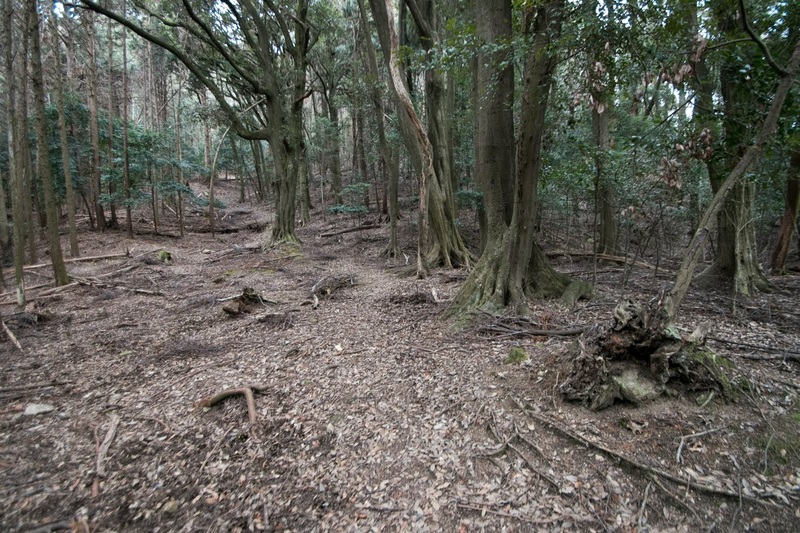 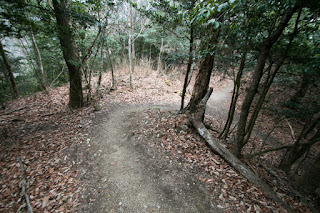 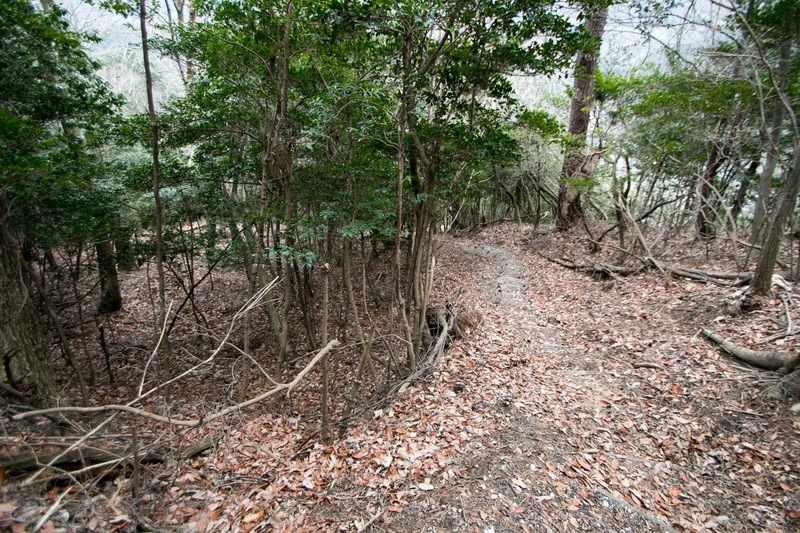 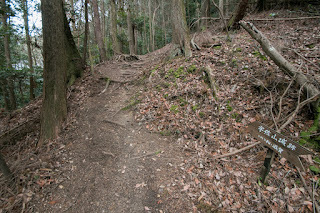 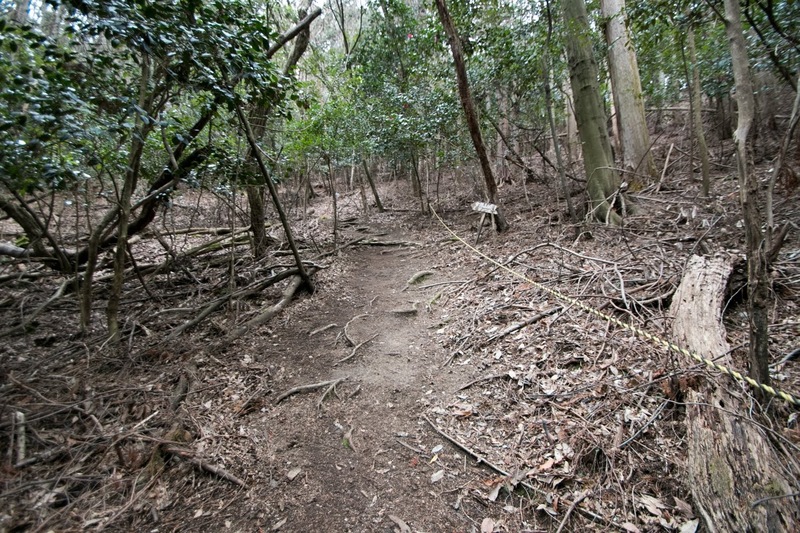 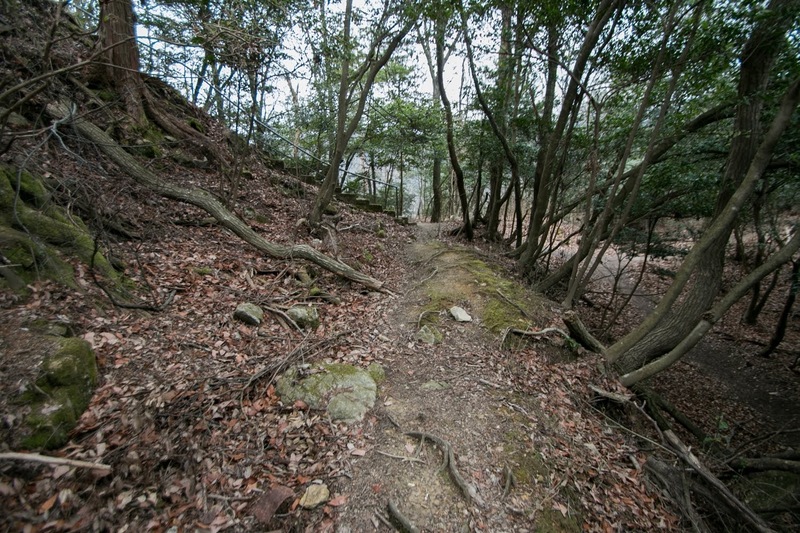 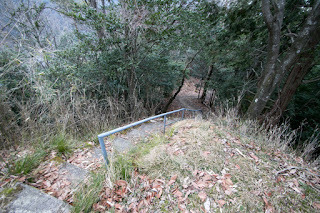 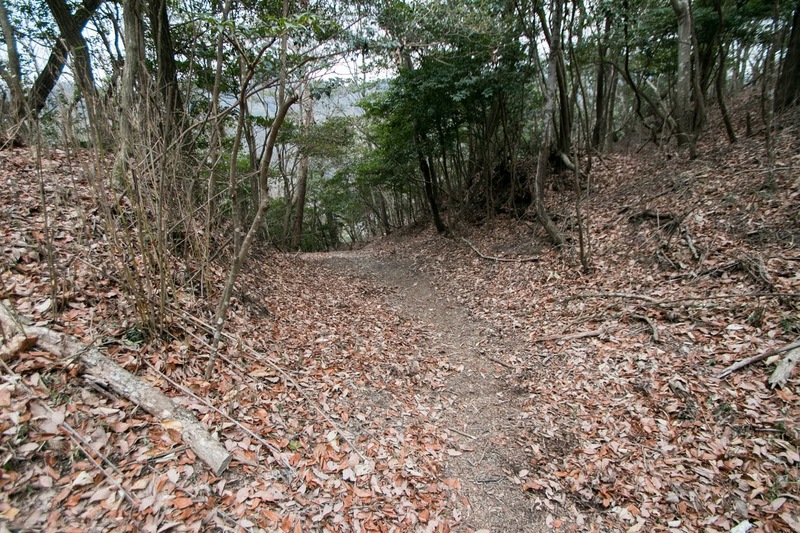 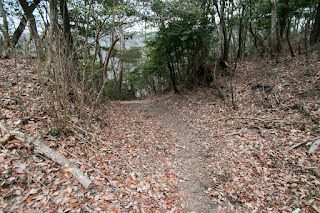 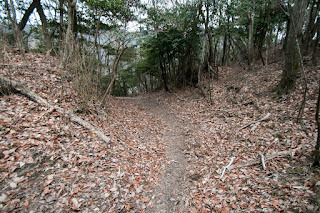 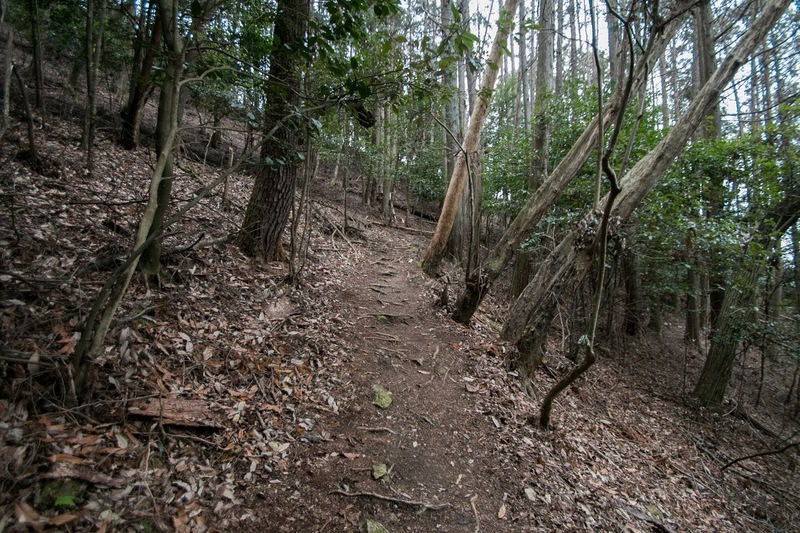 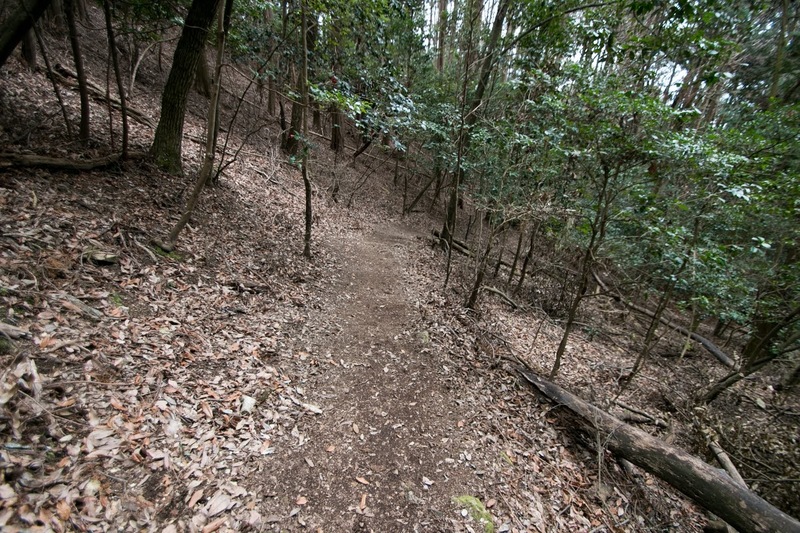 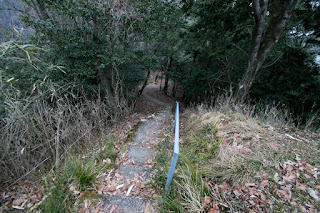 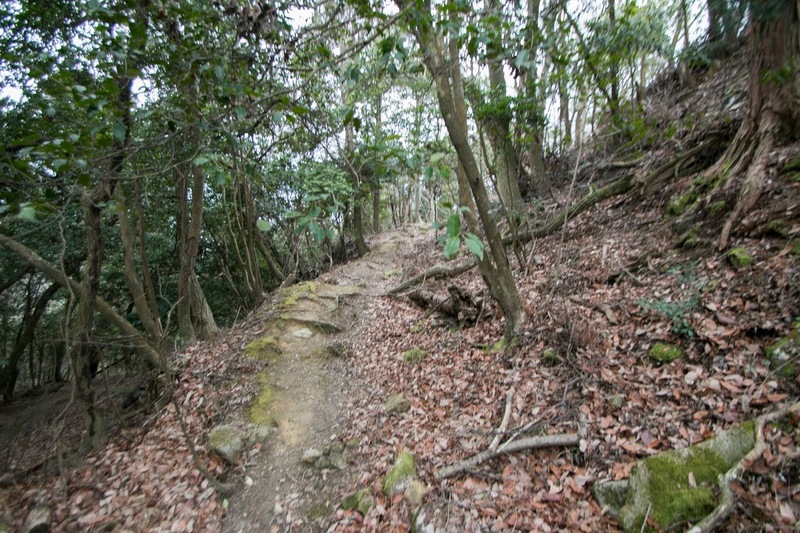 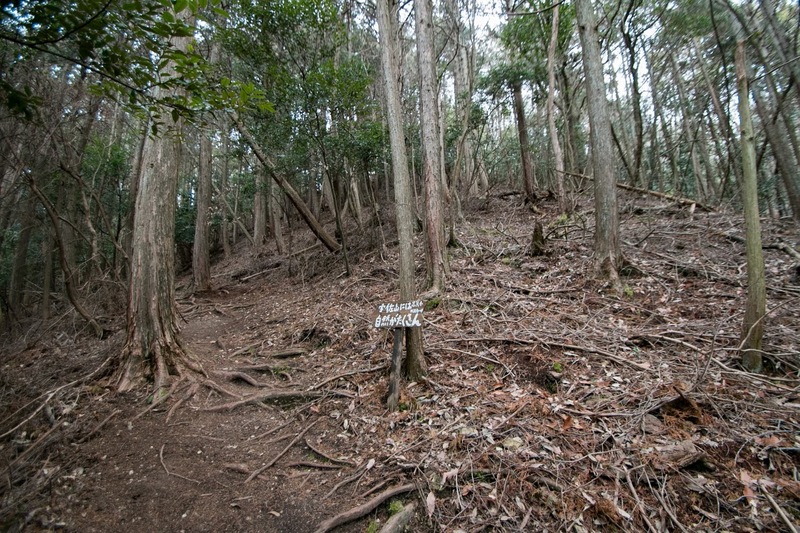 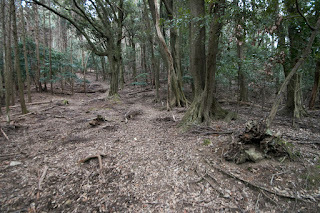 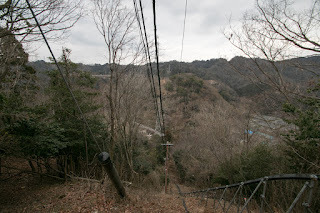 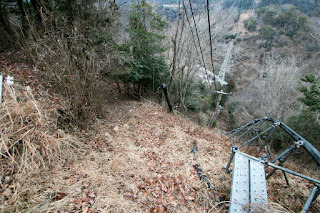 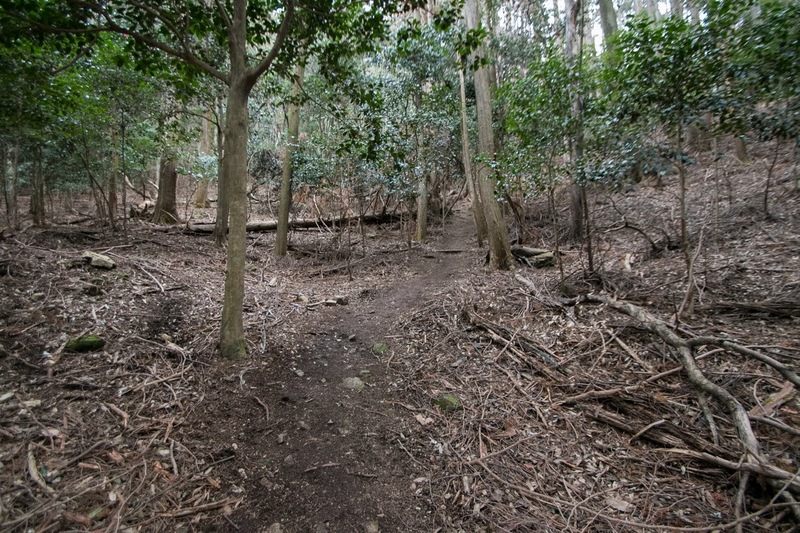 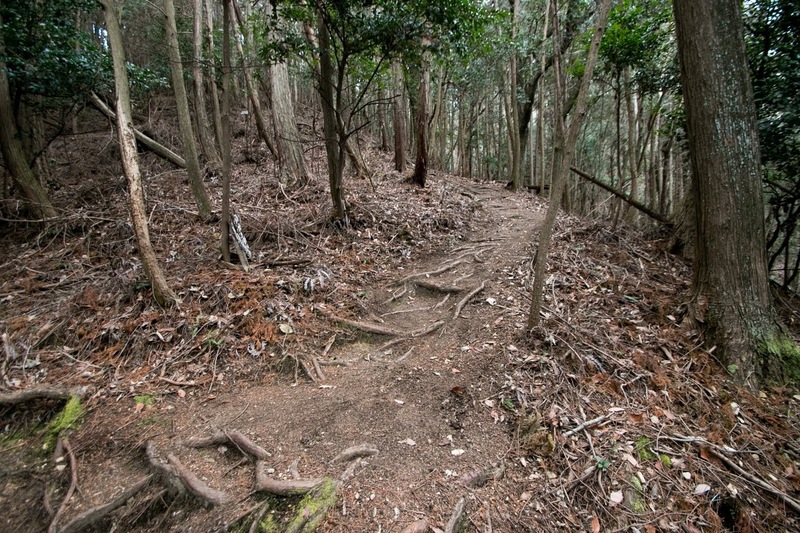 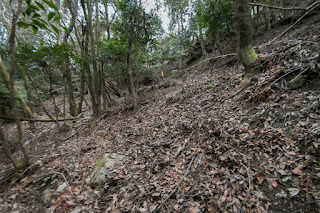 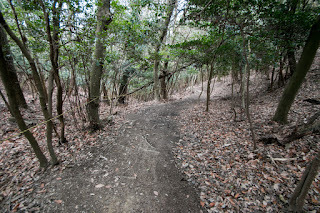 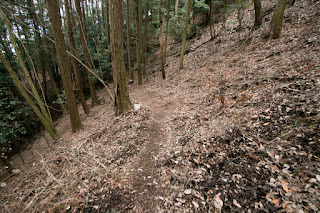 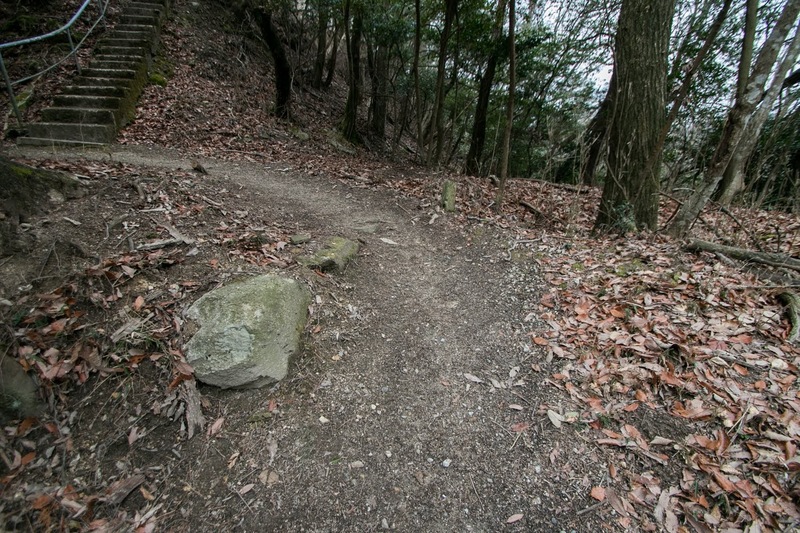 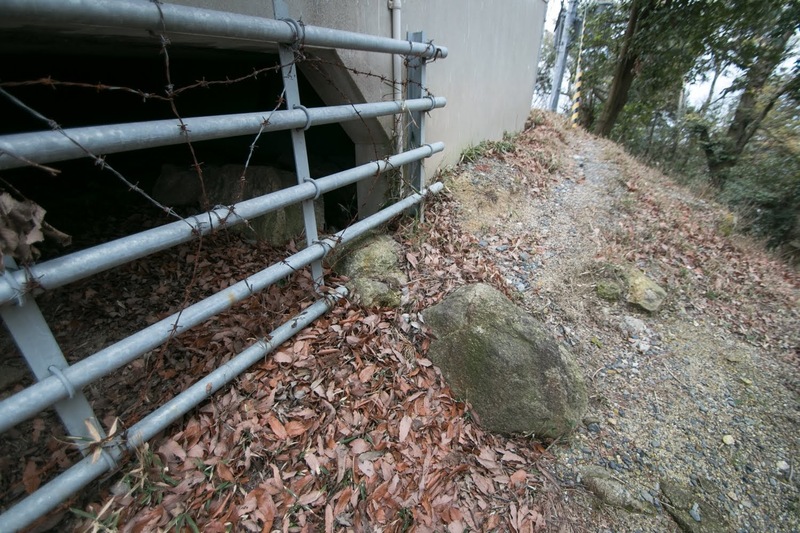 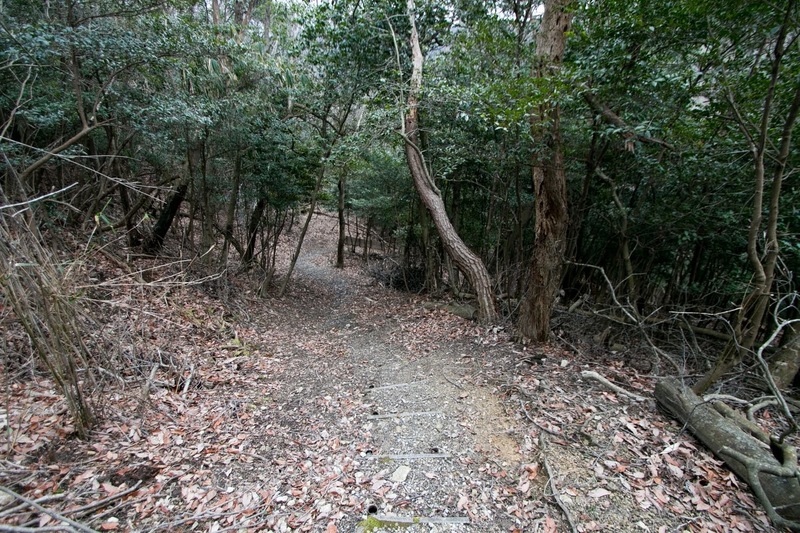 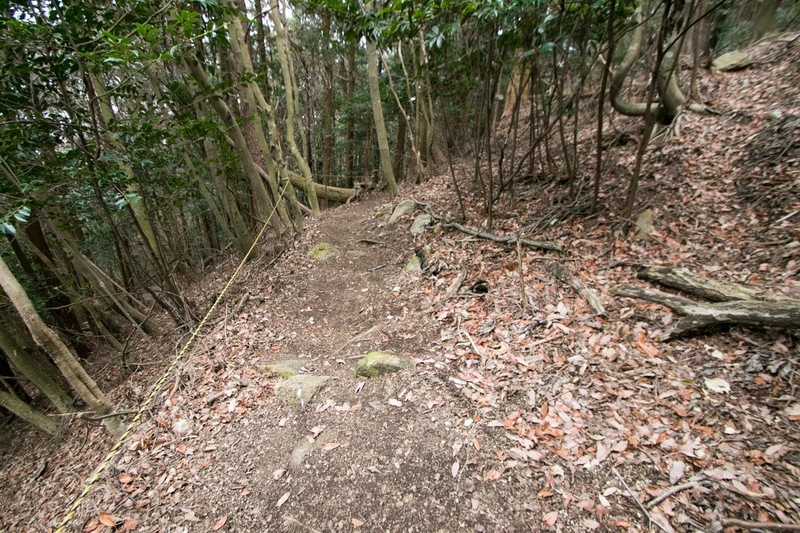 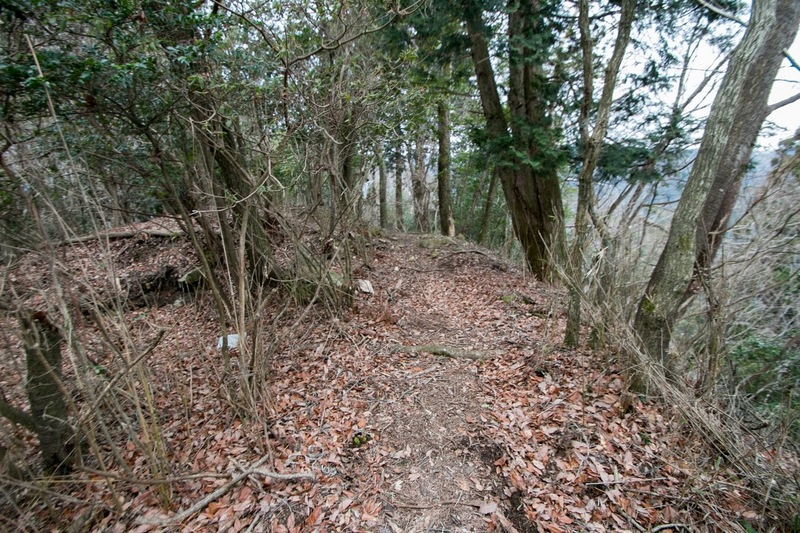 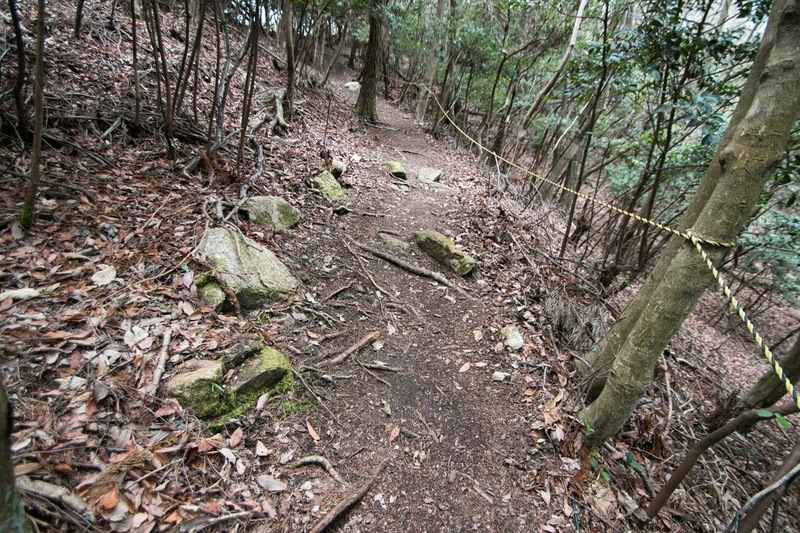 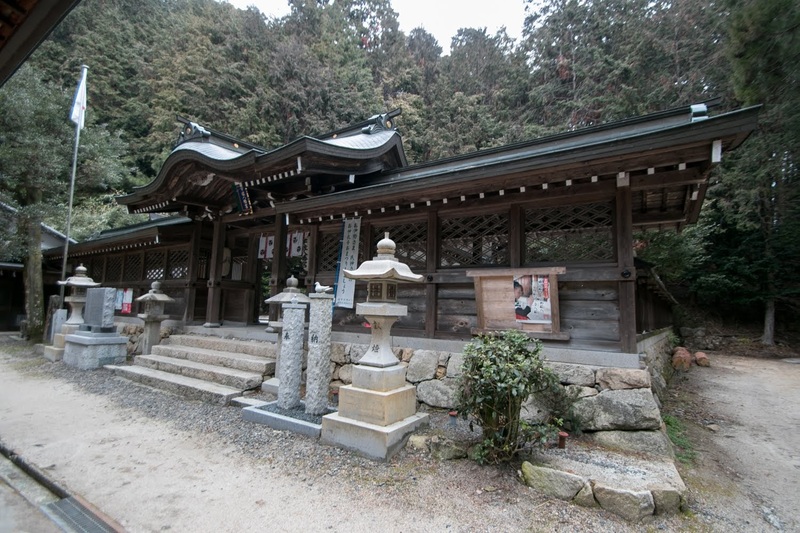 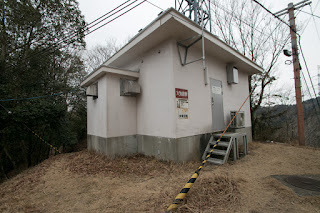 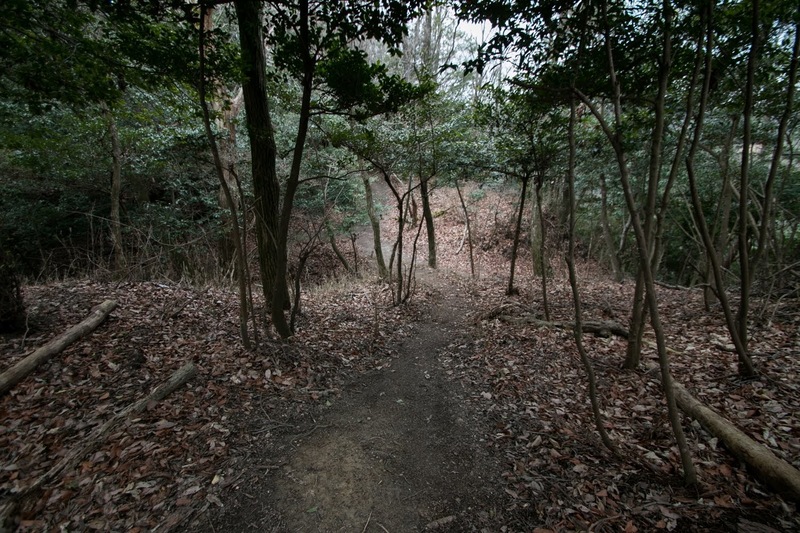 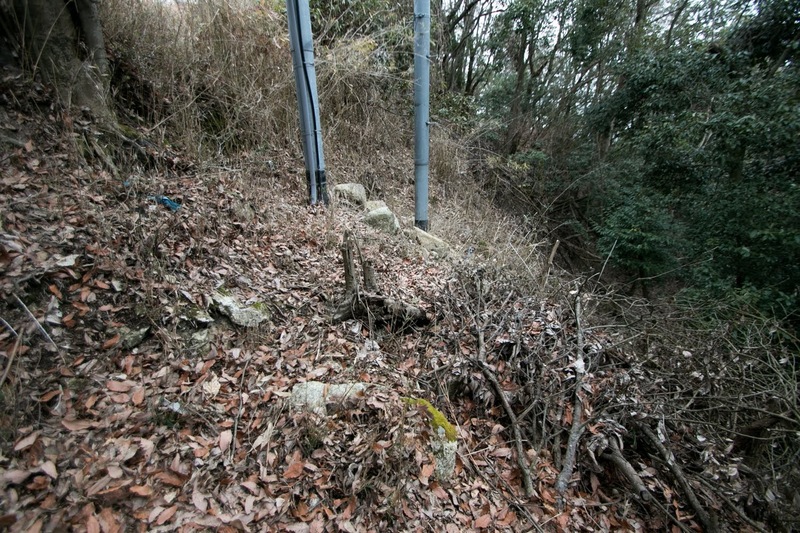 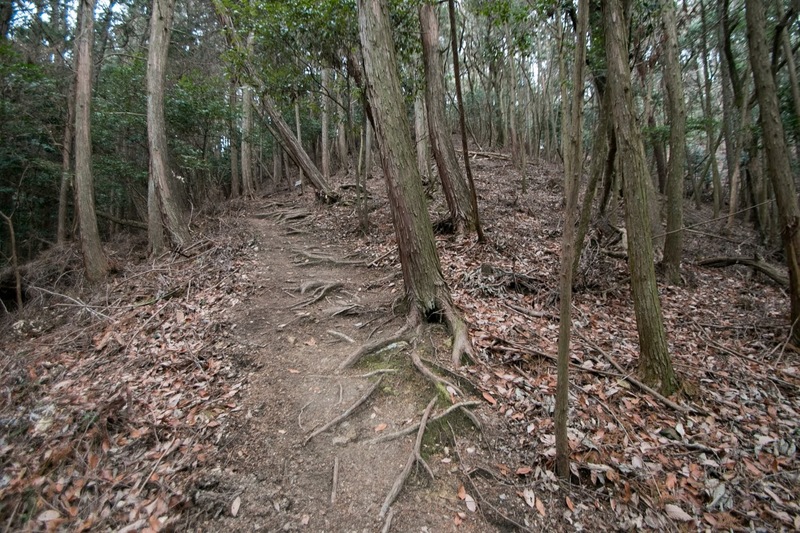 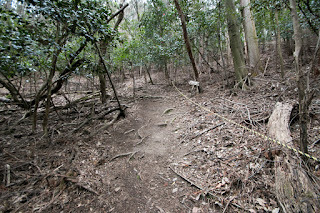 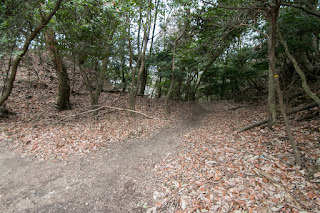 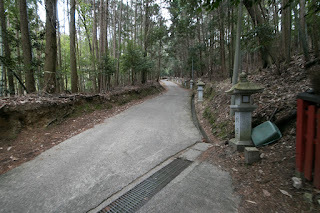 Furthermore, a mountainous by-pass road passes the valley between Usayama mountain and Hieizan mountain then crosses Tanoya-toge path, directly connects lakeside area and Kyoto city. 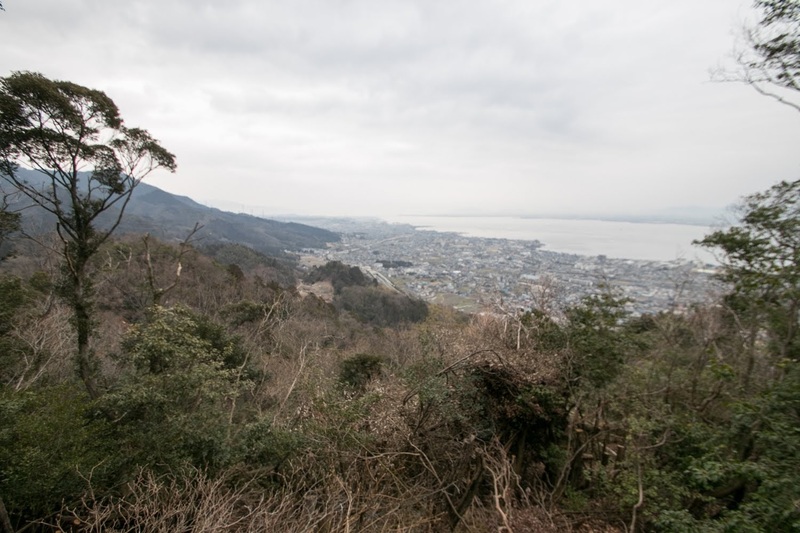 Because of this location, it is an ideal point to manage the lake side transportation from Kyoto city toward Hokuriku region via Otsu city. 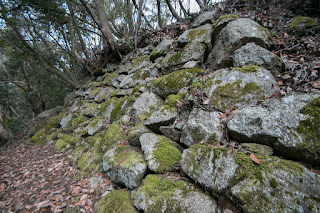 Usayama castle was built by central ruler Nobunaga Oda (1534-1582) in 1570, In 1568, Nobunaga Oda who was formerly a local warlord of Owari province (western part of Aichi prefecture), marched to Kyoto city with Yoshiaki Ashikaga (1537-1597), a younger brother of Yoshiteru Ashikaga (1536-1565) who was 13th Shogun of Muromachi Shogunate but was assassinated by Miyoshi clan and Matsunaga clan. 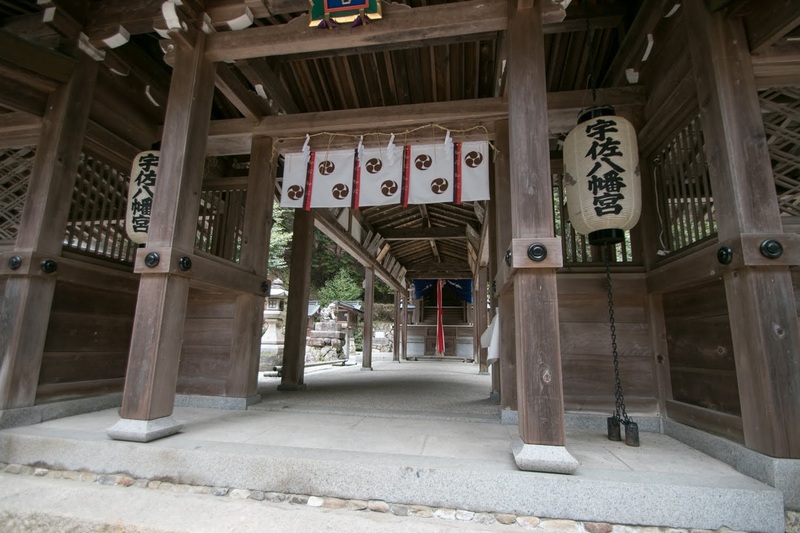 Nobunaga captured Kyoto city placed Yoshiaki Ashikaga as the 15th Shogun and substantially established his own government. 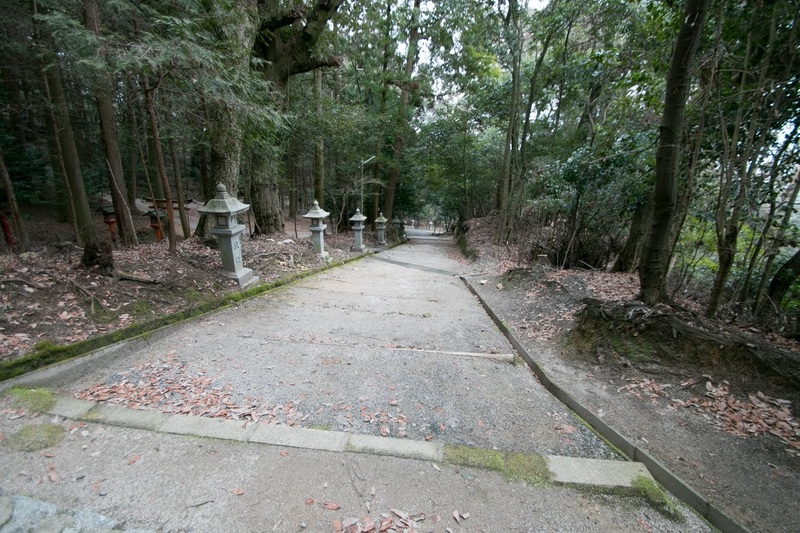 Soon Nobunaga planned to limit the authority of Yoshiaki, and Yoshiaki asked assistance for neighbor warlords, such as Asakura clan at Echizen province (Fukui prefecture), Enryakuji temple at Hieizan mountain or Ikko Ikki army at Ishiyama Honganji temple built at the place of current Osaka castle. 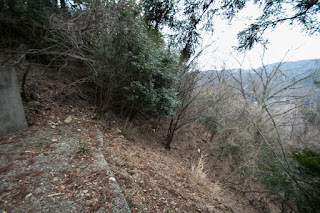 In 1570, Nobunaga ordered Asakura clan to visit Kyoto city, but Asakura clan refused it. 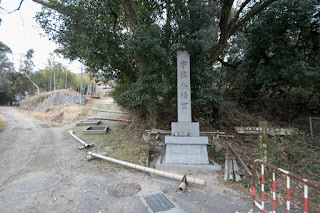 Nobunaga lead large army and marched to Echizen province, but Nagamasa Azai (1545-1573), a younger brother in law of Nobunaga but also had an obligation to Asakura clan, left Nobunaga and tried to assault Oda army from backside. 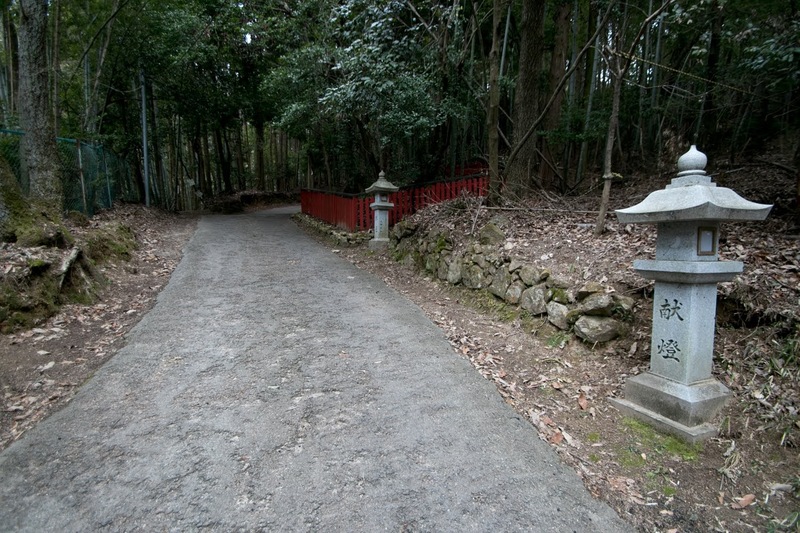 Nobunaga barely returned from Echizen province to Kyoto city, then total war of Nobunaga against Asakura and Azai army started. 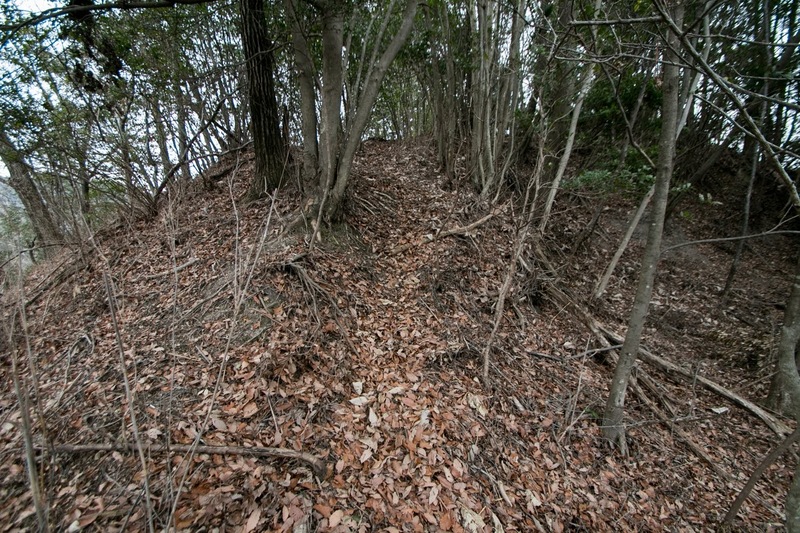 At this time Nobunaga built Usayama castle to prevent intrusion of Asakura army from Echizen province via western lakeside of Lake Biwako. 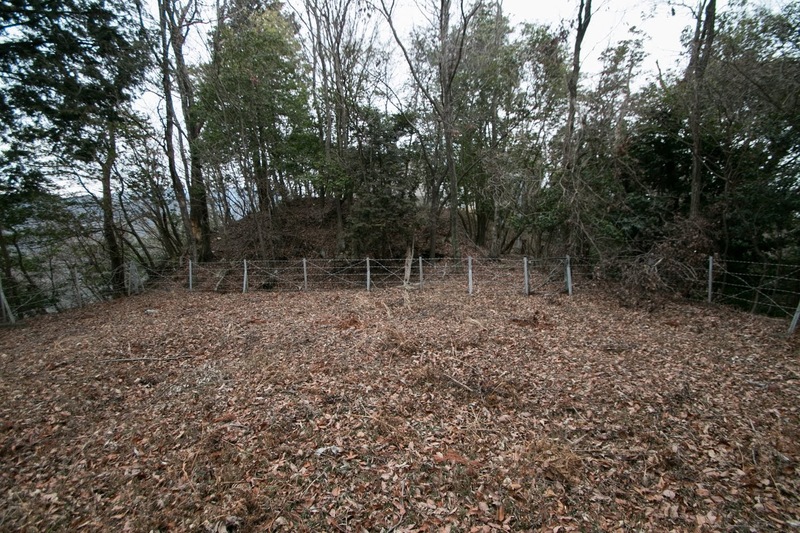 Considering the importance of Usayama castle to protect Kyoto city, Nobunaga used his latest technology, then Usayama castle became the first generation of Shokuho-Kei style castle. 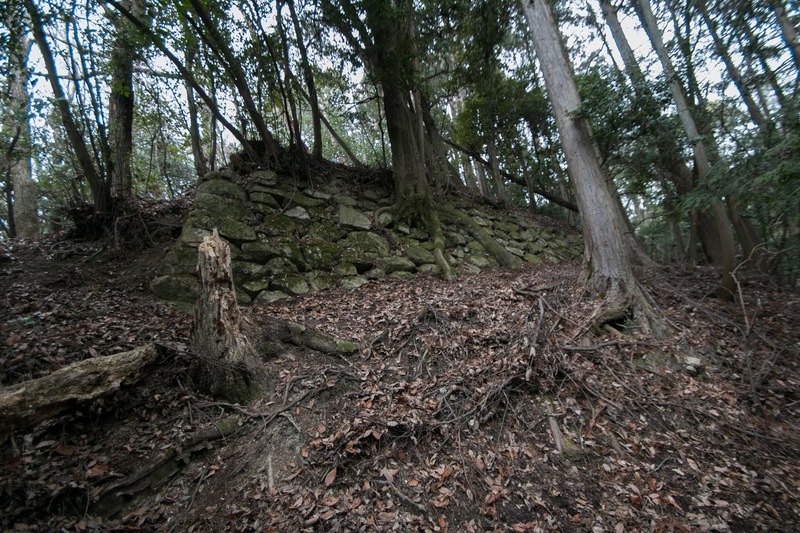 Shokuho-Kei castle means Oda and Toyotomi style, which element mainly consist of usage of tall stone walls, building built on corner stones and paved by roofing blocks, compared with medieval castle which had clay walls, shanties direct built on ground and paved by straws. 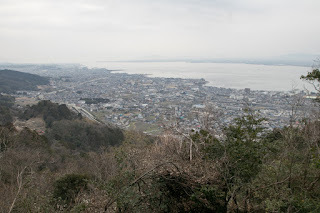 Seen at famous Himeji castle (Hyogo prefecture), the beauty of modern Japanese castle is known for the contrast of black roofing tile and white wall built over beautiful curved tall stone walls. 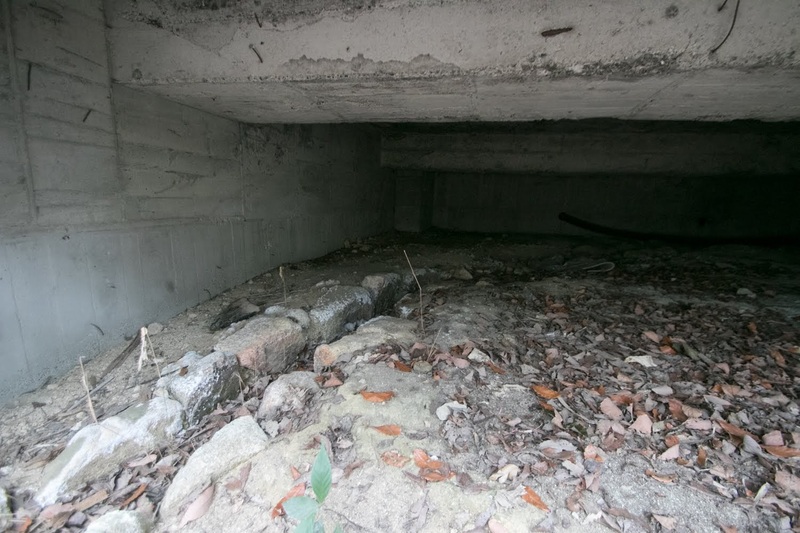 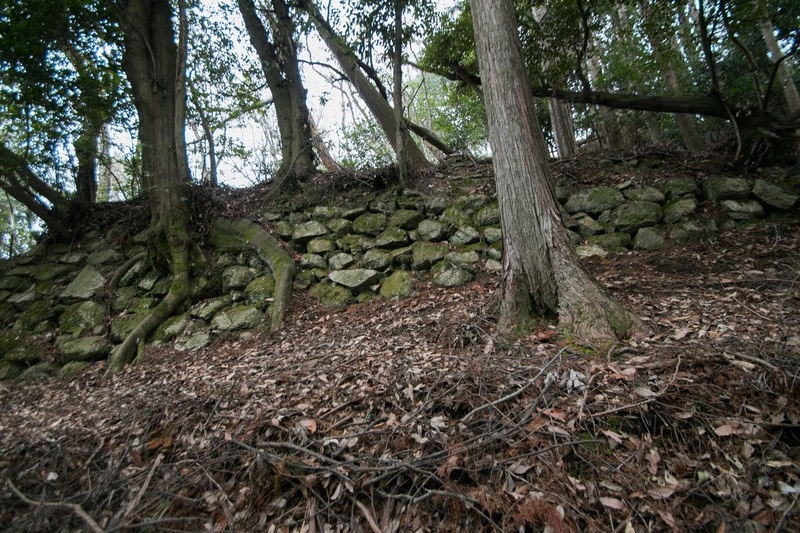 Of course these structures were originally built for military purpose, which prevents attack of the enemy by tall and sheer stone walls and make gunfire from inside of buildings securely protected by thick clay walls and roofing tiles built over cornerstones. 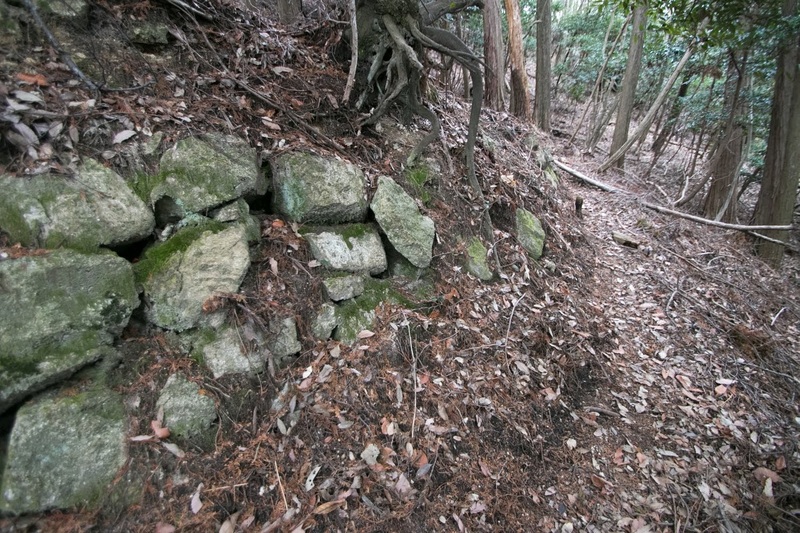 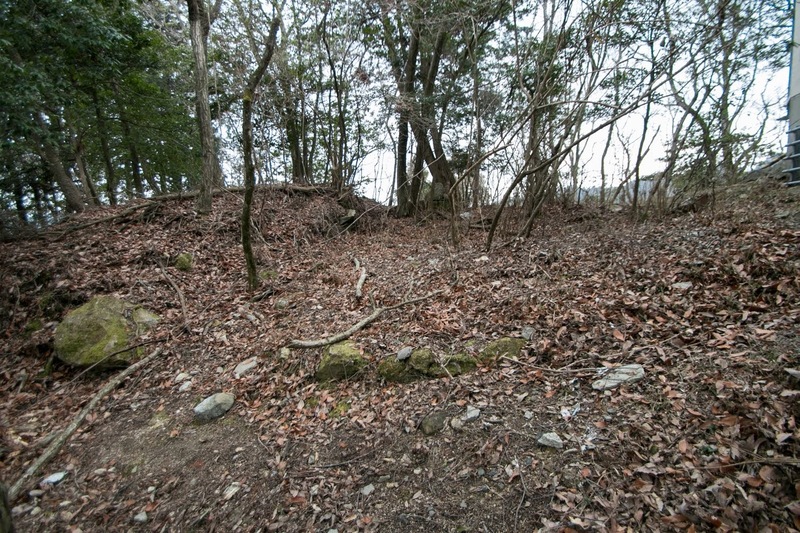 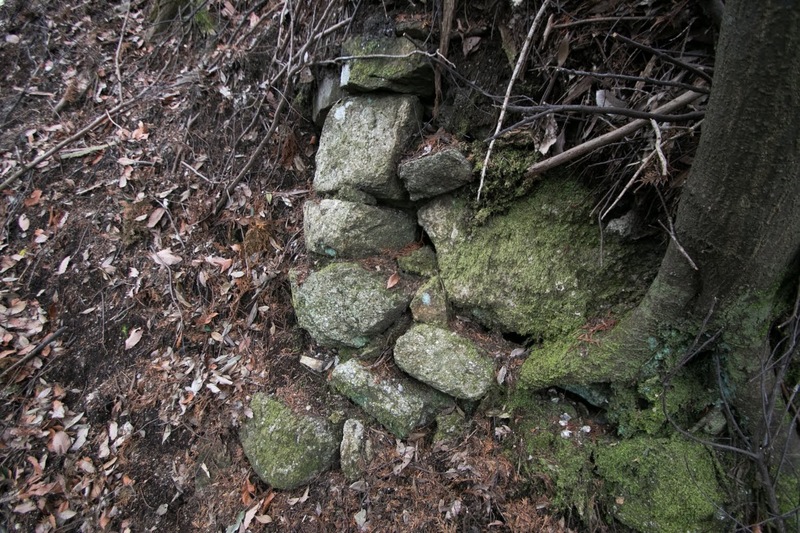 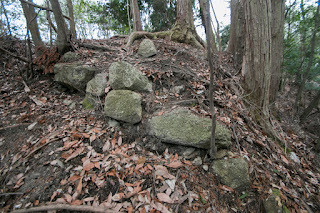 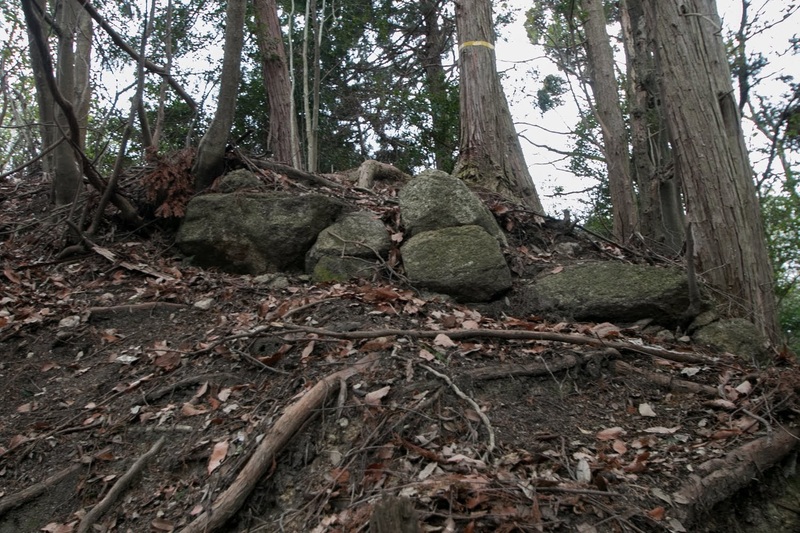 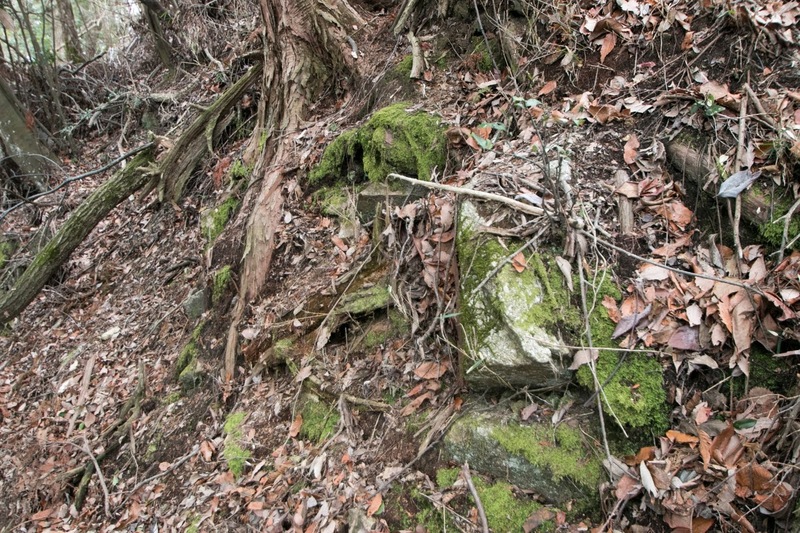 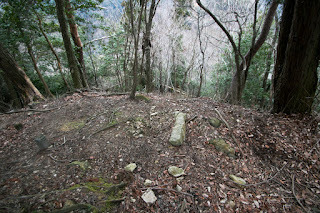 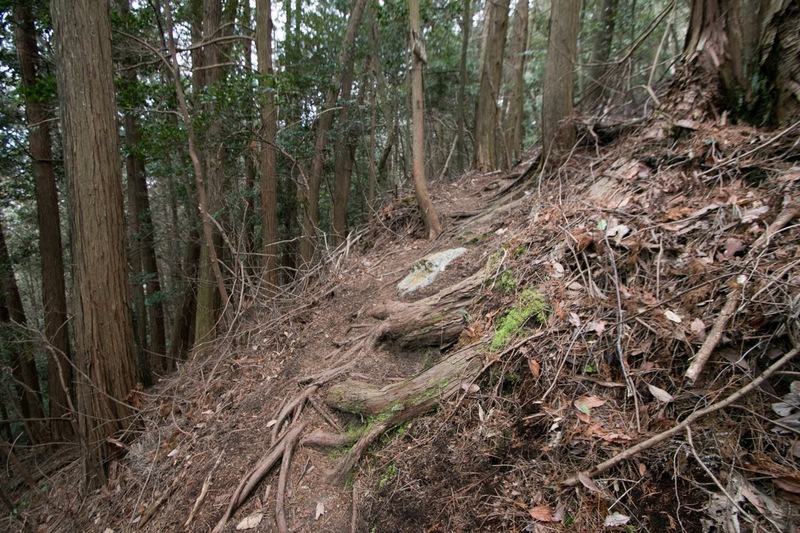 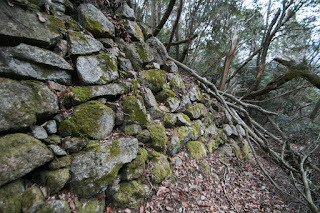 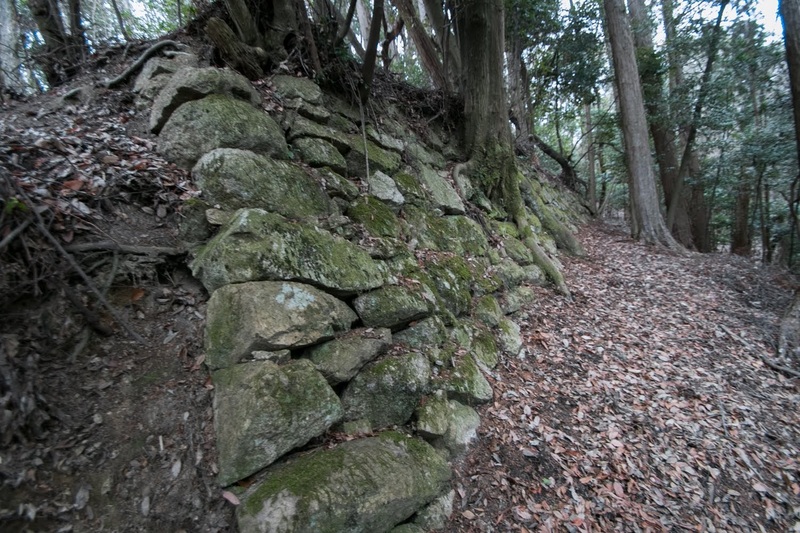 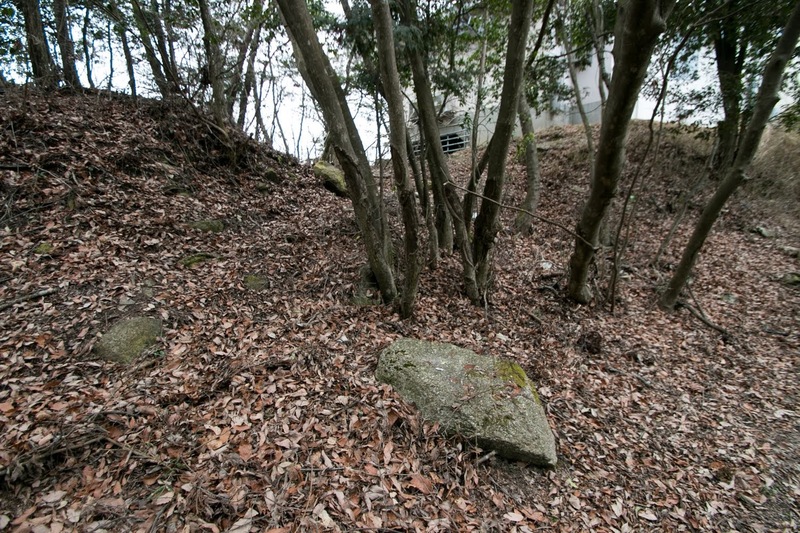 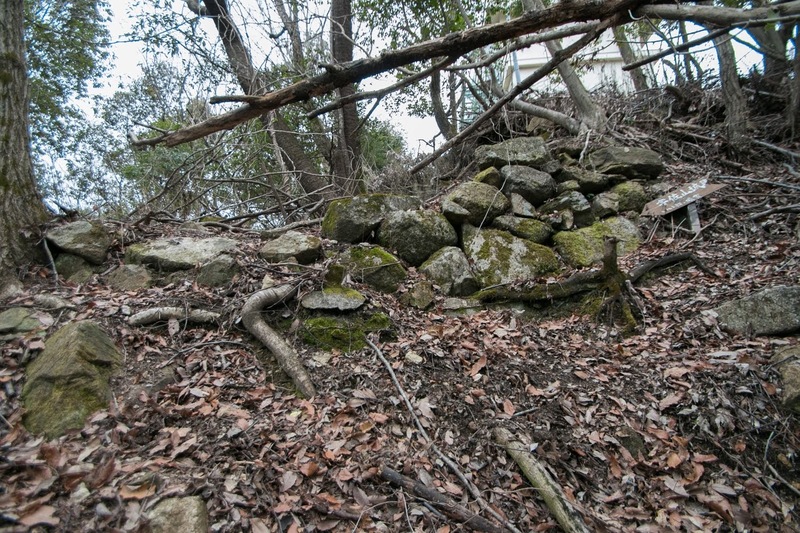 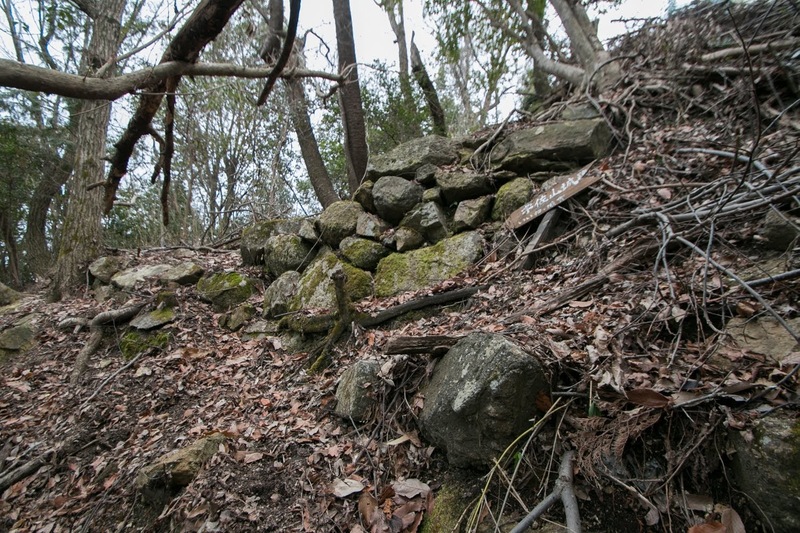 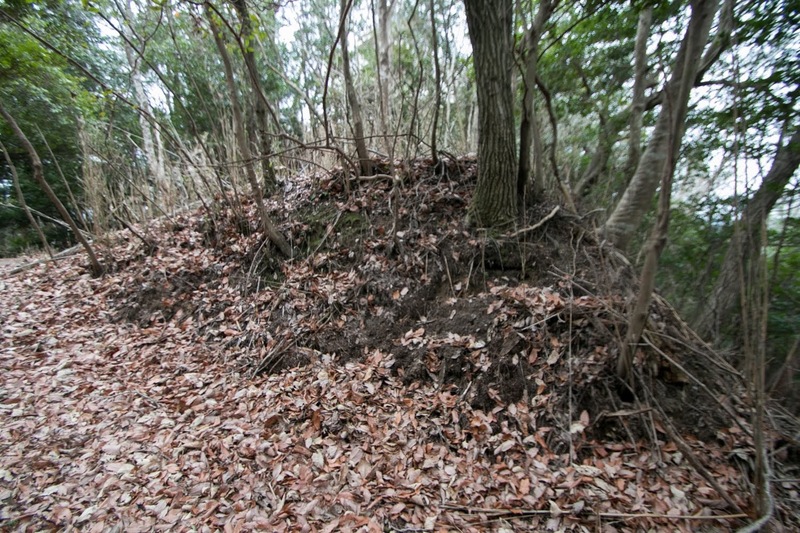 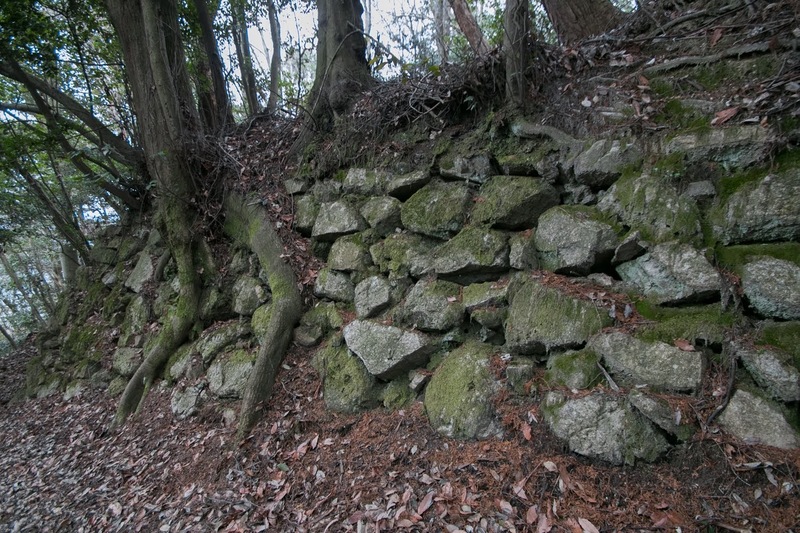 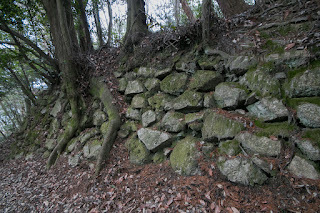 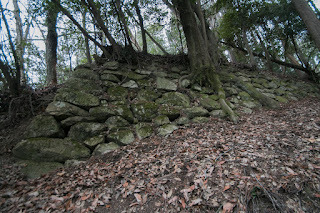 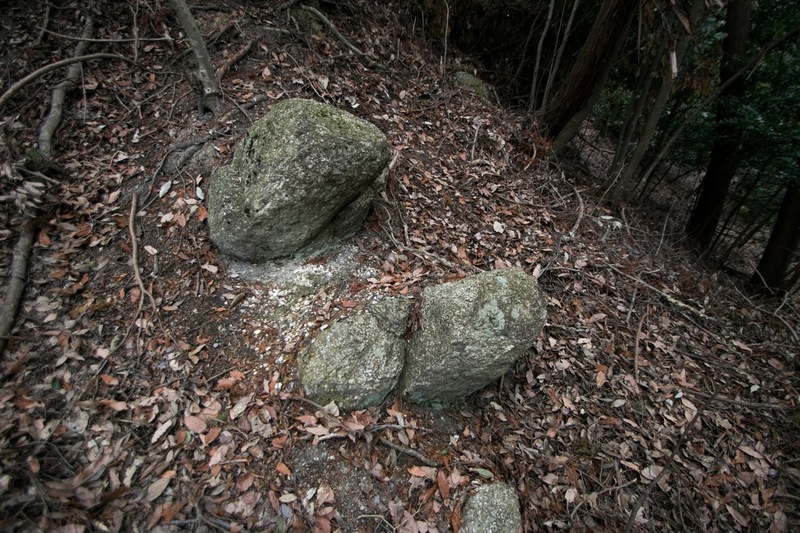 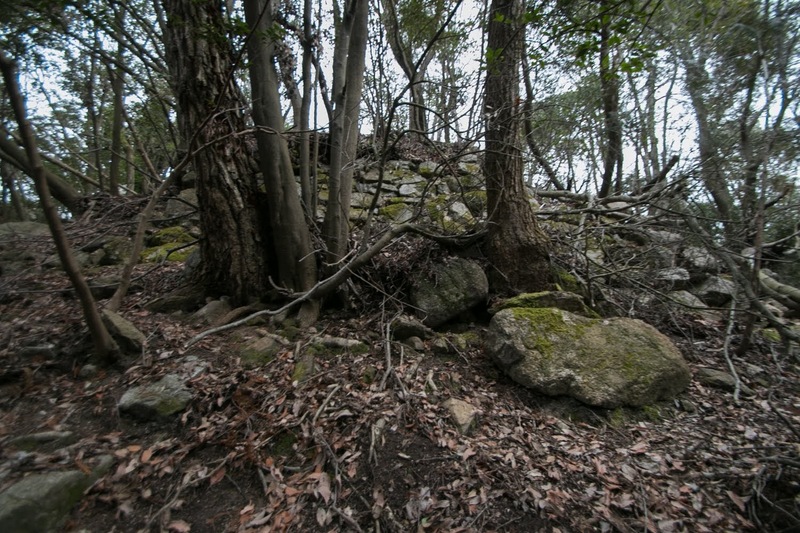 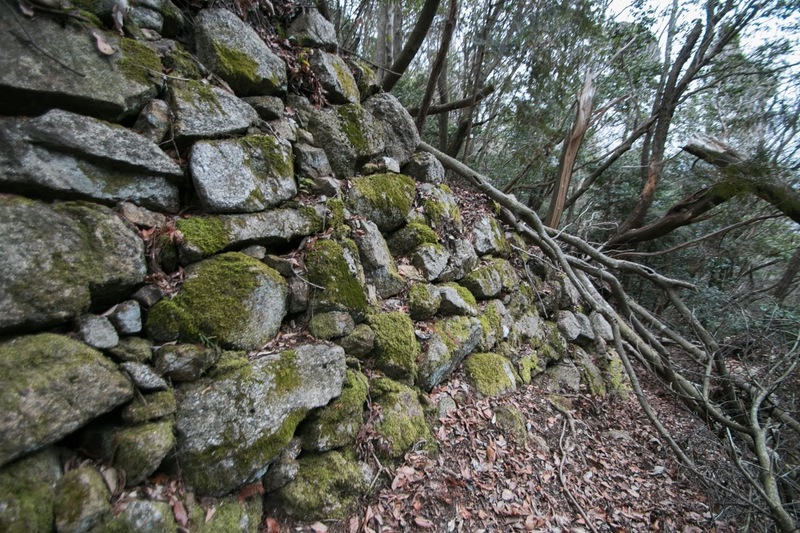 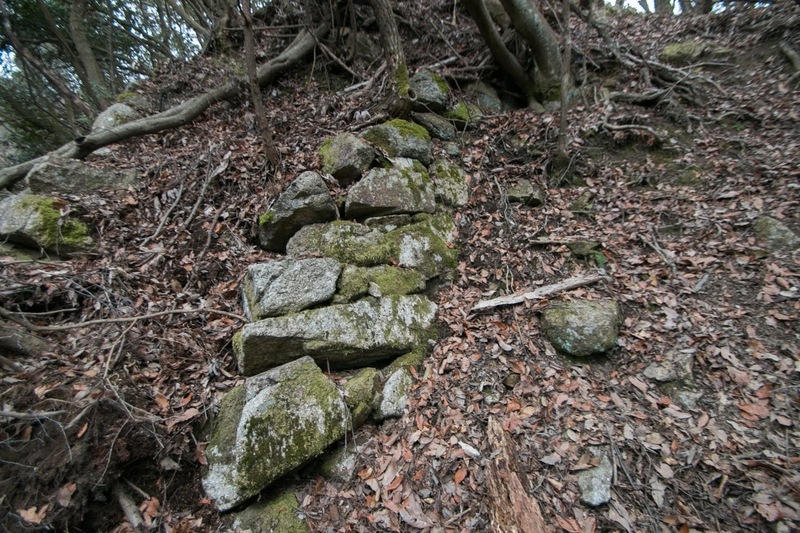 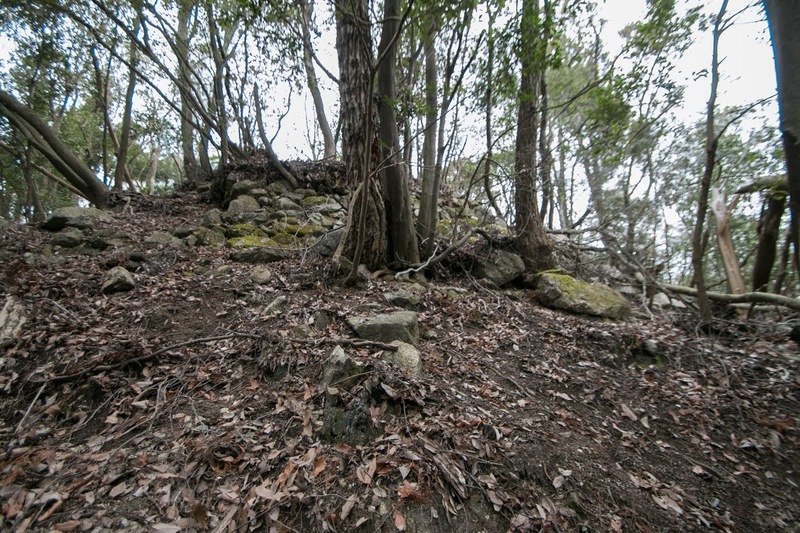 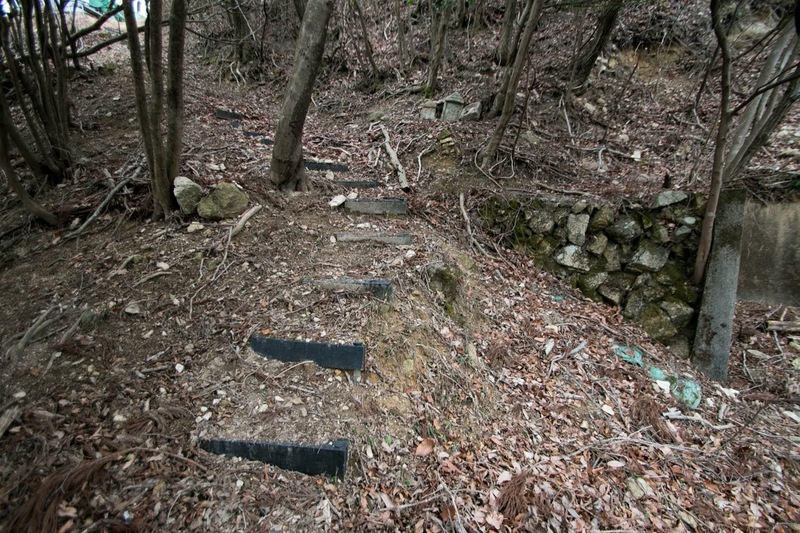 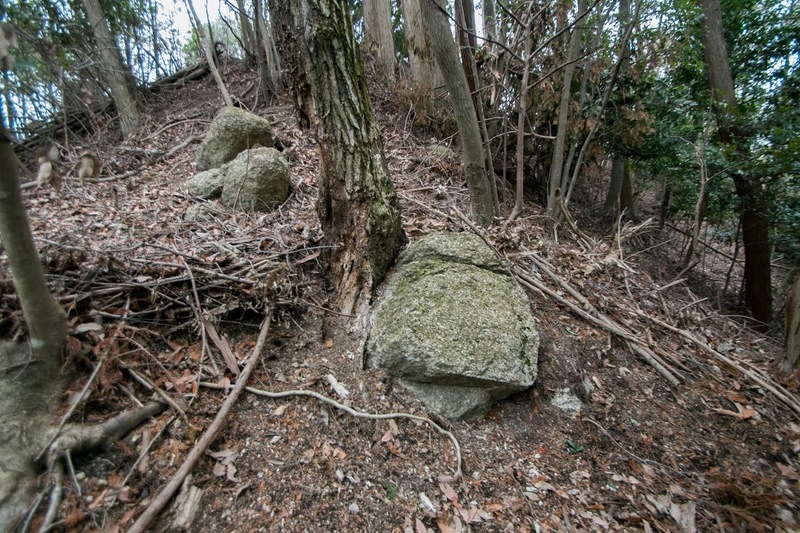 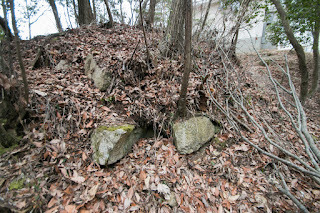 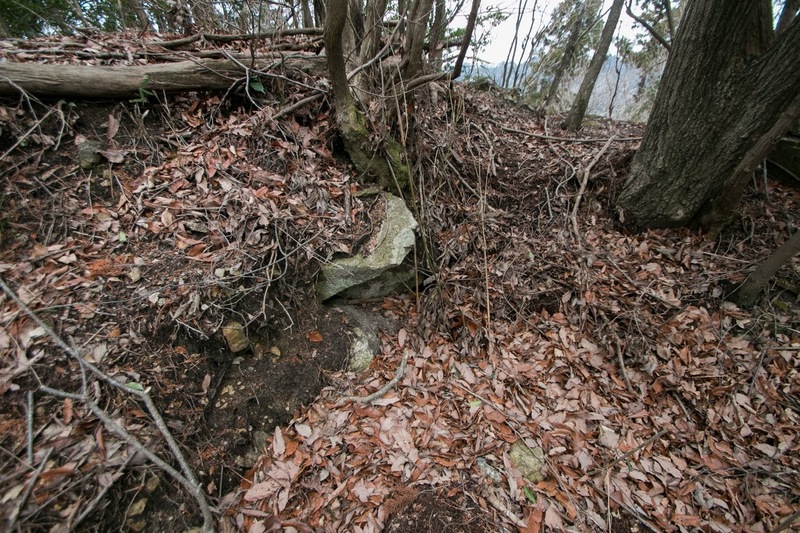 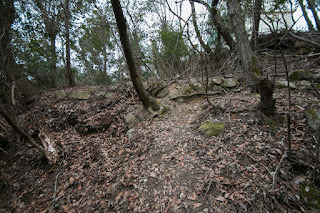 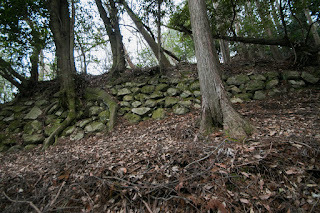 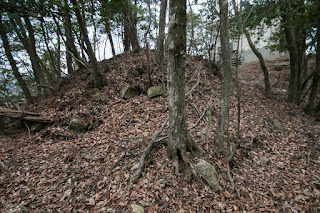 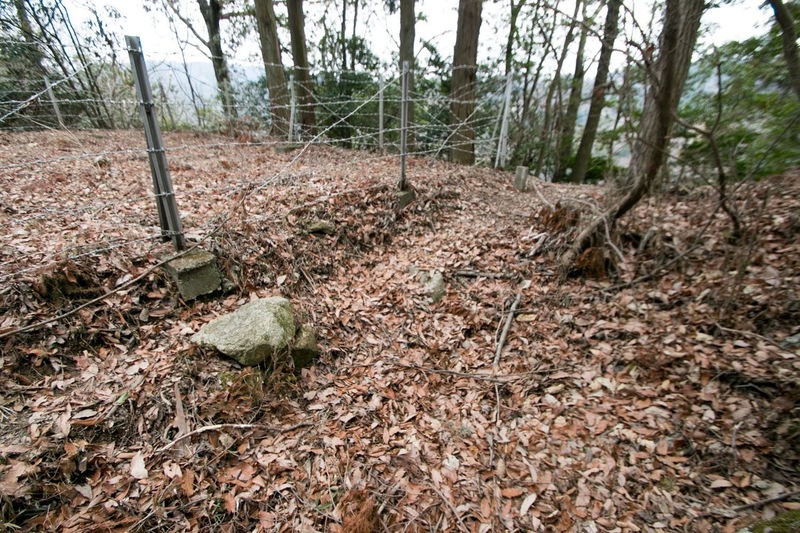 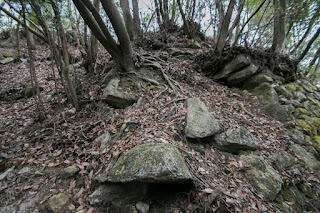 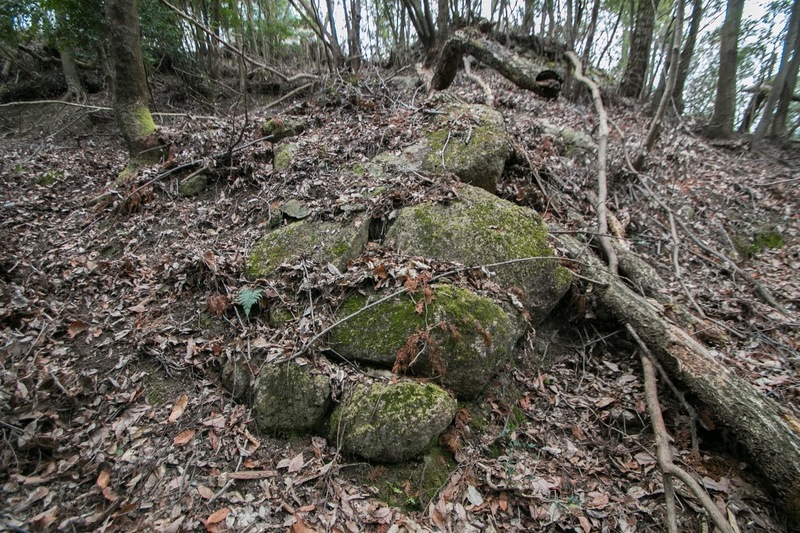 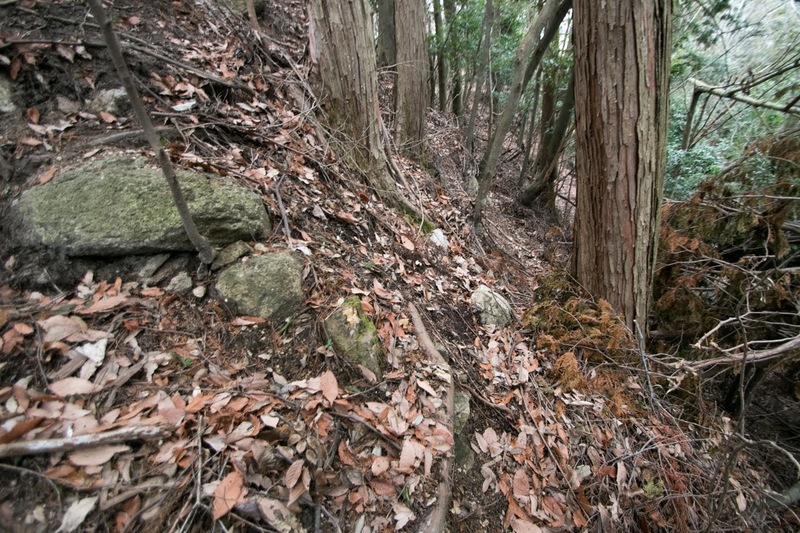 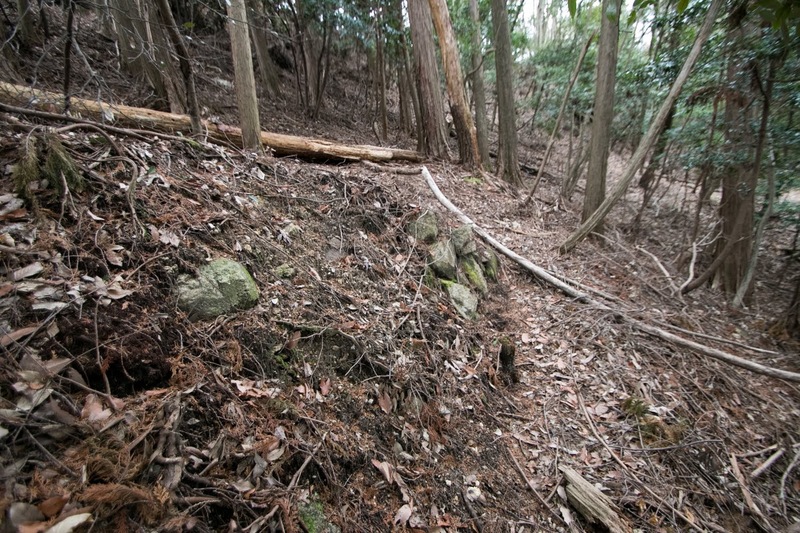 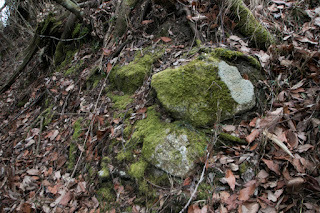 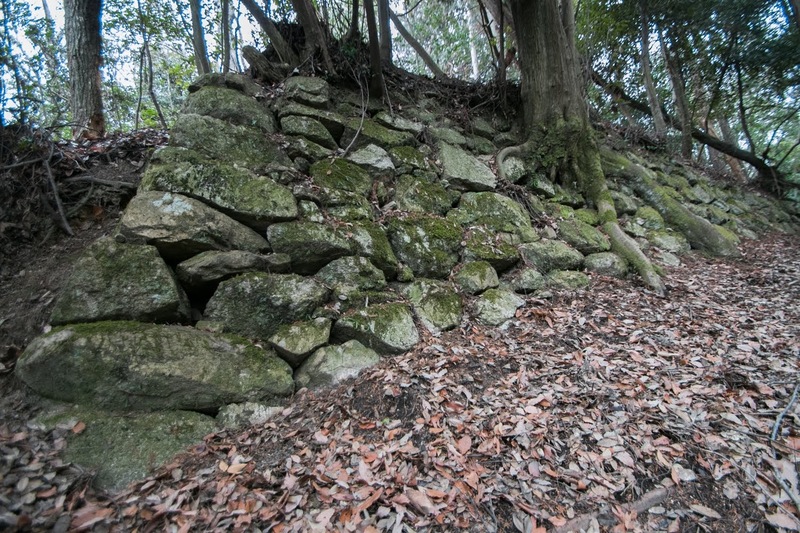 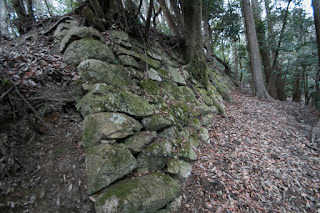 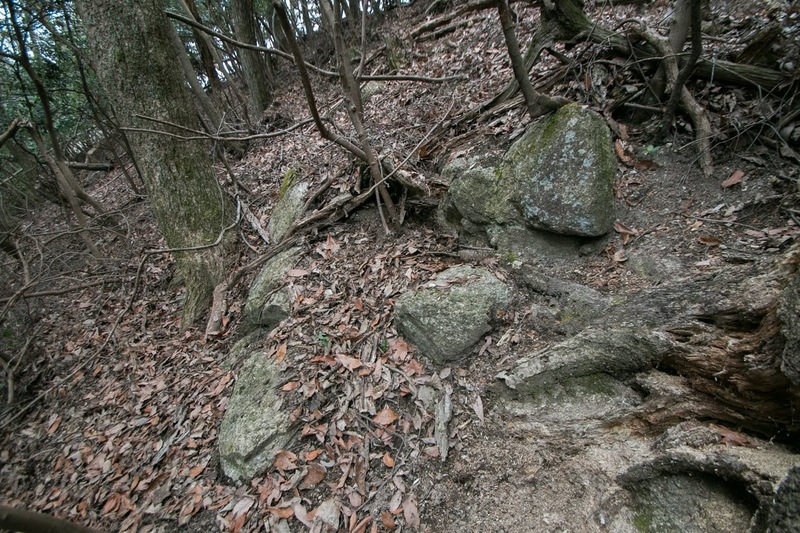 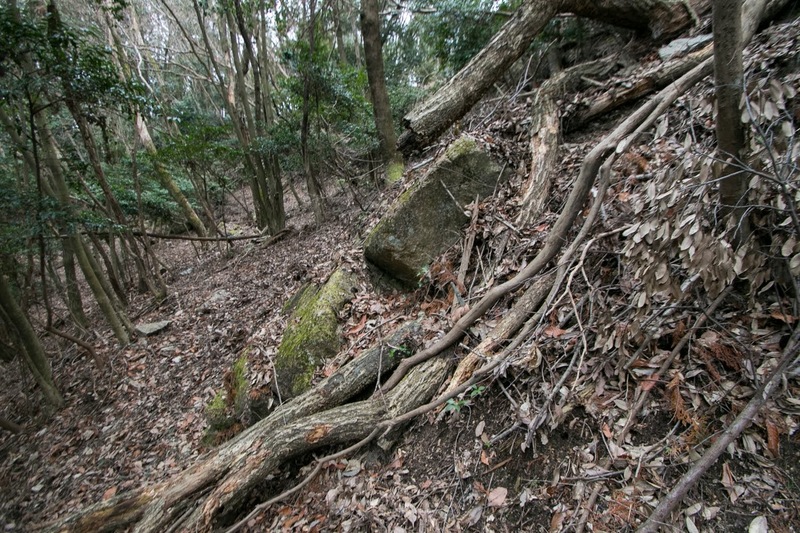 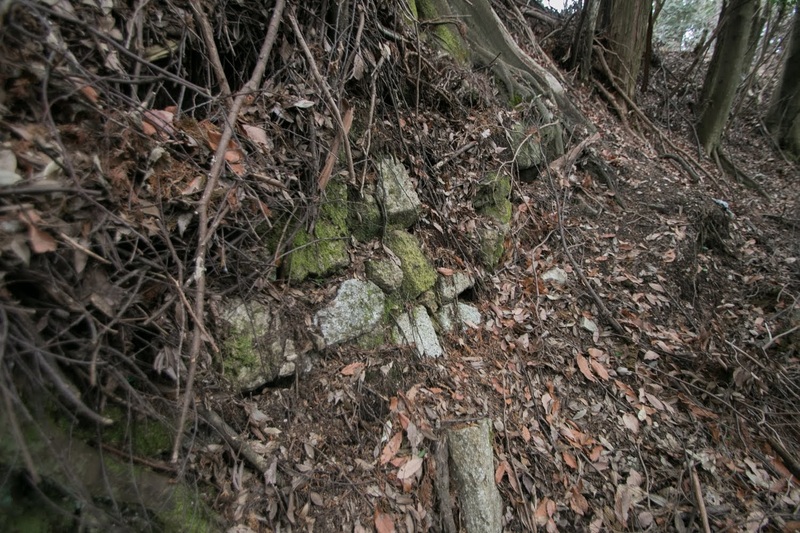 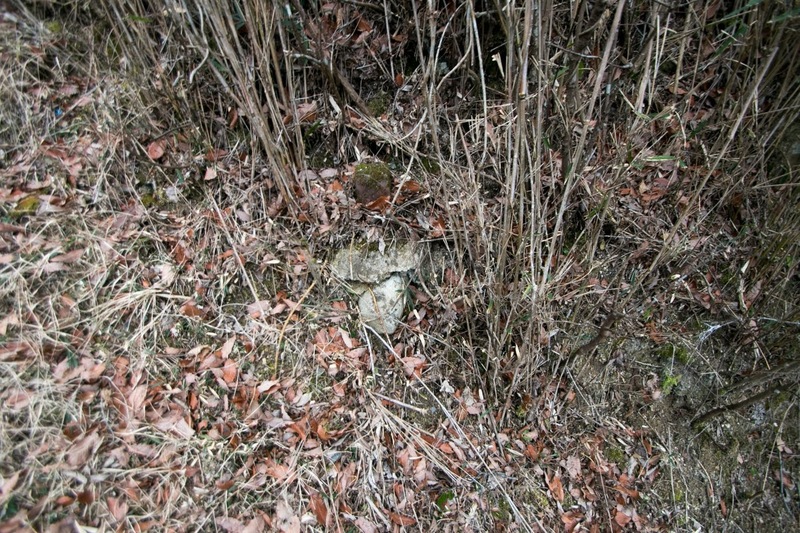 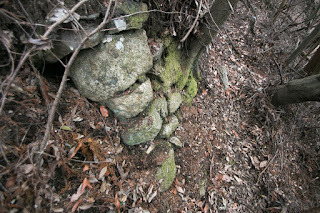 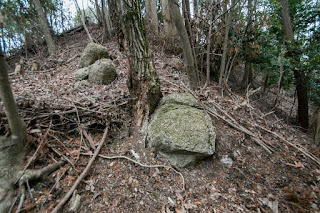 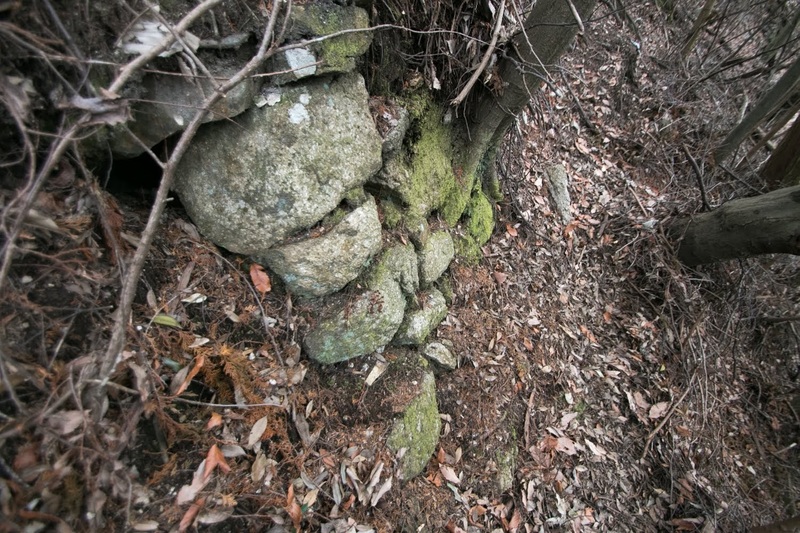 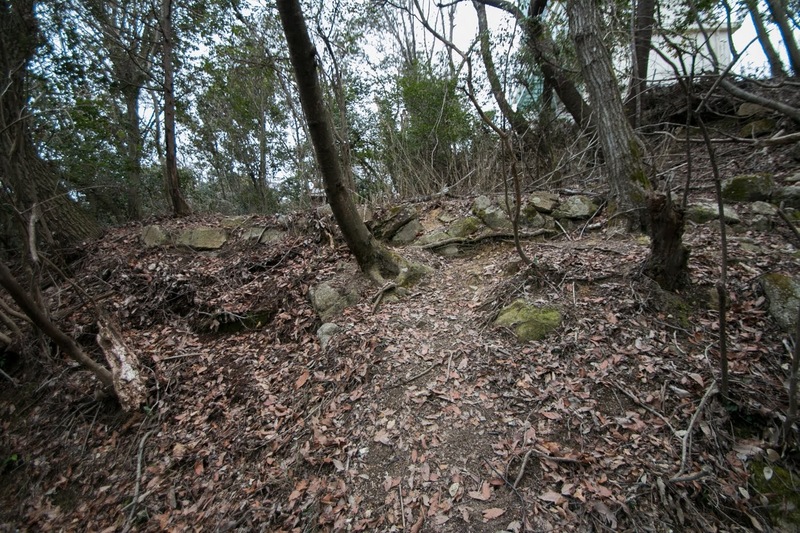 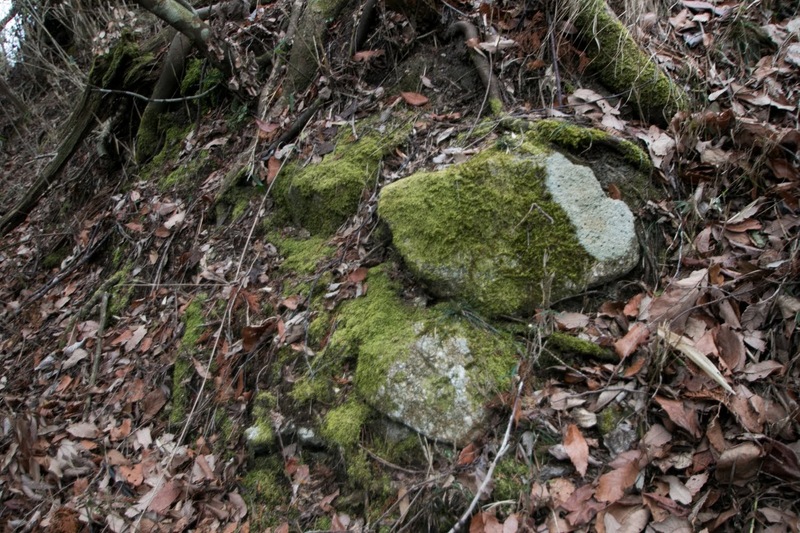 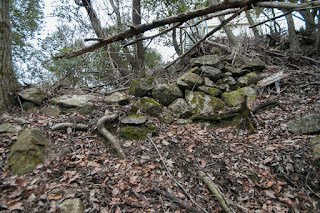 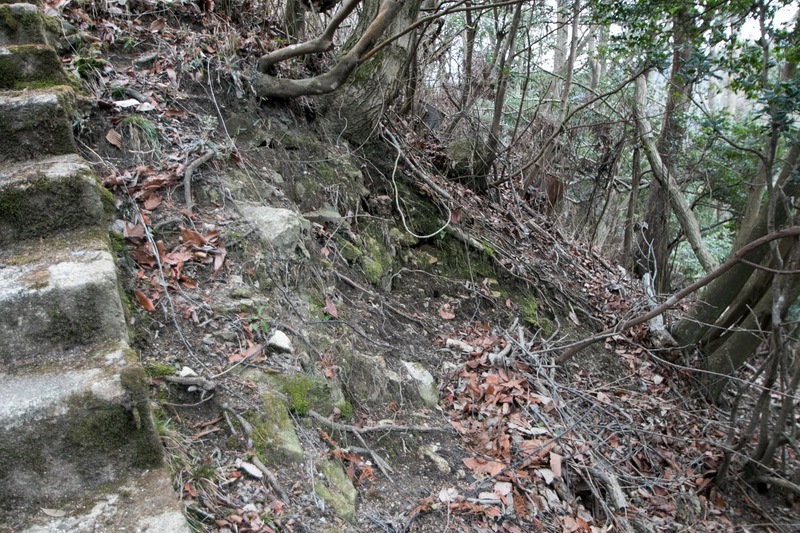 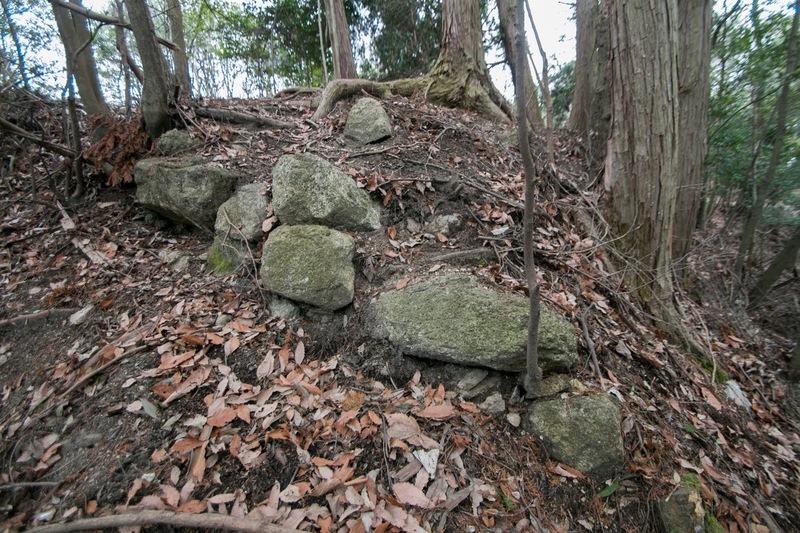 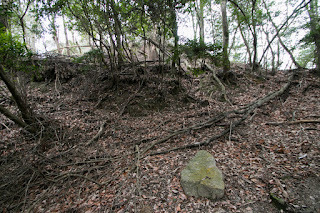 Of course stone walls were already used at large castles of Kinki region, such as Kannonji castle of Rokkaku clan or Odani castle of Azai clan. But stone walls of these castles were low and just placed large stones two or three layer, and was only used to decorate the gates and hold the shape of the ground. 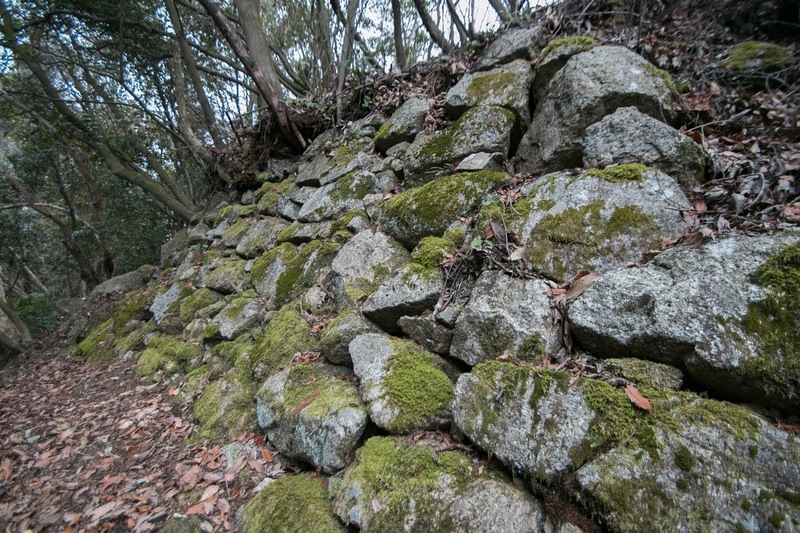 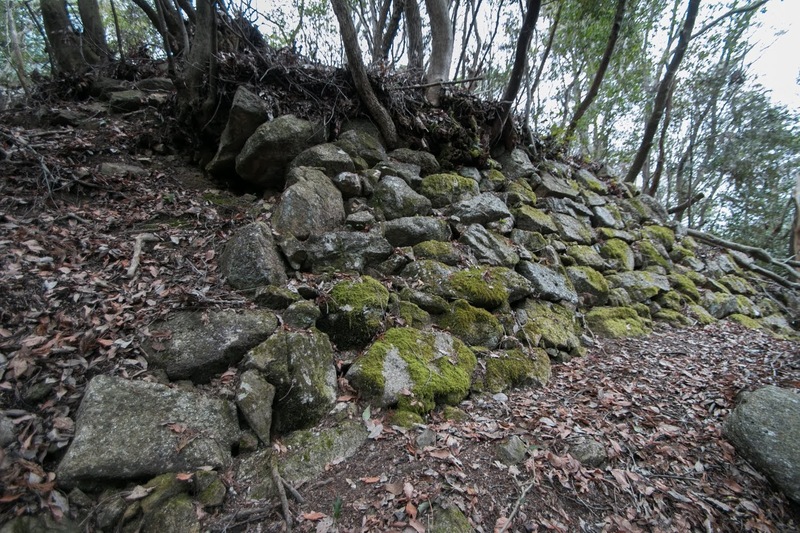 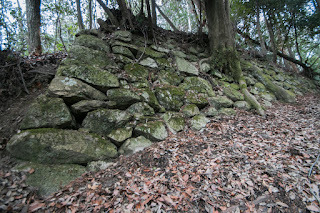 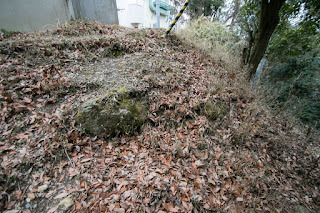 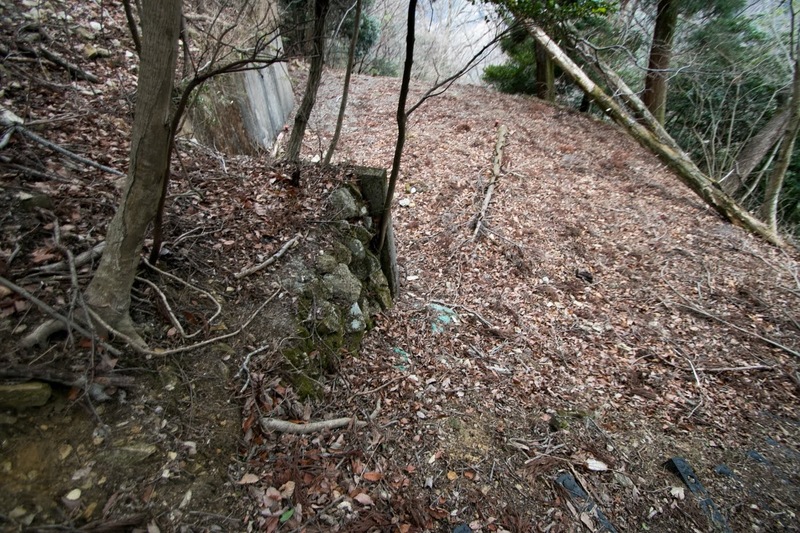 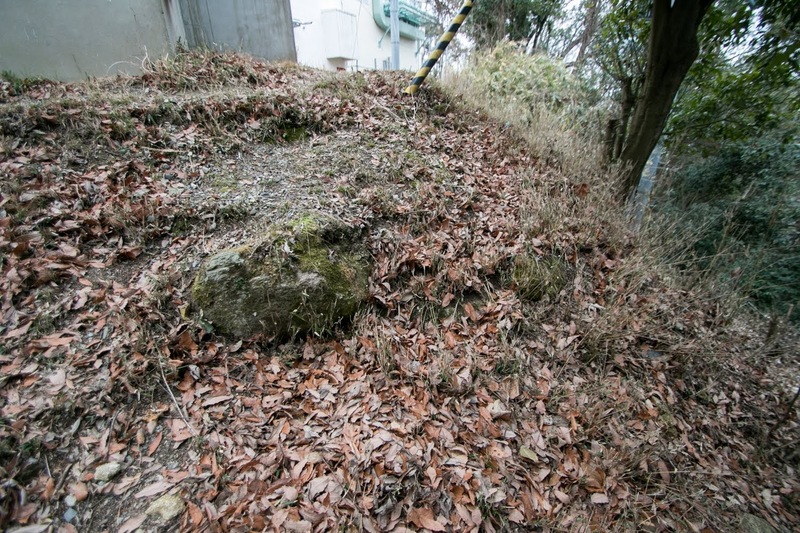 But Nobunaga intended to build stone walls much higher, with the combination of outer layer of large size stones and inner layer of pebbles, to enable drainage and keep the wall more stable. 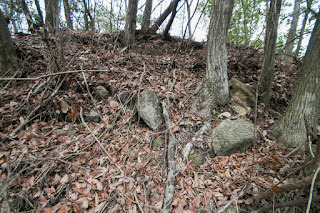 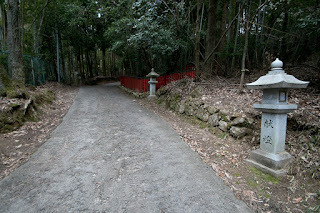 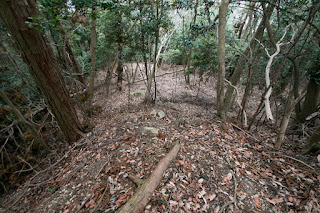 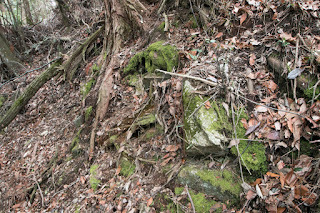 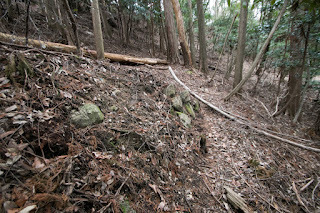 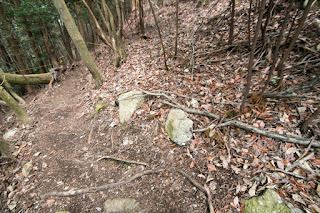 Using this tall stone walls, Nobunaga made secure defense line toward enemy. 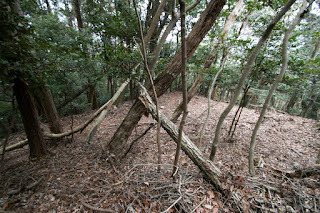 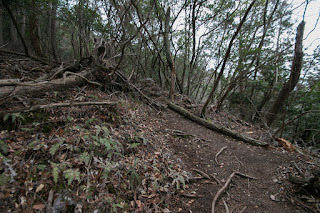 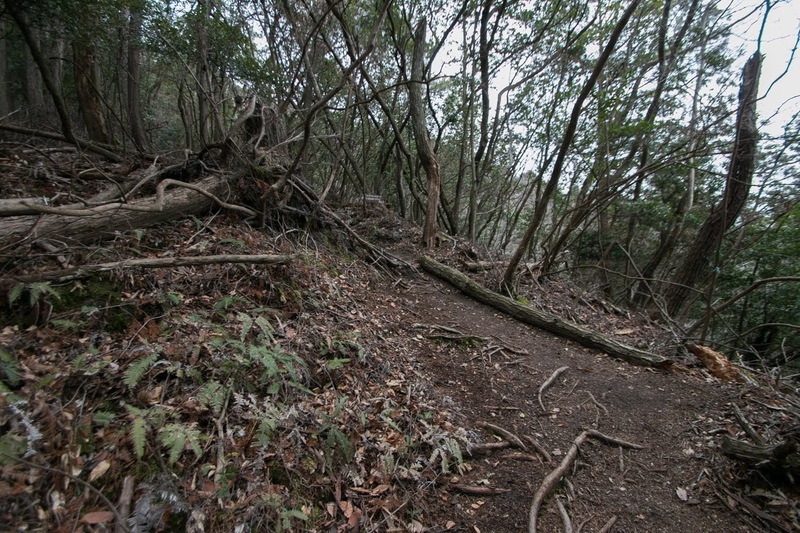 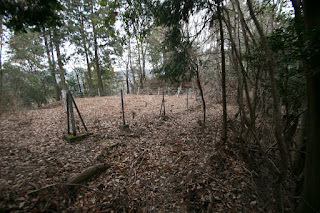 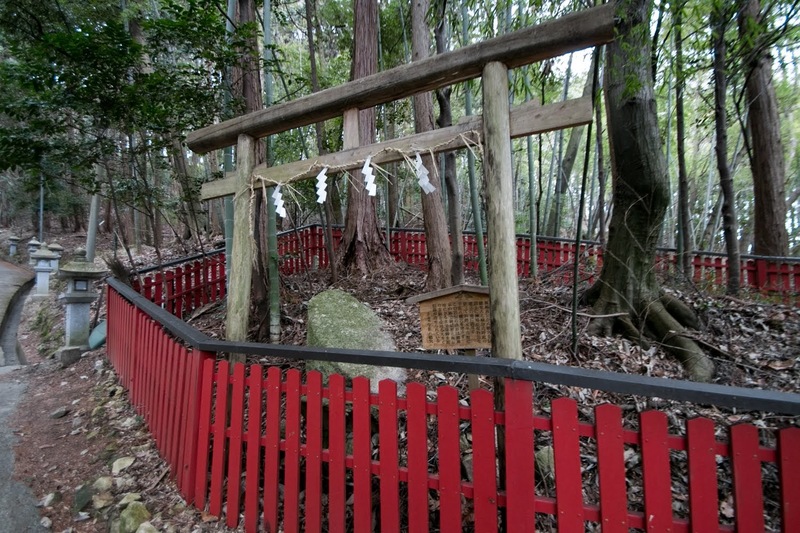 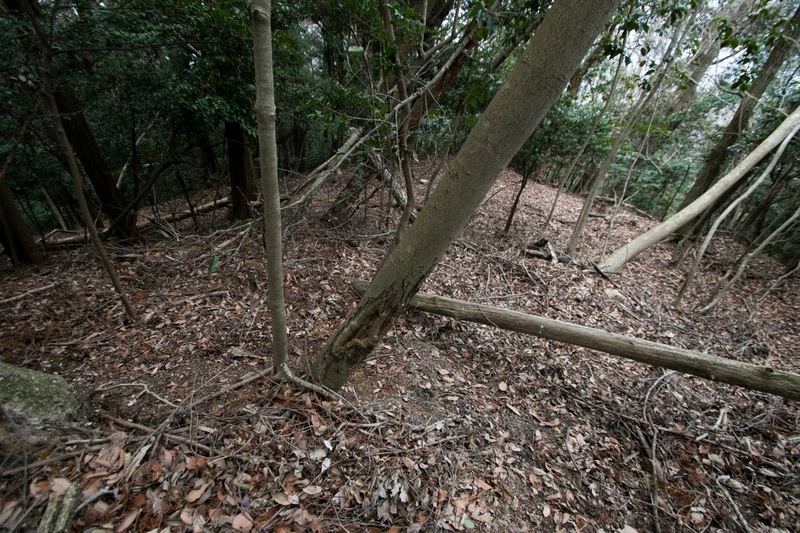 and also built a Masugata style gate with folded path, to prevent charge of enemy soldiers and make side attack. 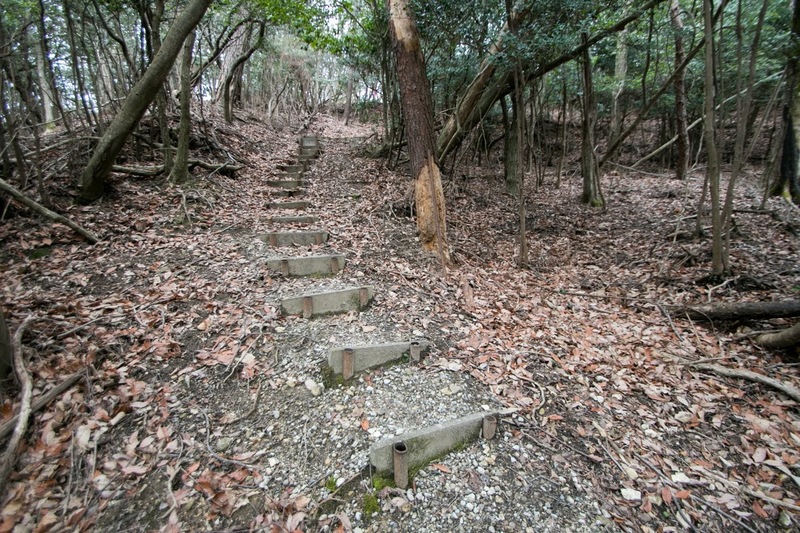 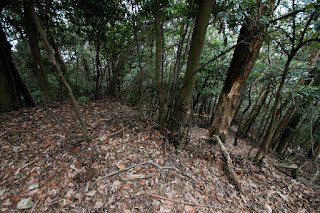 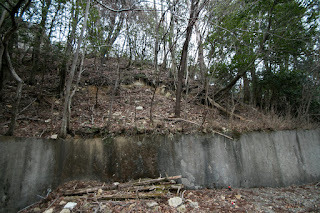 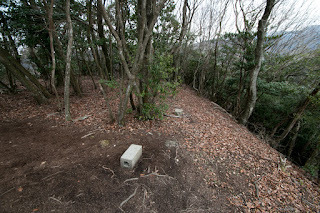 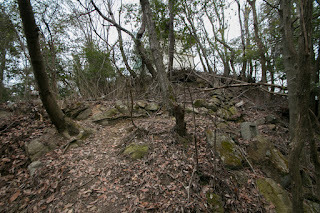 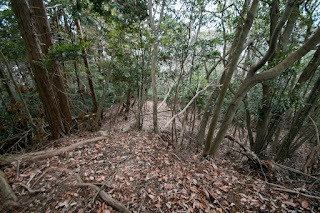 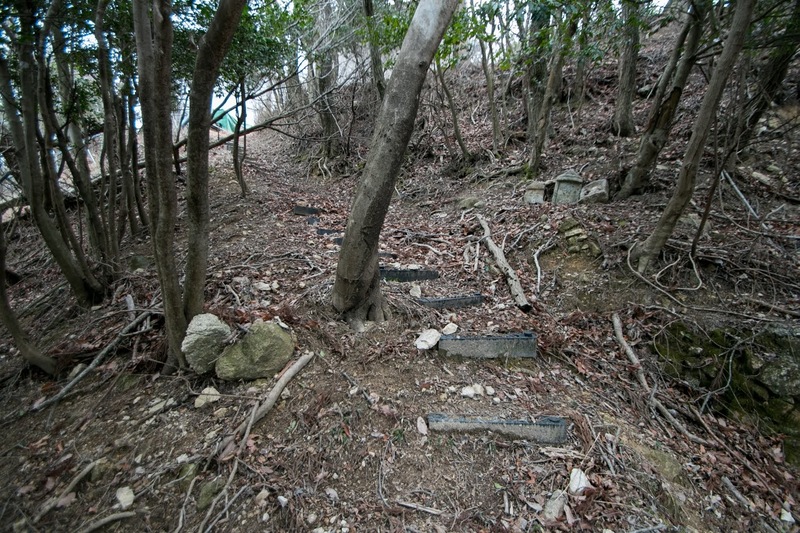 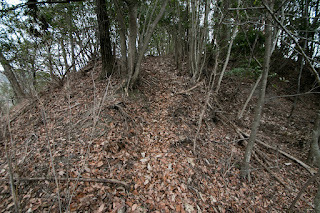 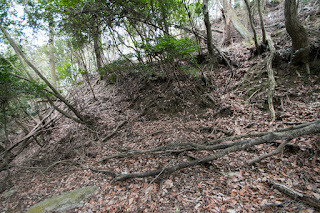 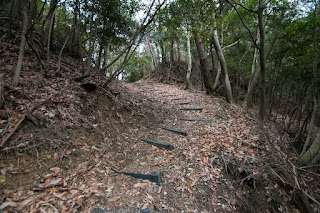 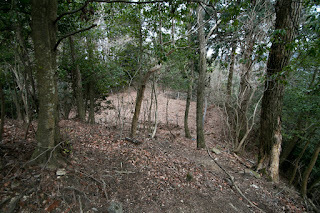 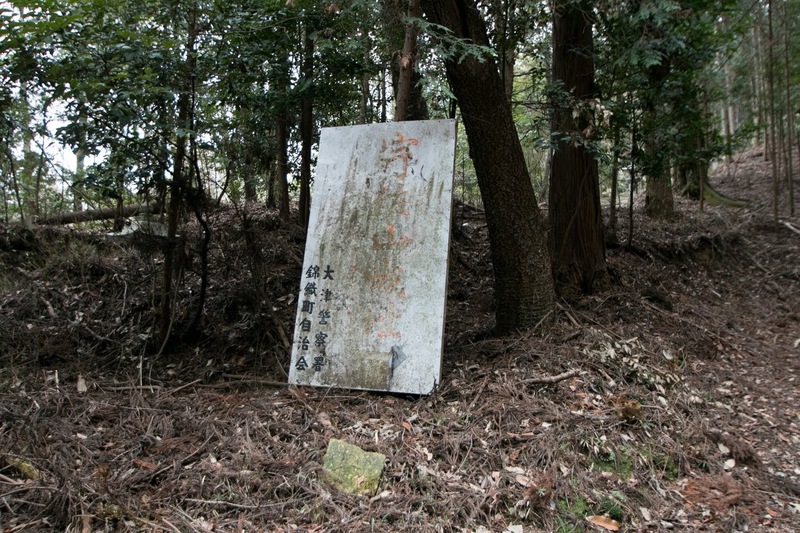 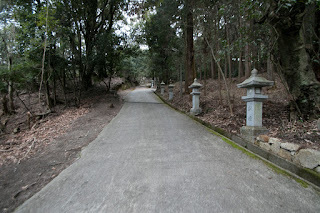 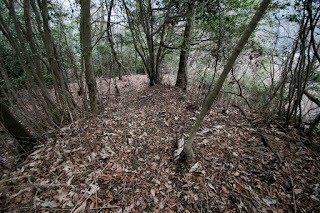 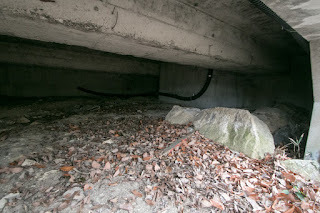 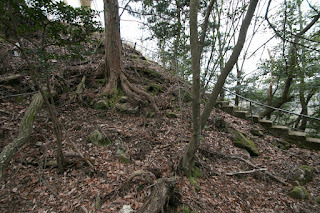 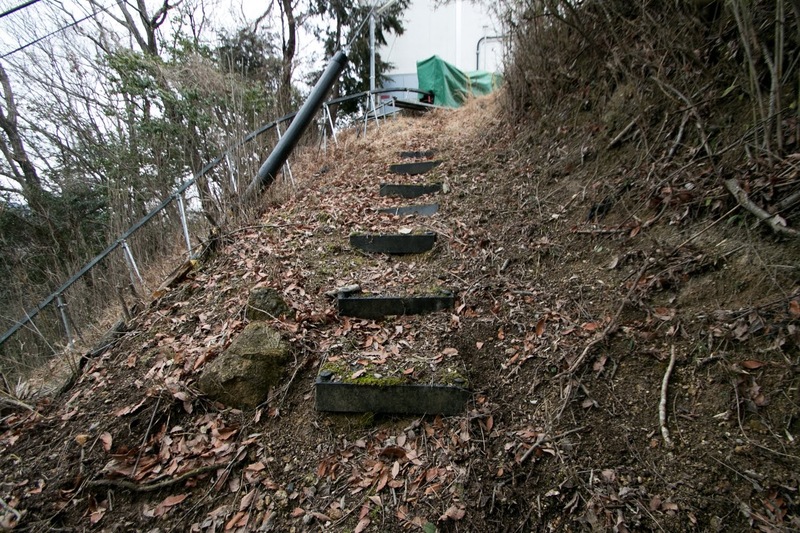 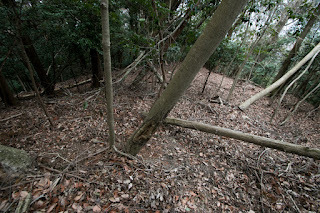 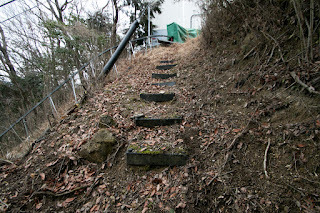 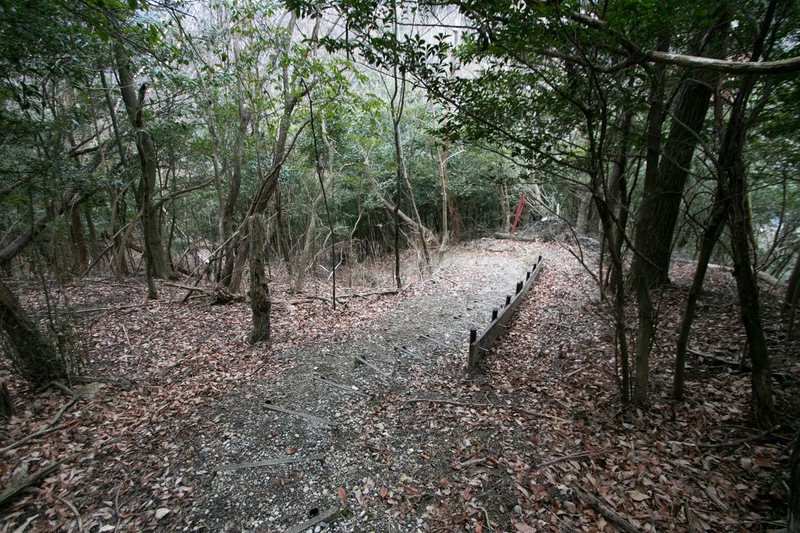 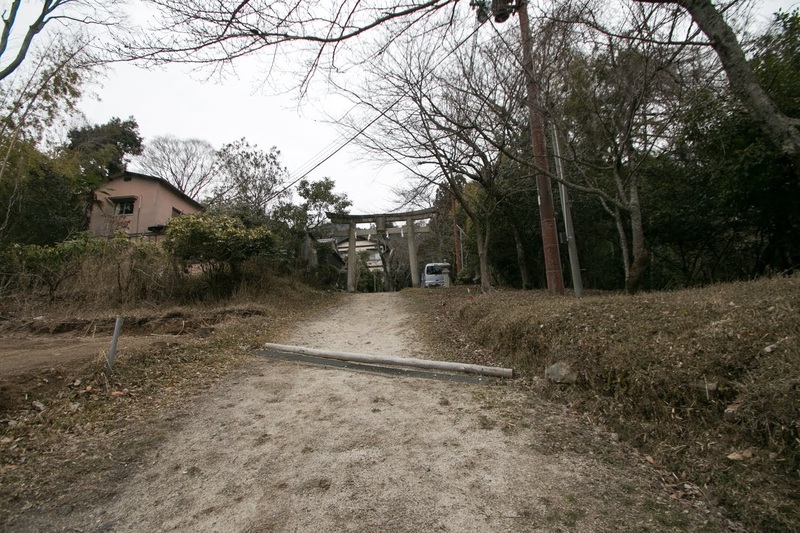 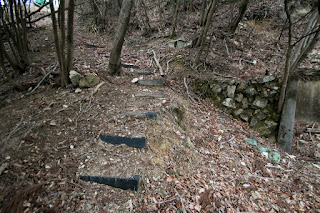 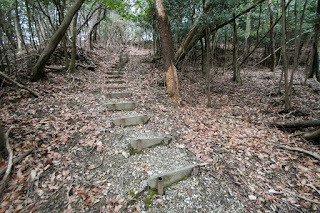 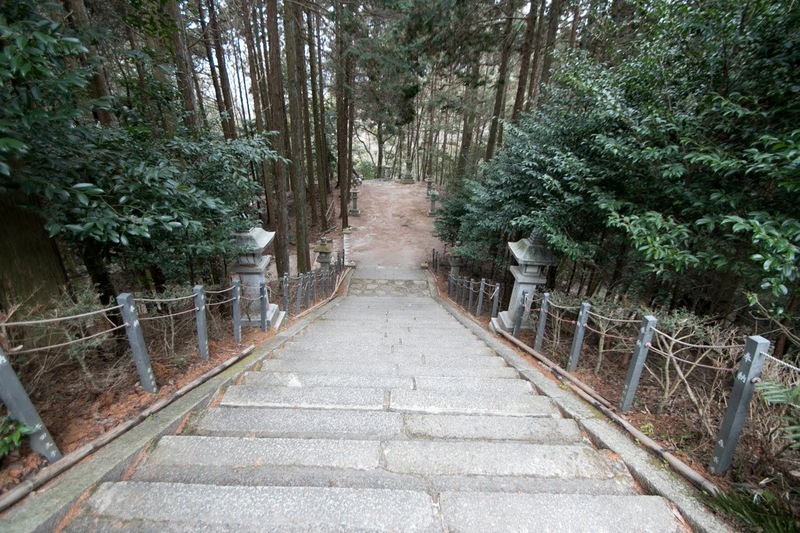 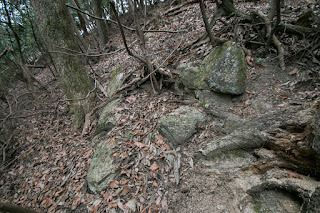 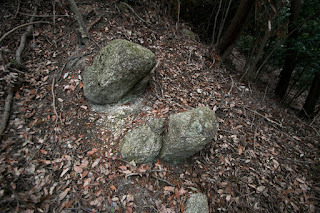 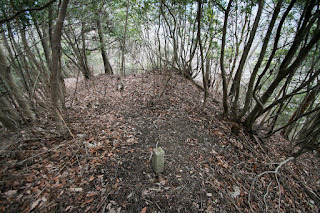 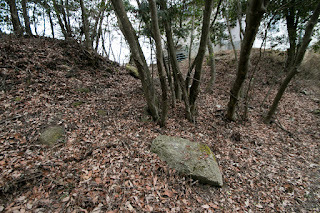 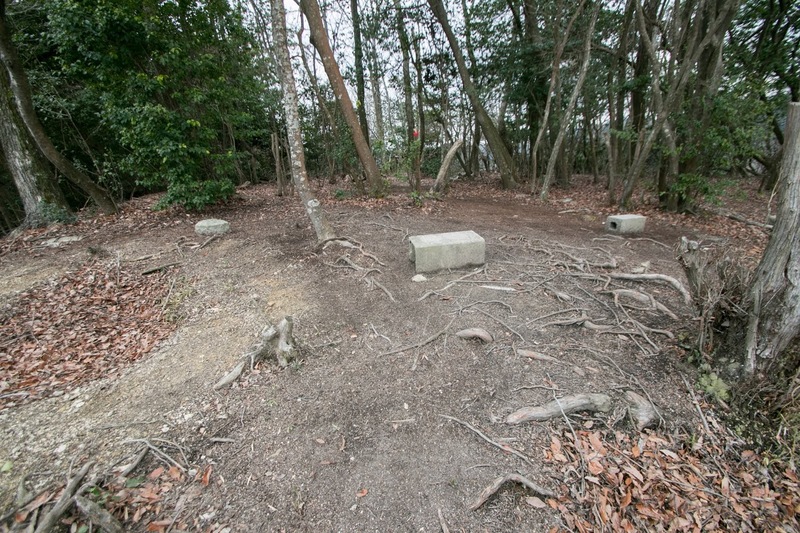 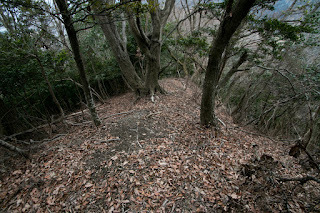 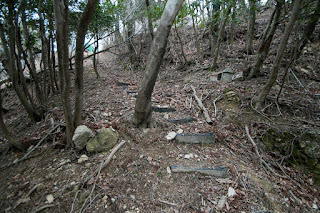 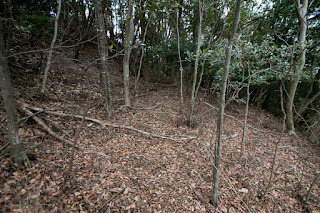 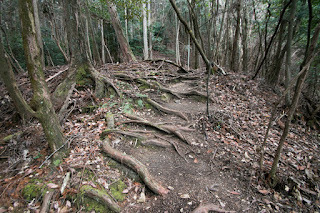 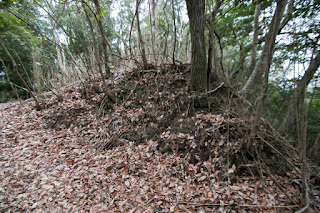 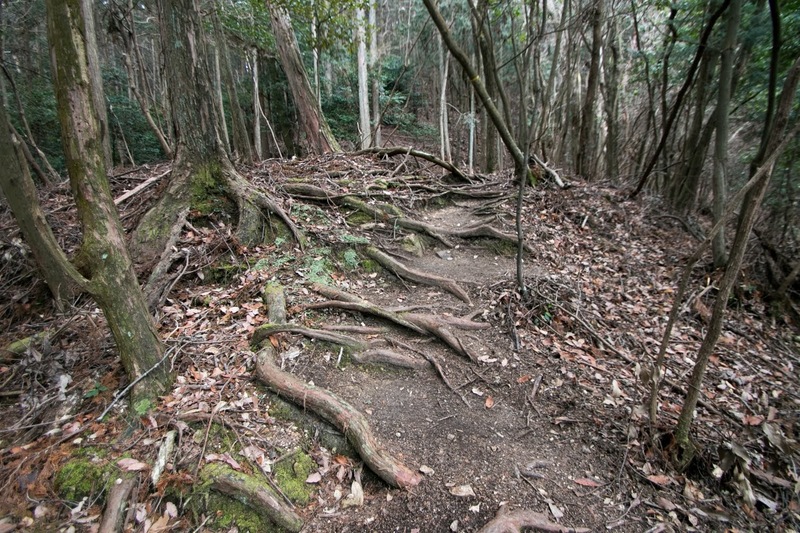 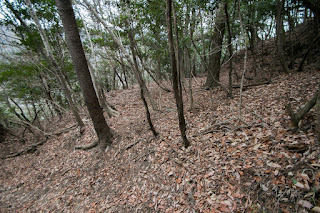 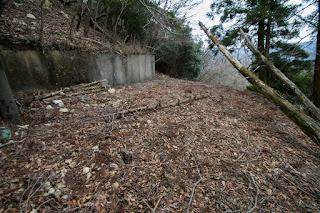 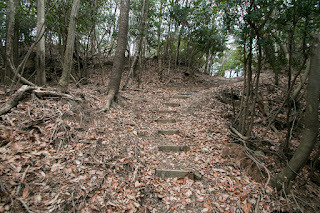 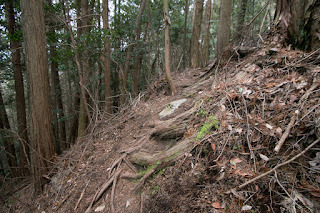 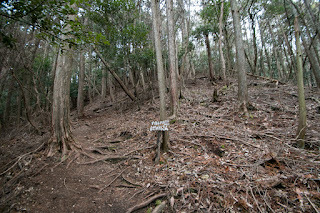 Although these elements is primitive, it was surely a progress of Japanese castle from former ones. 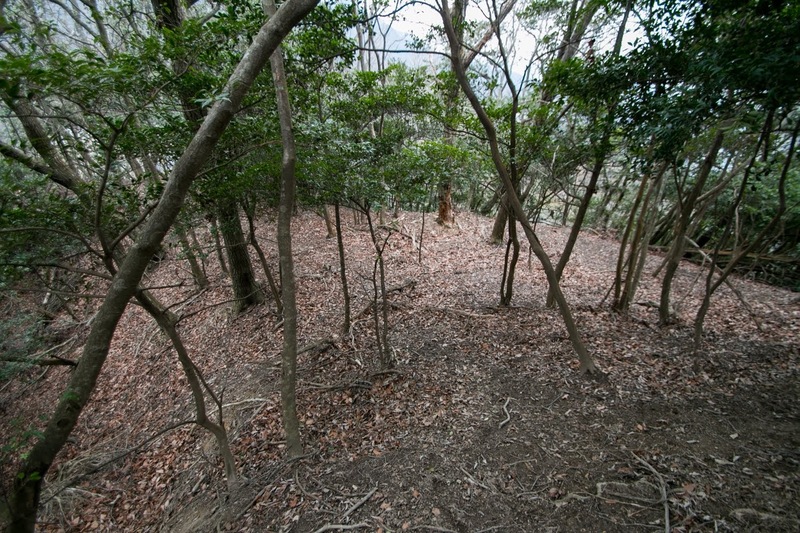 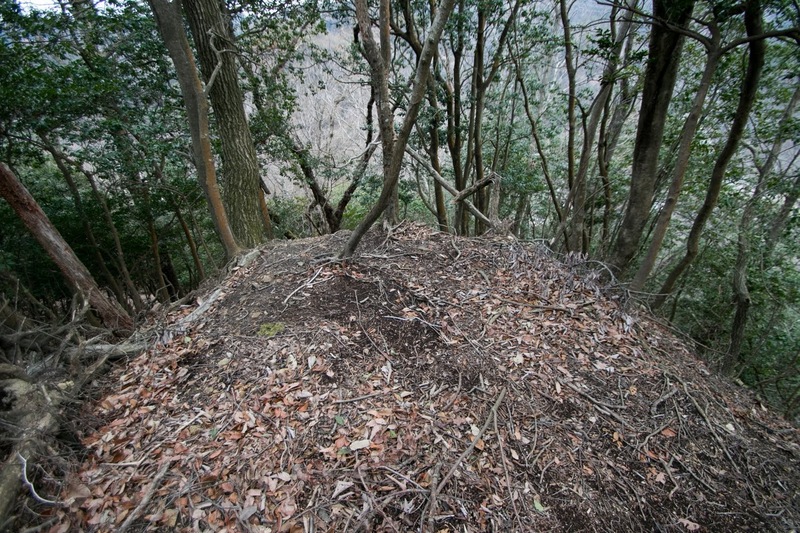 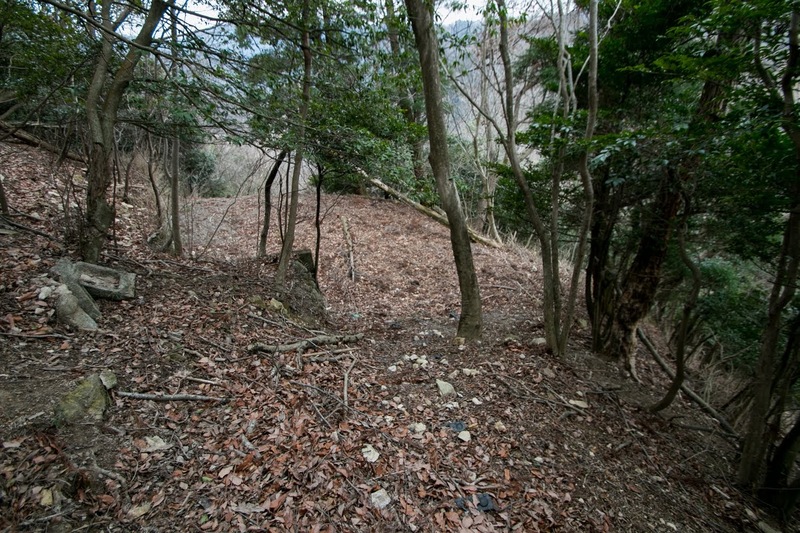 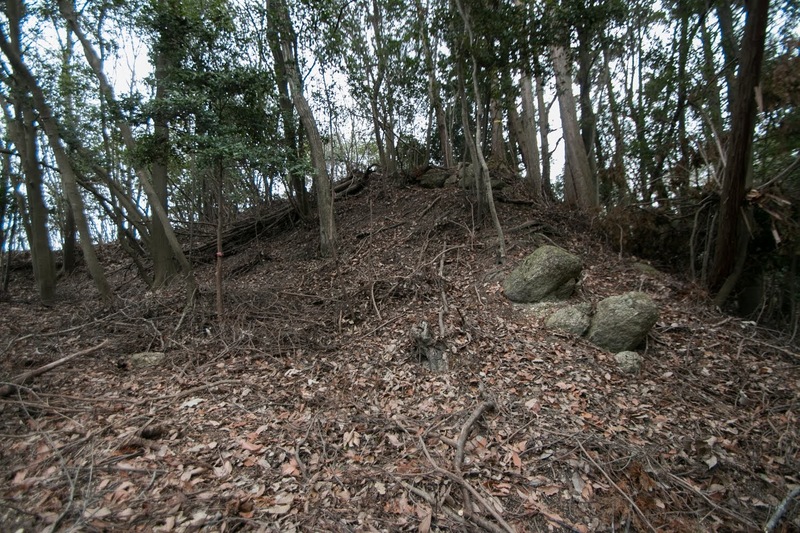 Usayama castle mainly consist of three areas, the central area and secondary area at the peak and third area ahead of saddle point. 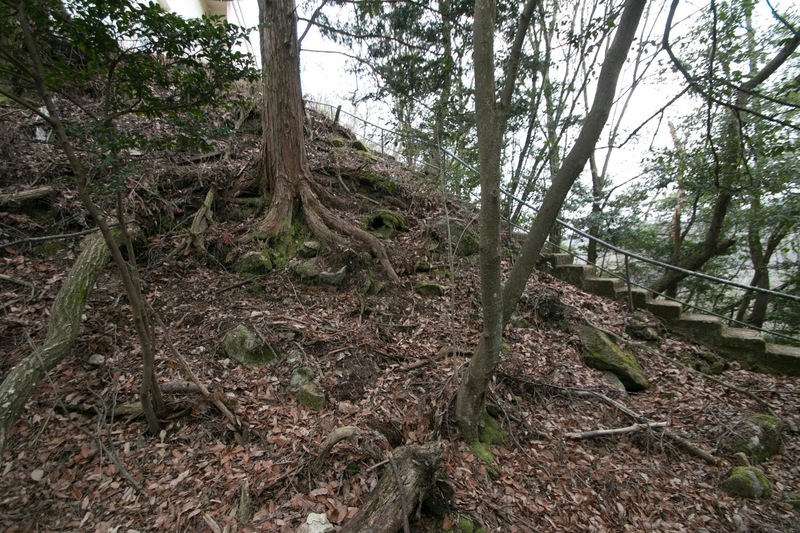 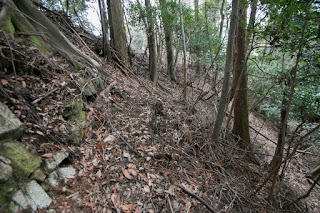 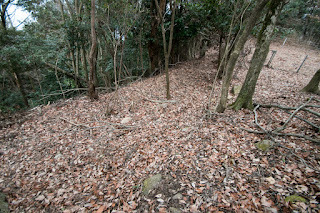 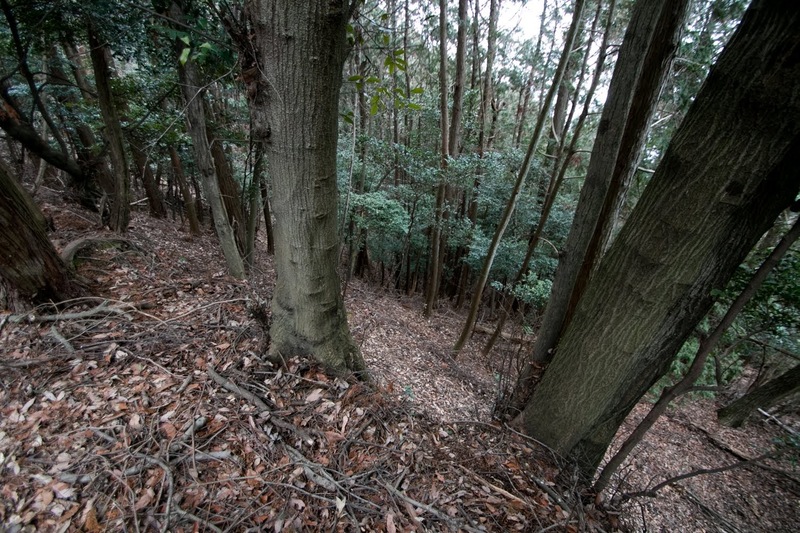 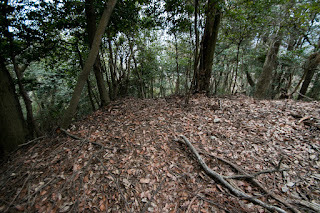 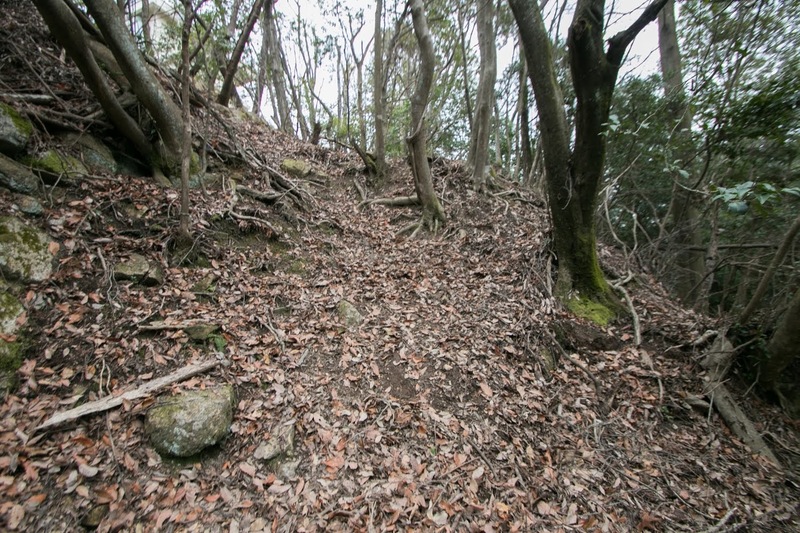 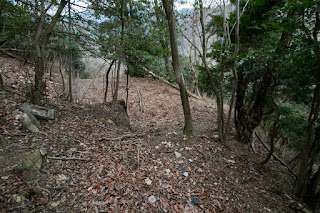 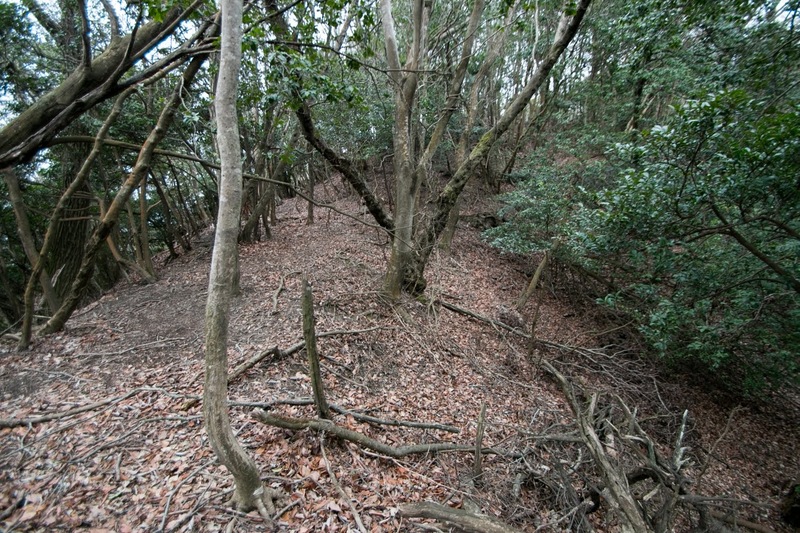 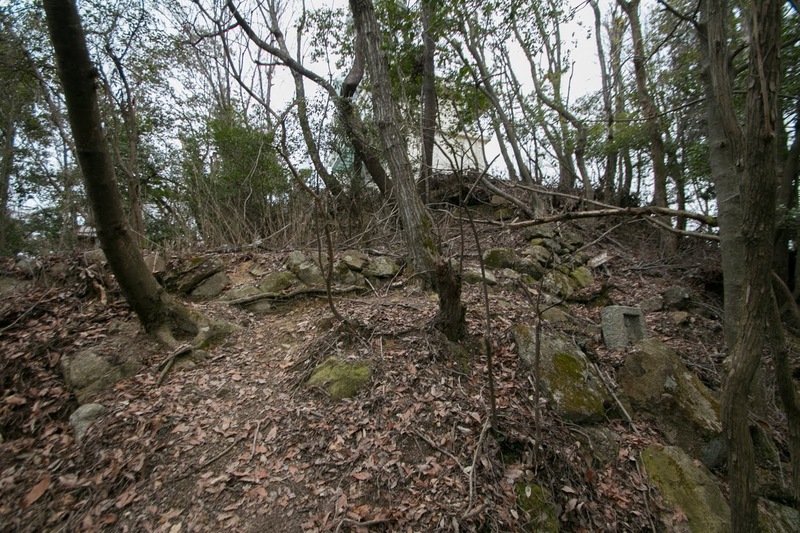 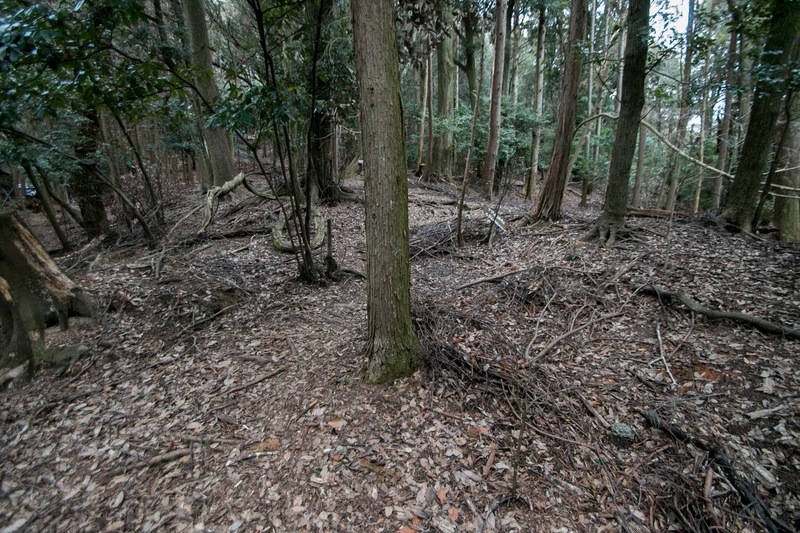 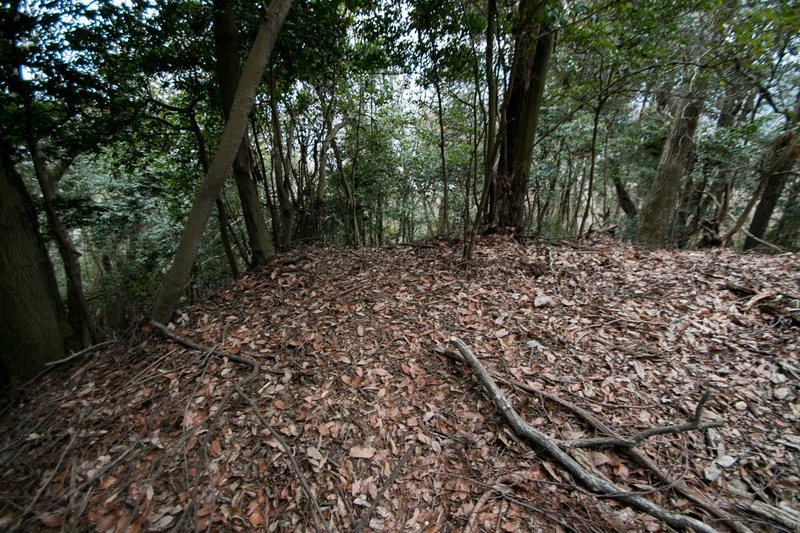 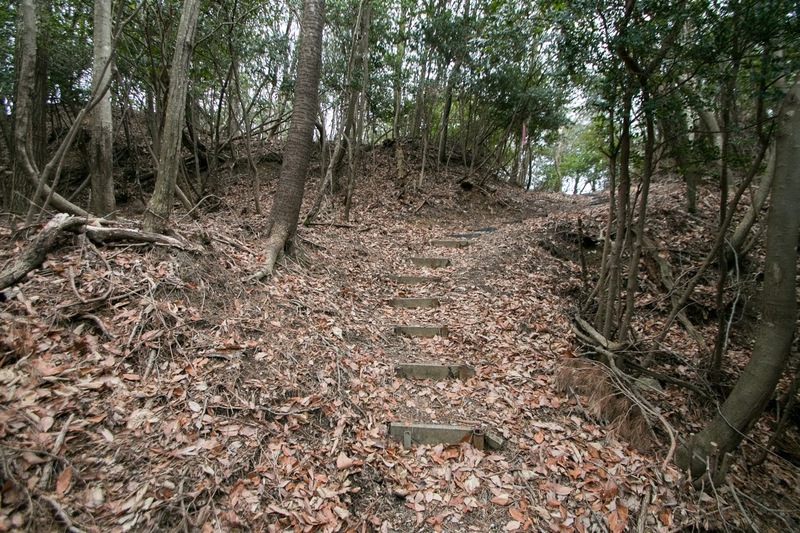 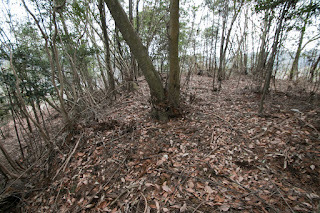 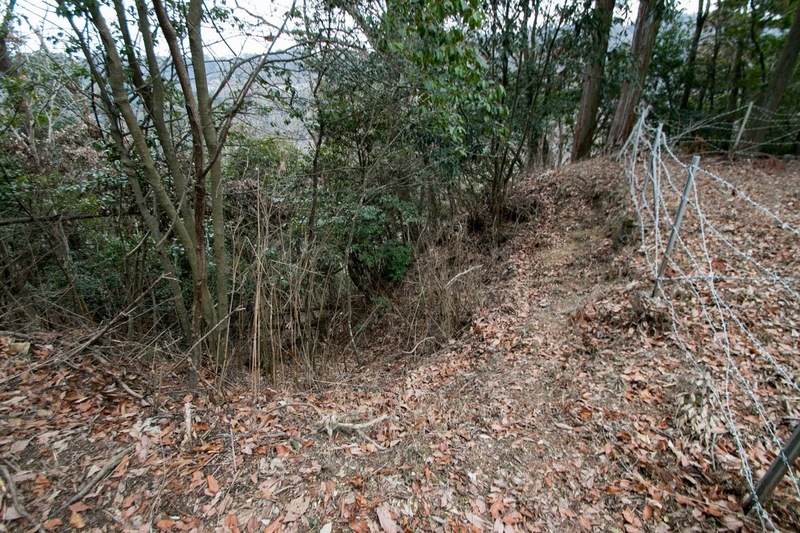 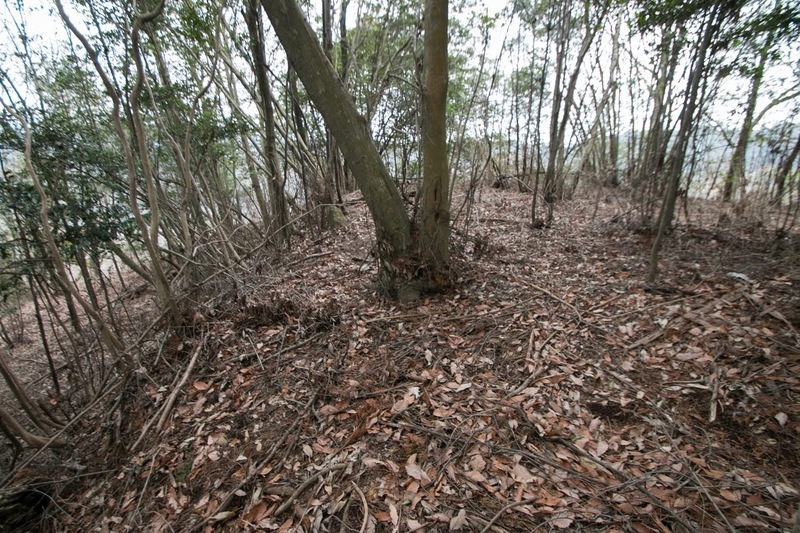 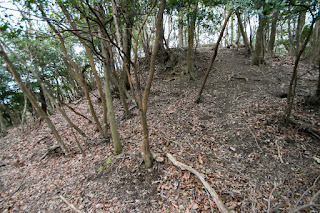 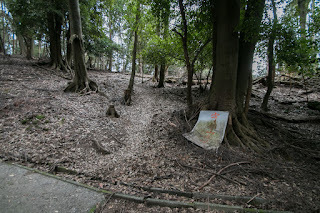 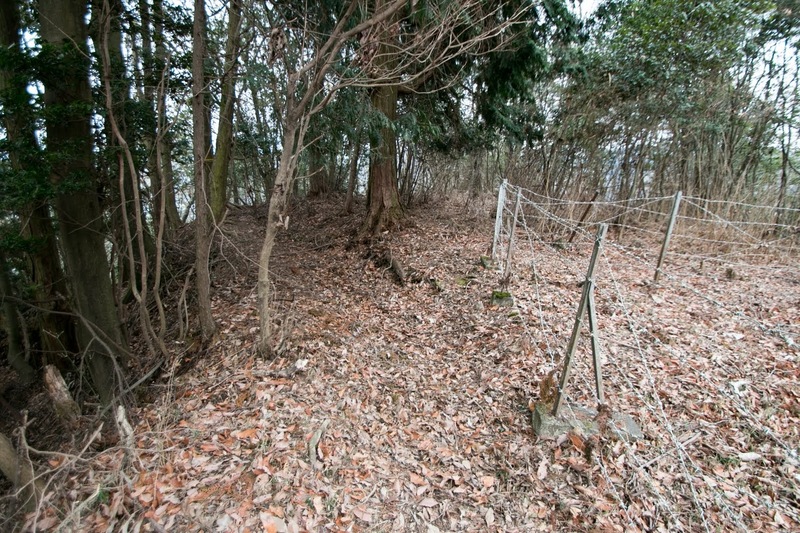 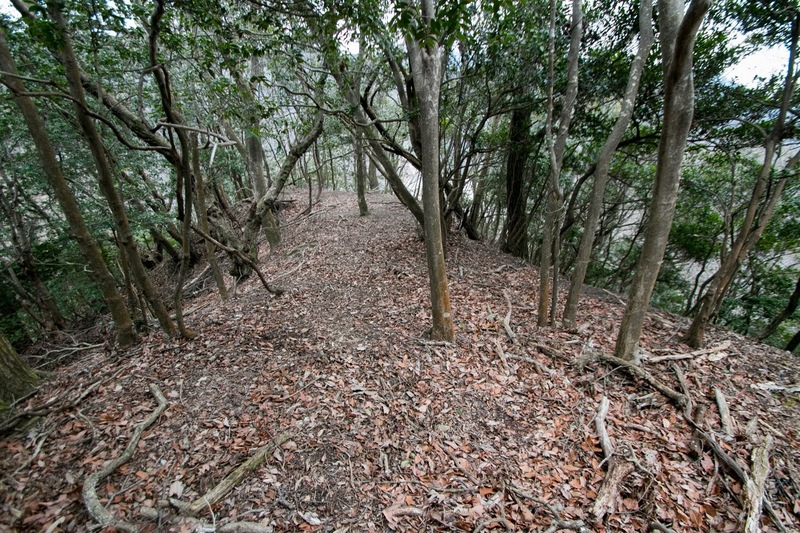 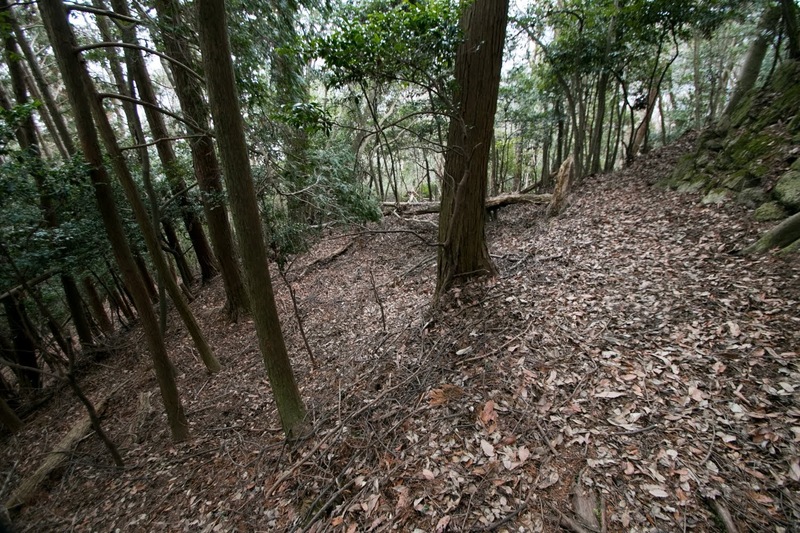 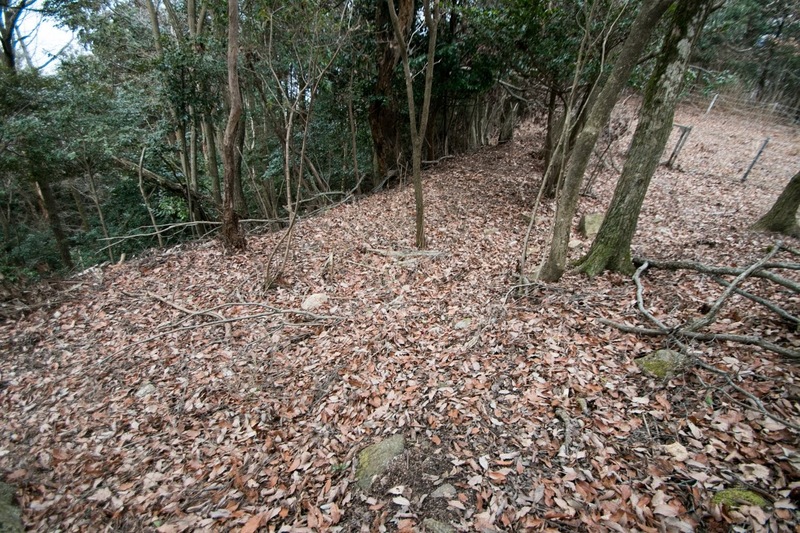 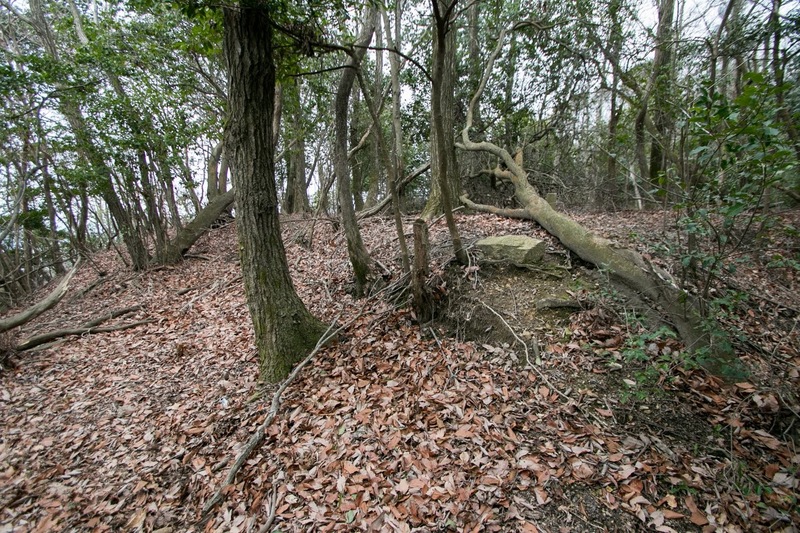 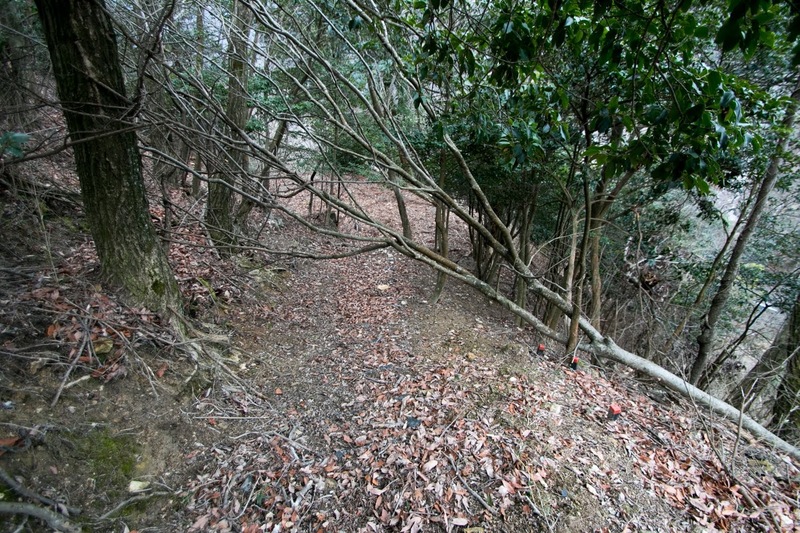 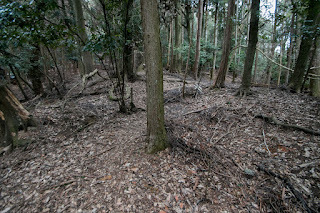 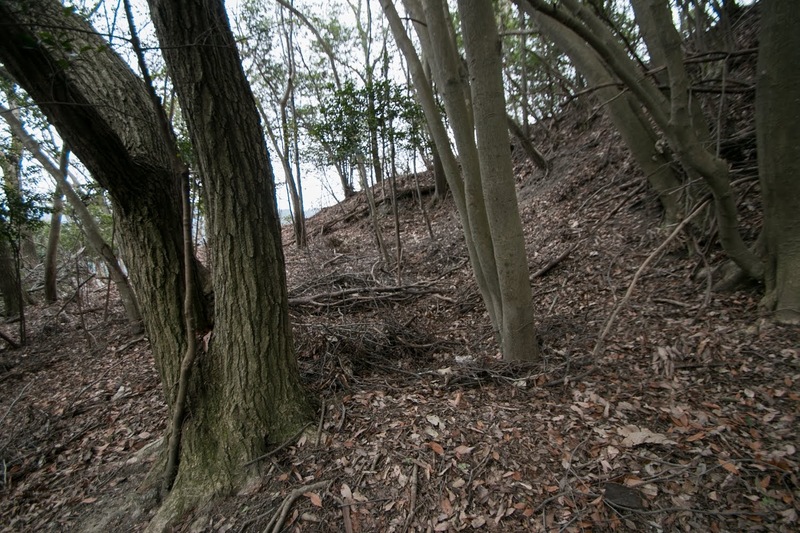 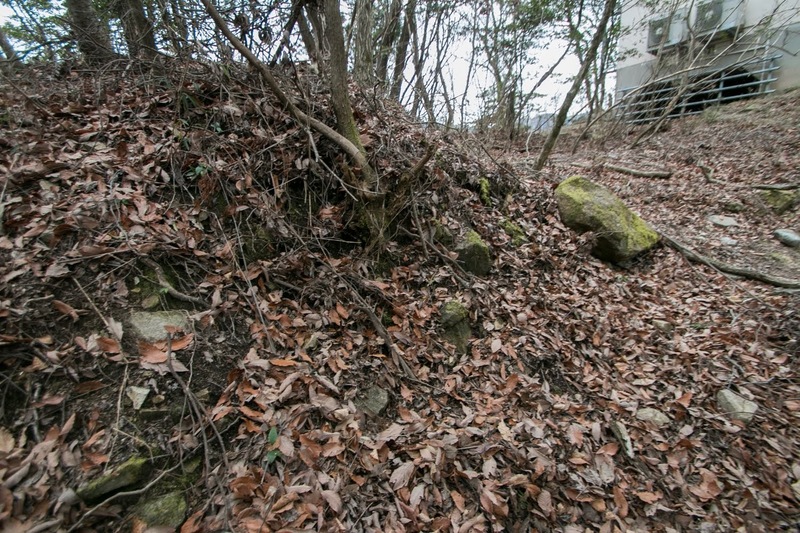 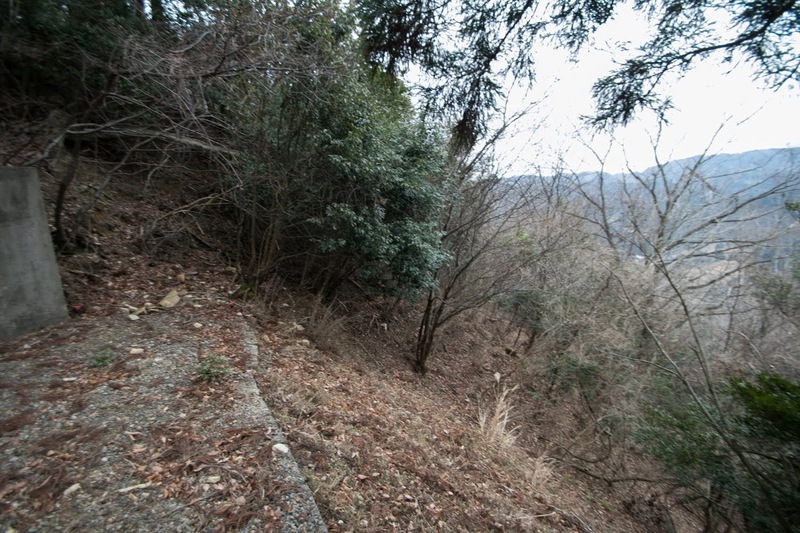 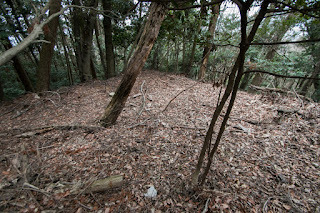 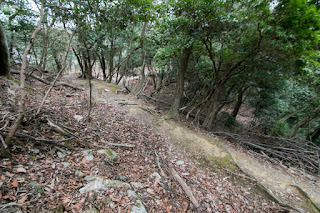 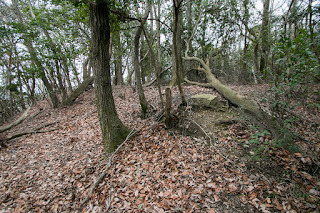 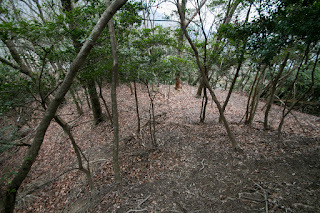 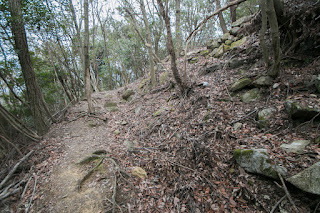 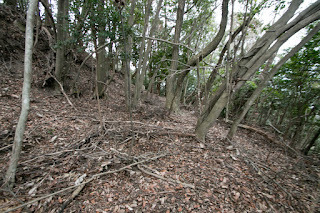 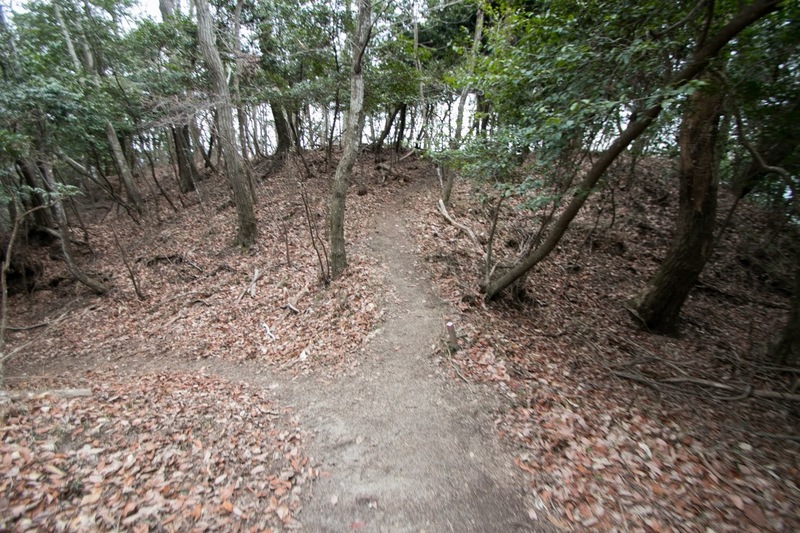 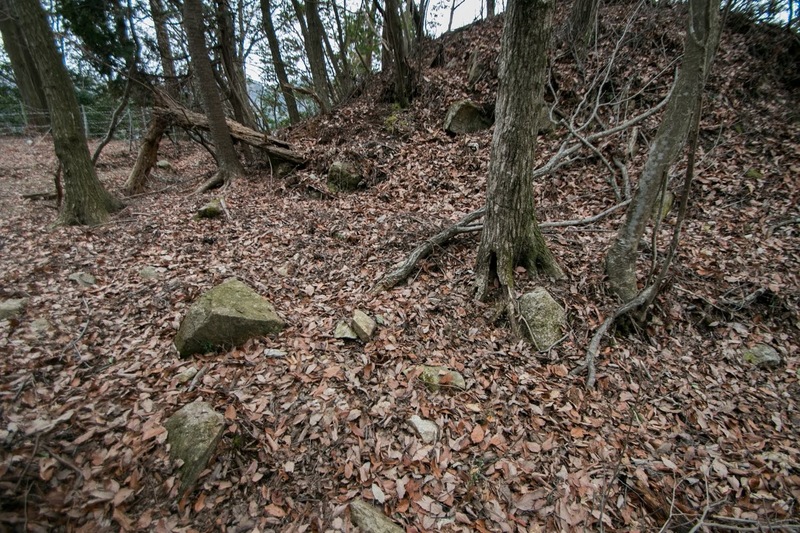 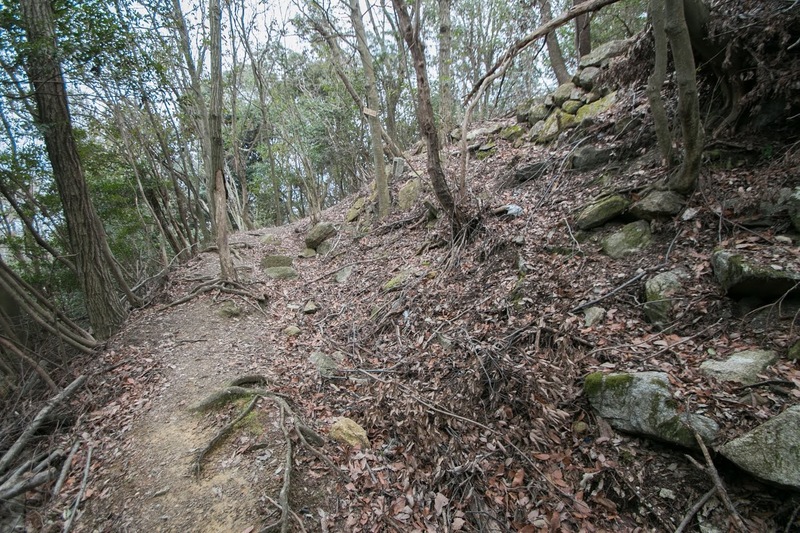 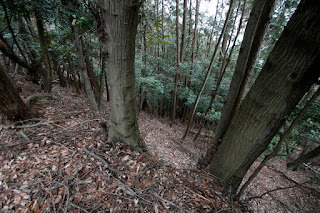 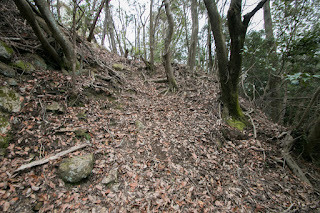 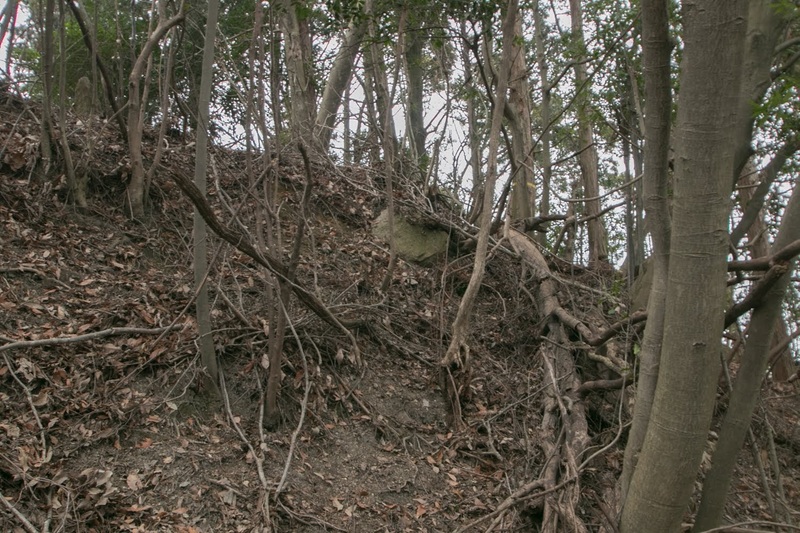 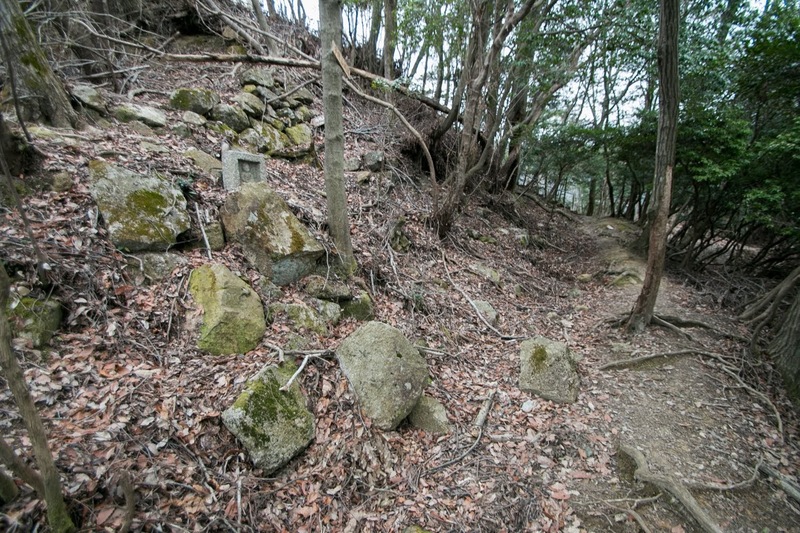 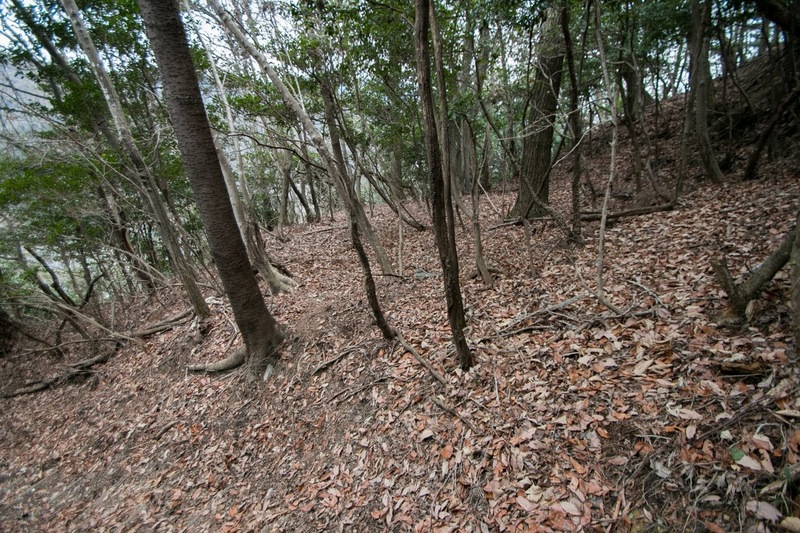 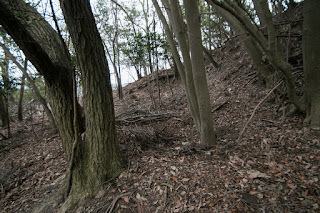 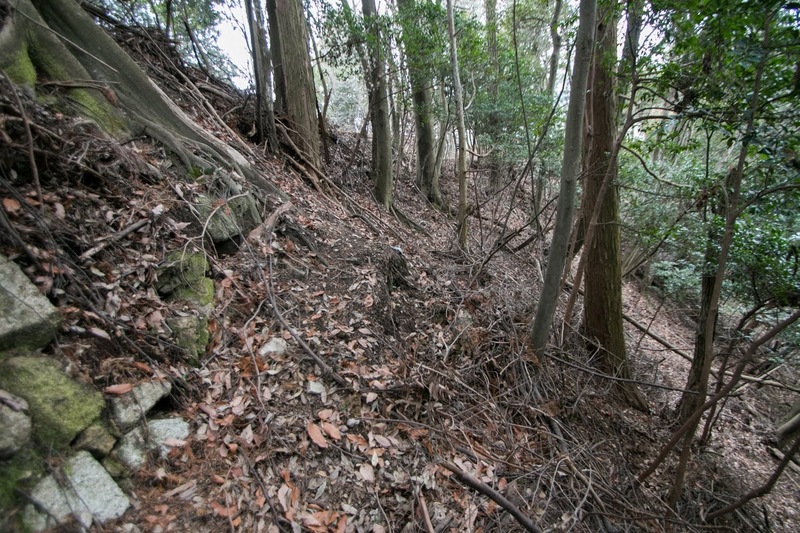 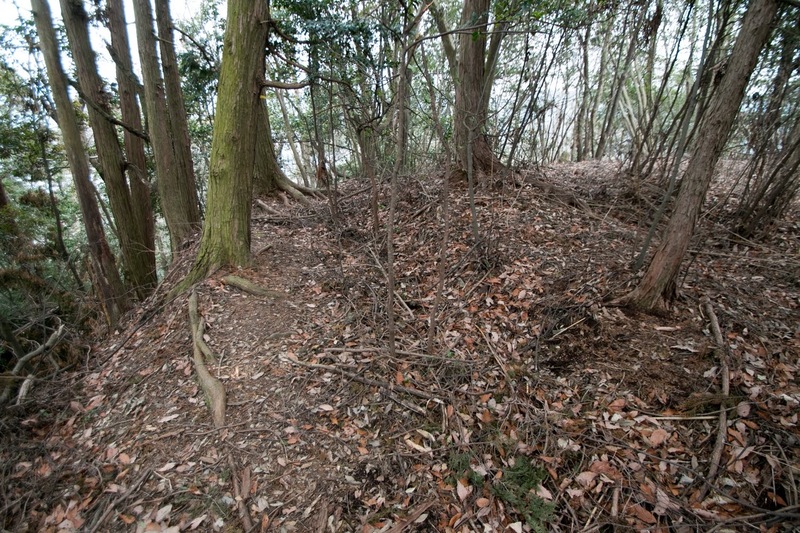 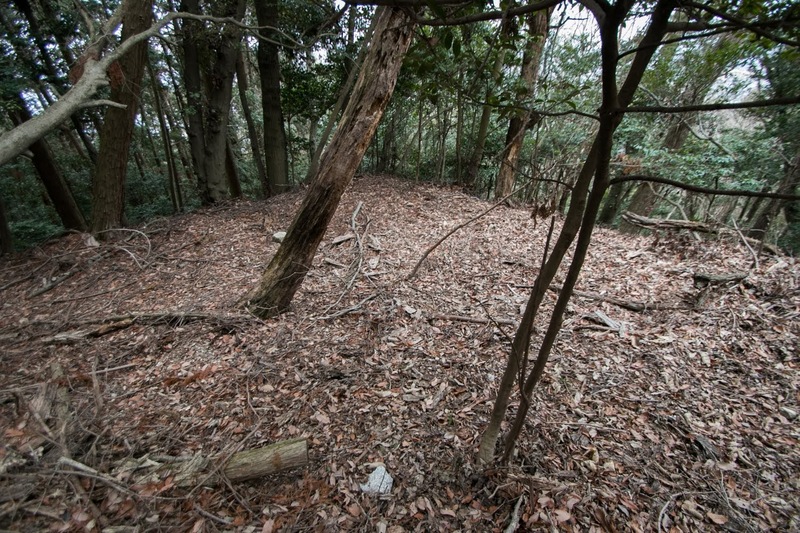 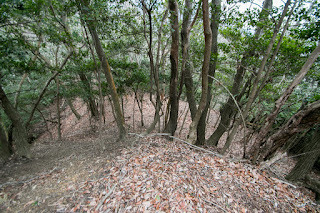 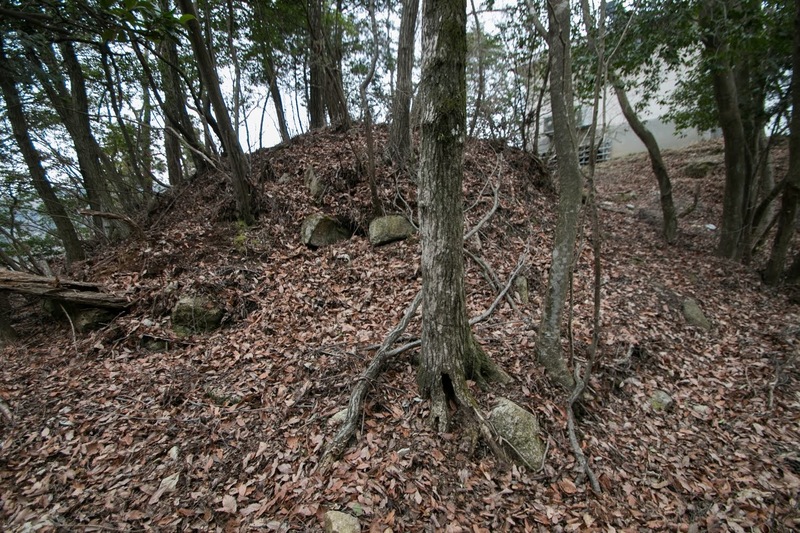 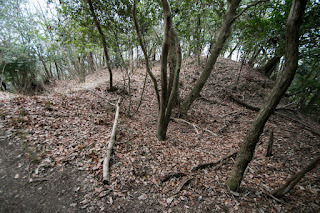 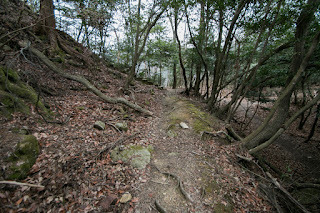 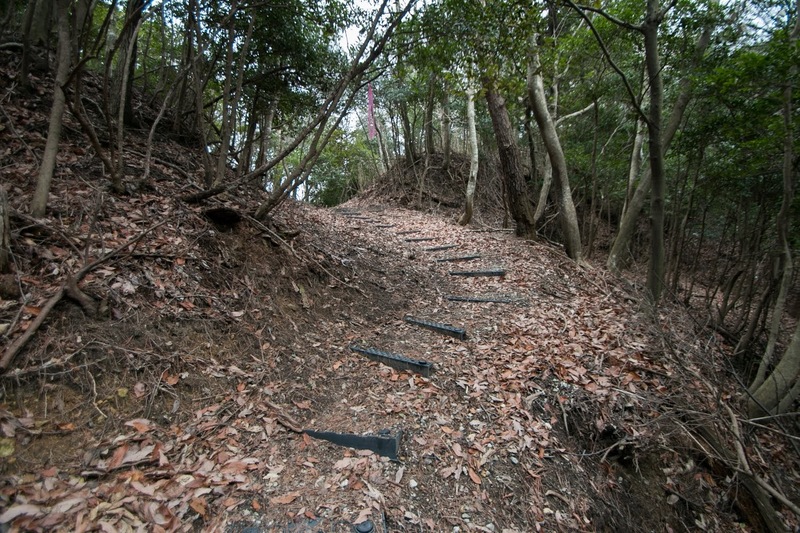 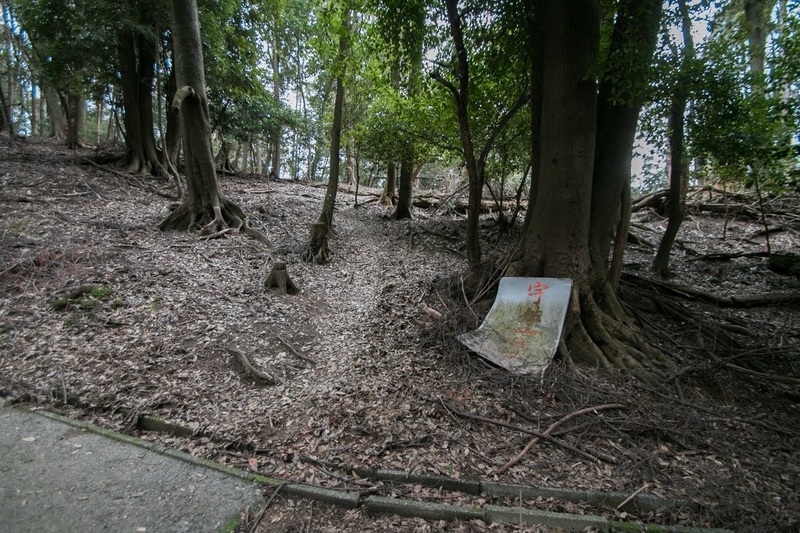 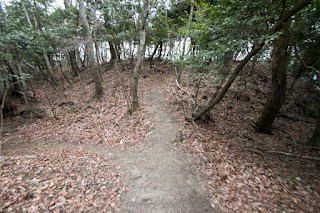 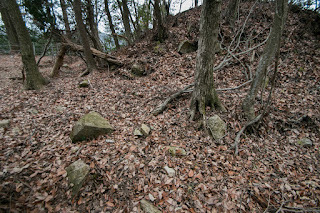 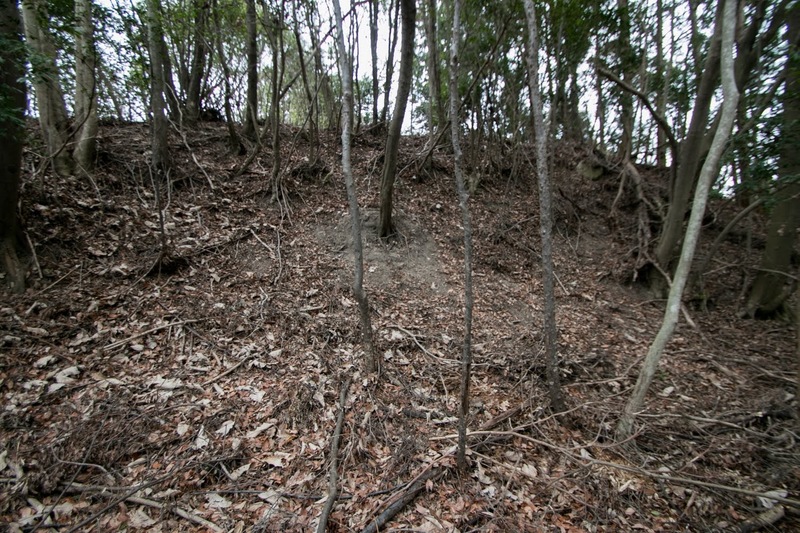 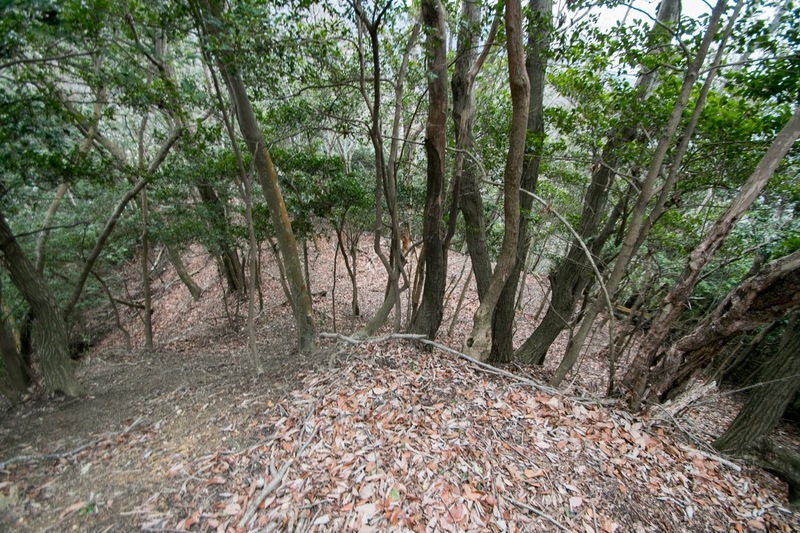 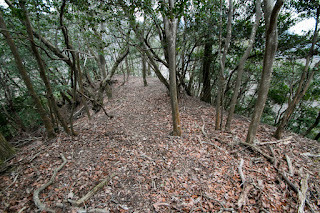 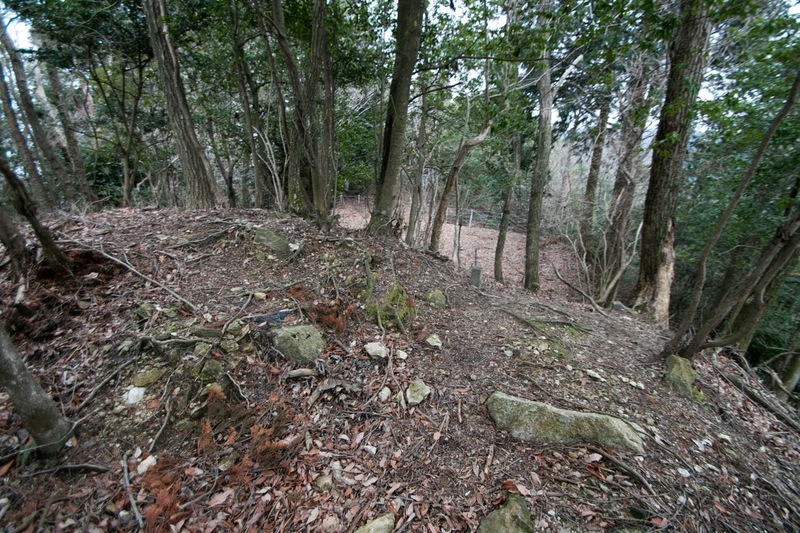 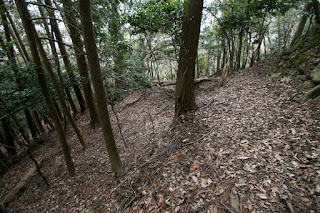 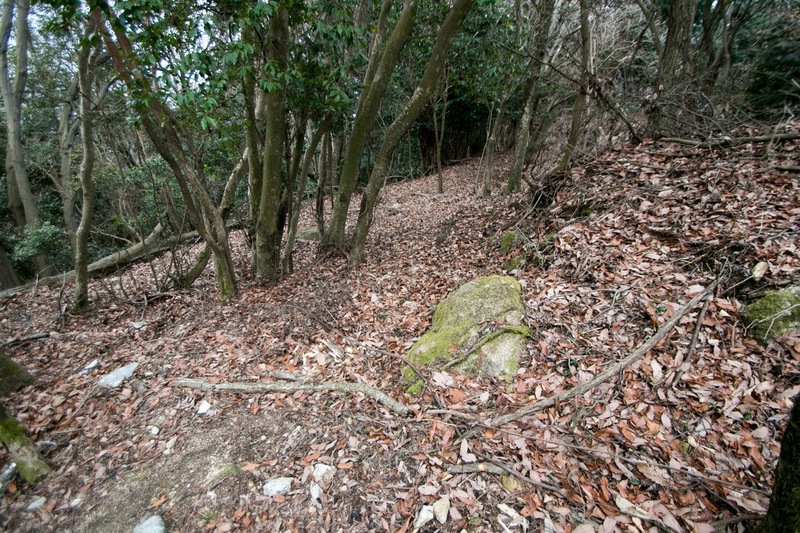 Central area of the castle is a long and narrow area of about 50 meter long and 15 meter wide, which might have stone walls at the eastern slope toward Lake Biwako. 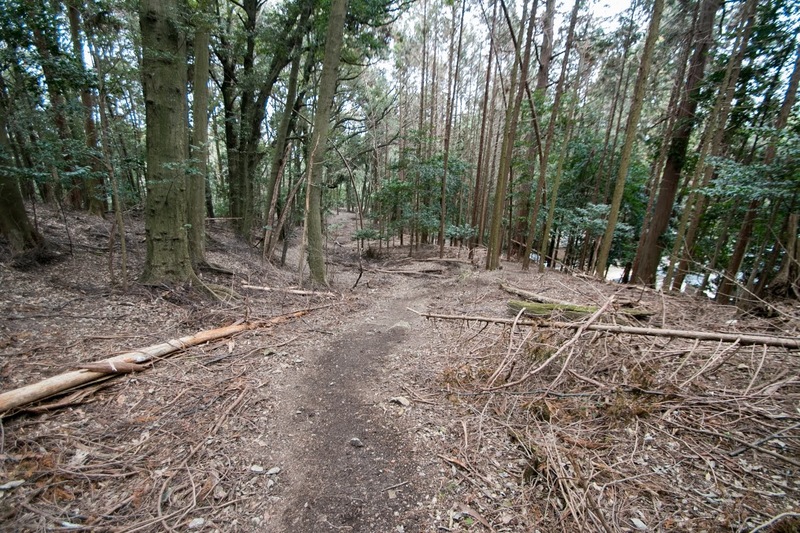 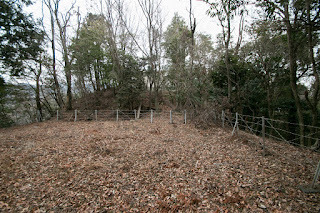 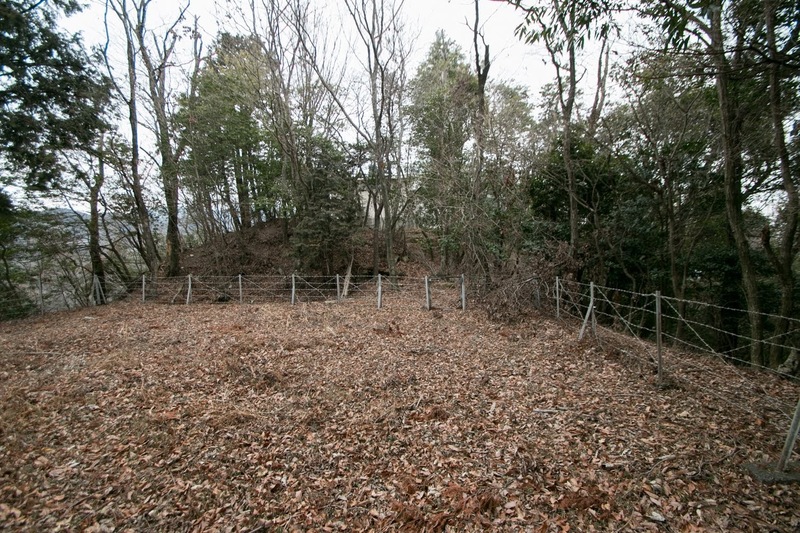 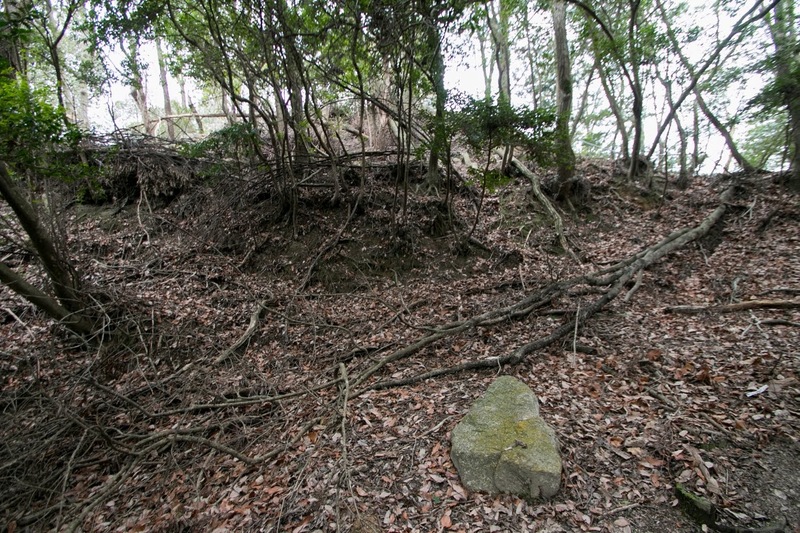 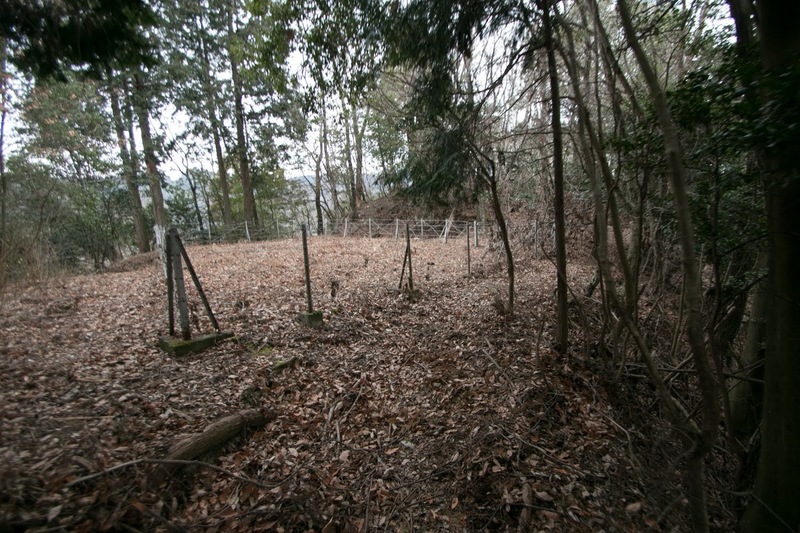 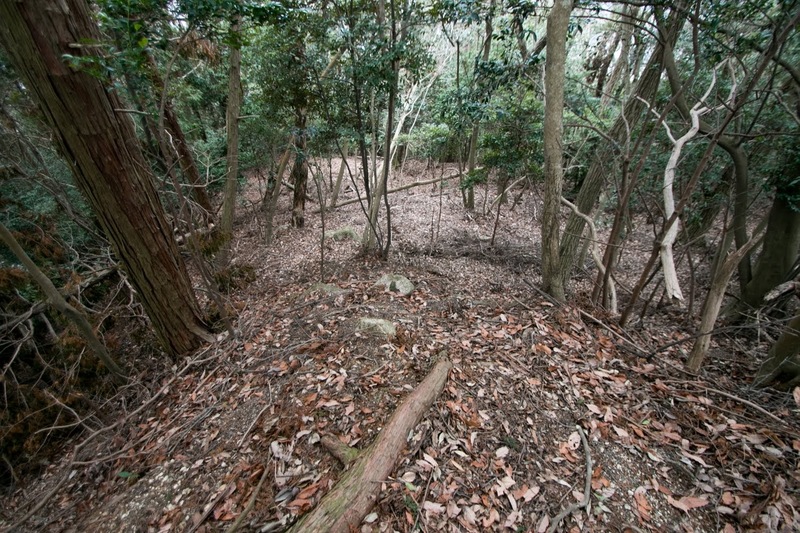 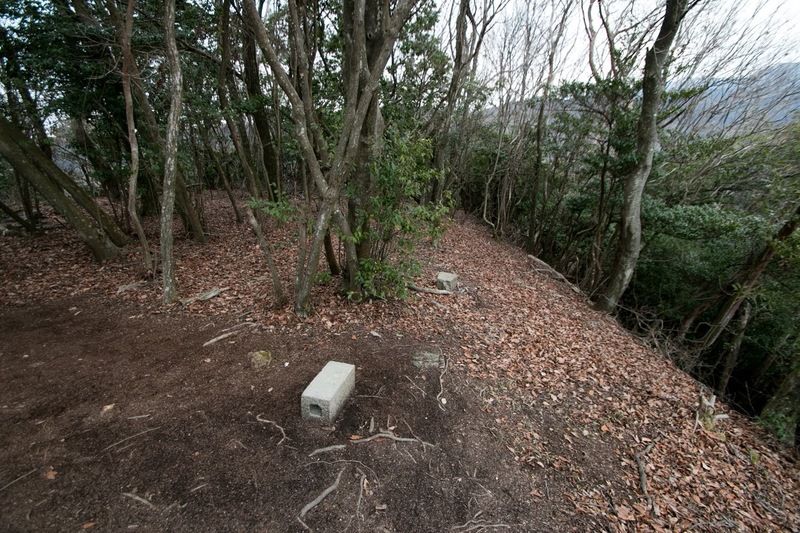 The shape of the area was processed to flat to build radio tower, but there was a ruin of Masugata style gate might have turret gate at its south edge. 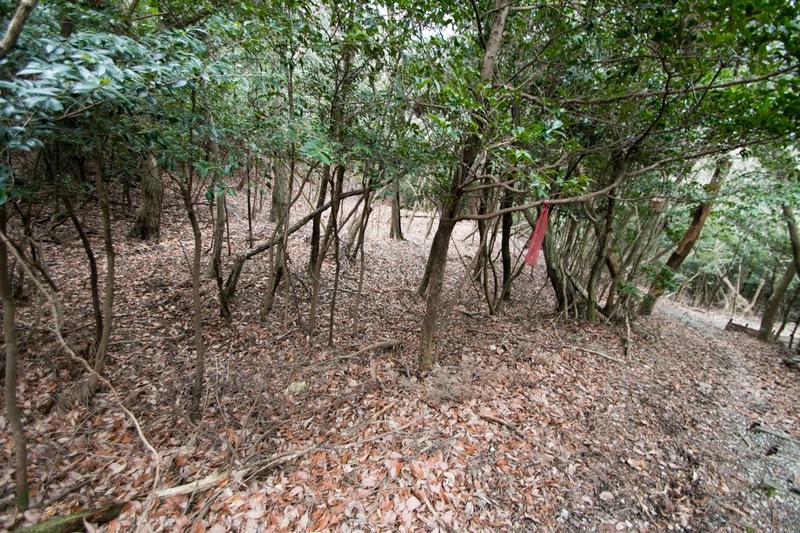 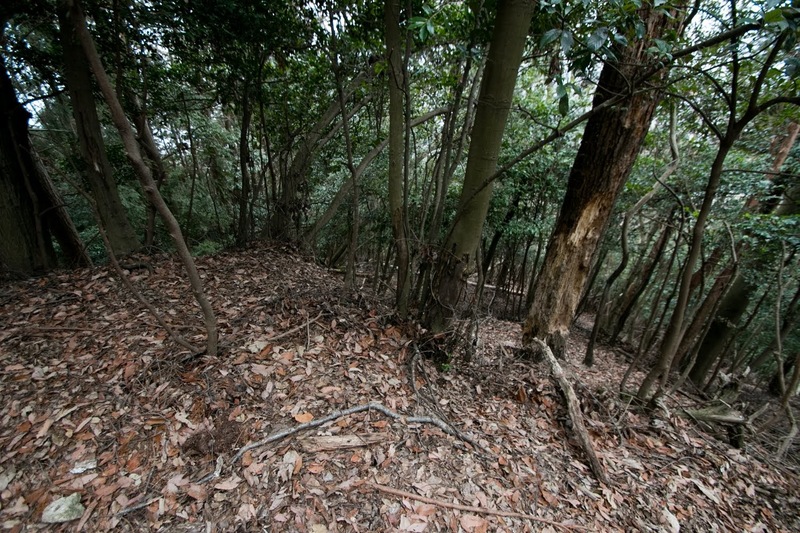 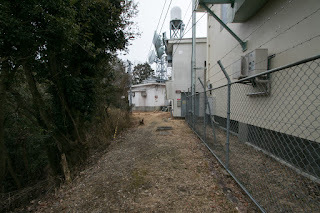 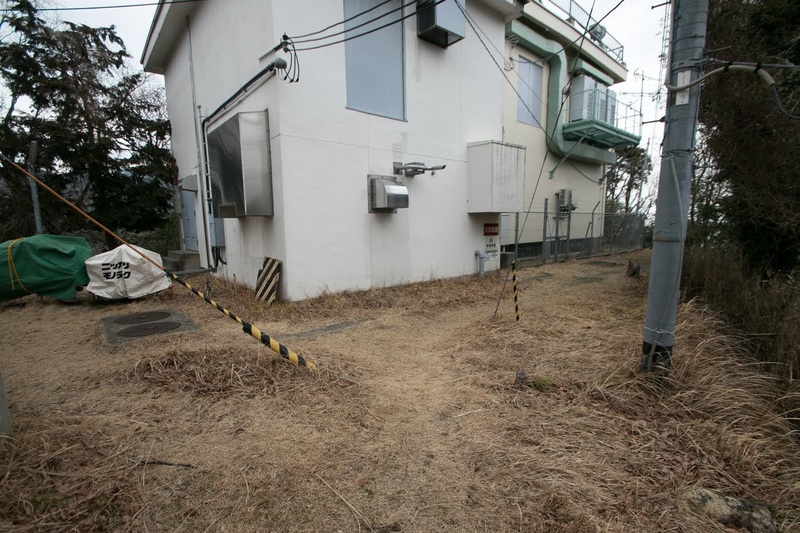 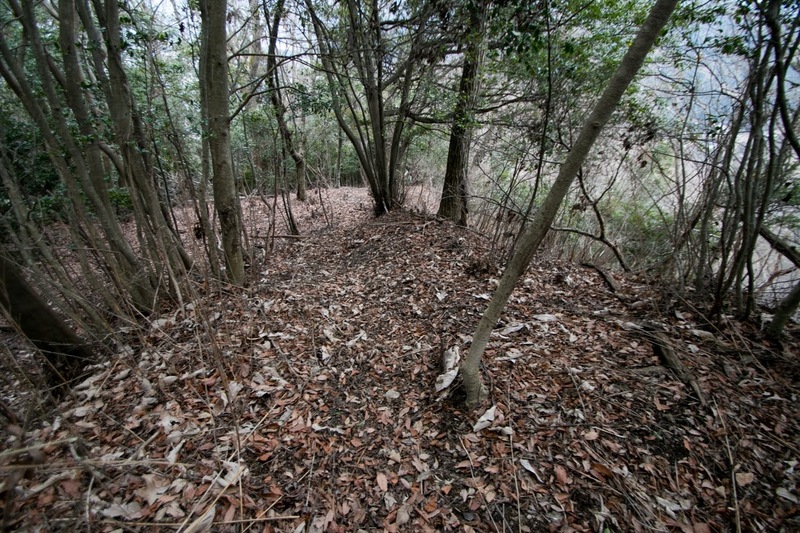 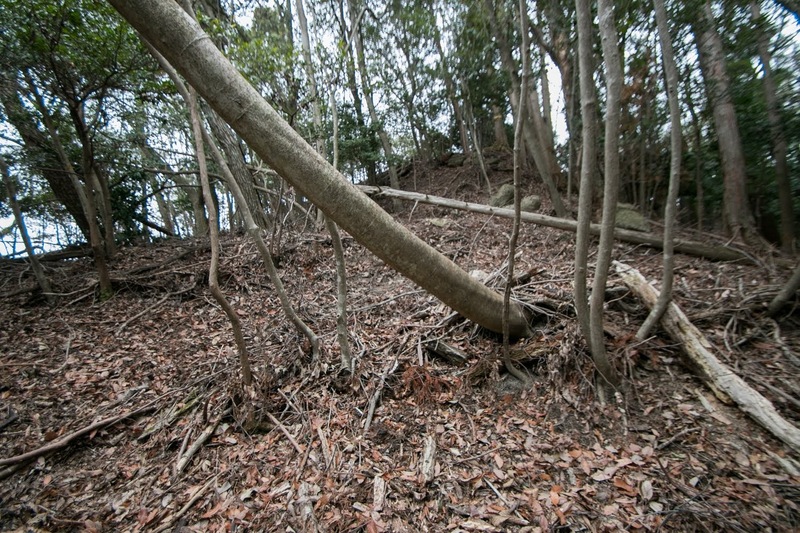 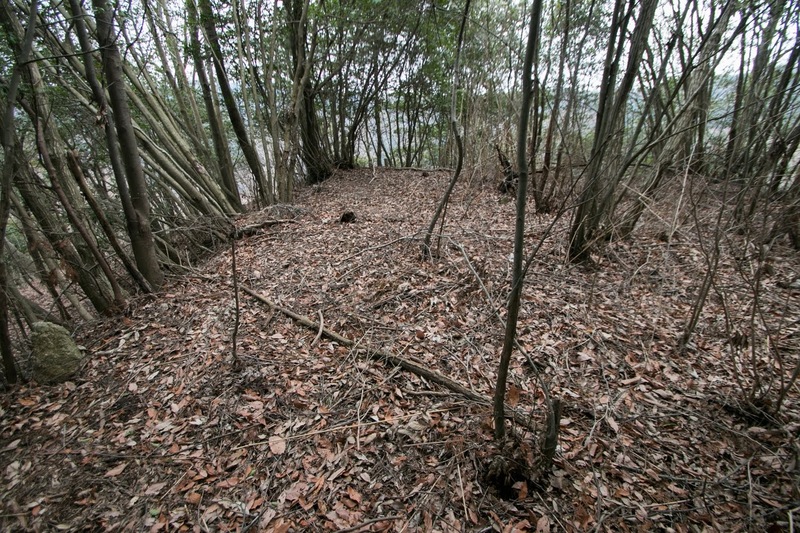 Secondary area is also a narrow and long area of 10 meter wide and 30 meter long, at the south of central area. At the south edge a lower corridor was built, and ruin of stone wall exists at its southeastern corner about 10 meter long and 2 meter tall. 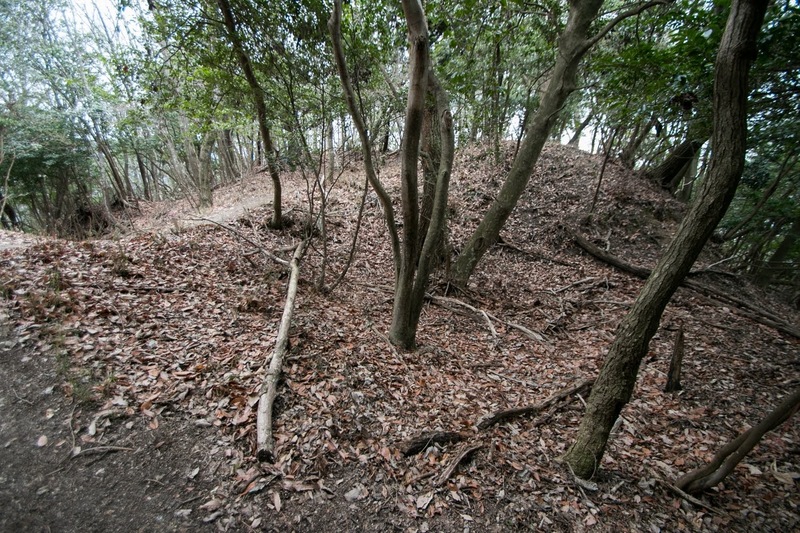 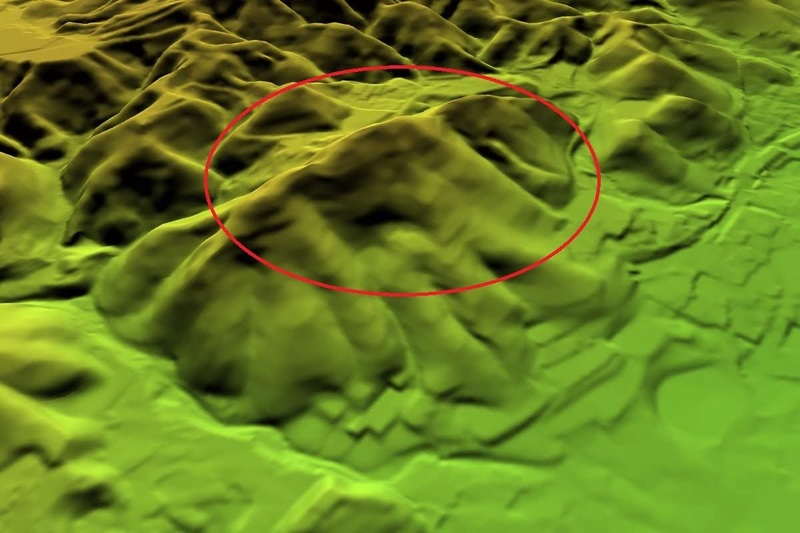 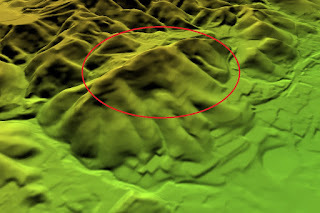 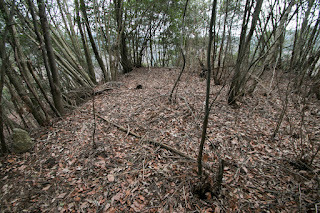 The third area at the north of central area is a medieval one surrounded by clay walls, which might be a front fort toward north. 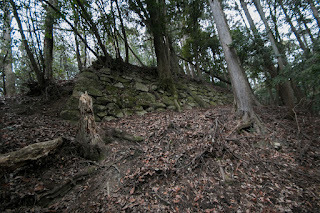 Total size of the castle is about 150 meter long and 20 meter wide, and not so large one. 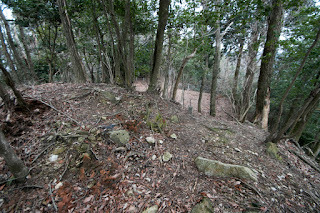 Nobunaga placed his confident general Yoshinari Mori (1523-1570) who was the lord of Kanayama castle (Gifu prefecture) as a commander of Usayama castle. In summer of 1570, Nobunaga broke the ally of Asakura and Azai army at the battle of Anegawa, and also rejected the counter attack of Rokkaku clan. 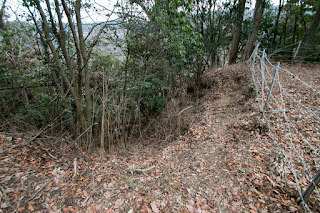 Nobunaga once secured Omi province (Shiga prefecture) moved to Settsu province (north part of Osaka prefecture) to beat Miyoshi army, but just at that time Ikko-Ikki army of Ishiyama Honganji army suddenly raised and attacked Nobunaga from backside. 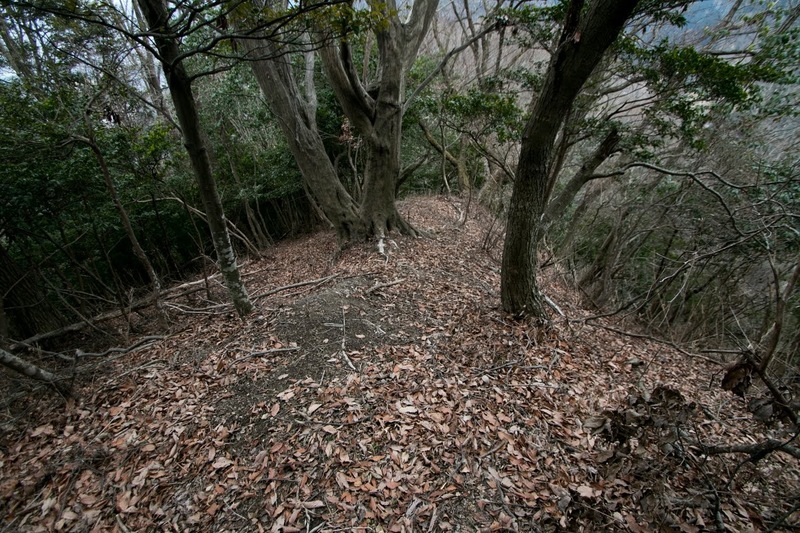 Before the overwhelming army of Honganji, Nobunaga was bound at Settsu province. Looking at this opportunity, Asakura and Azai army marched western lakeside of Lake Biwako southward for Kyoto city. Yoshinari only had 1,000 soldiers but intercepted Azai and Asakura army and once stopped it. 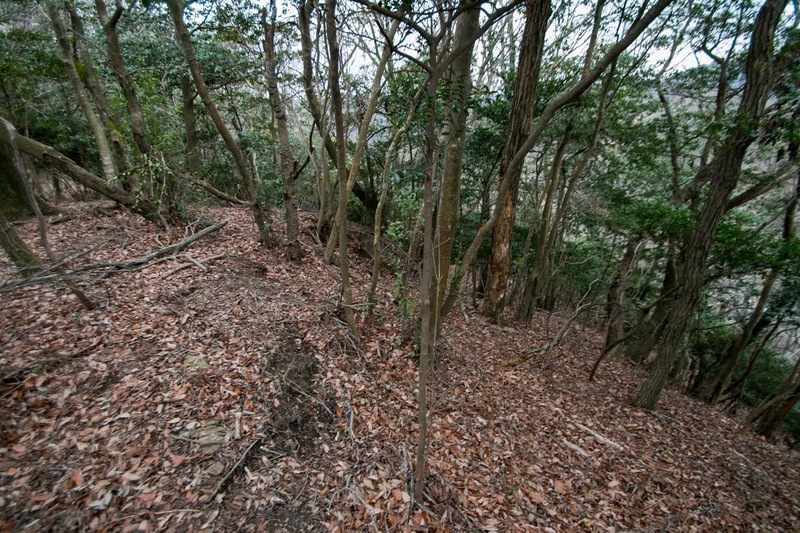 But under assist of monk army of Enryakuji Temple, Asakura and Azai army finally broke Oda army then Yoshinari Mori died in the battle. 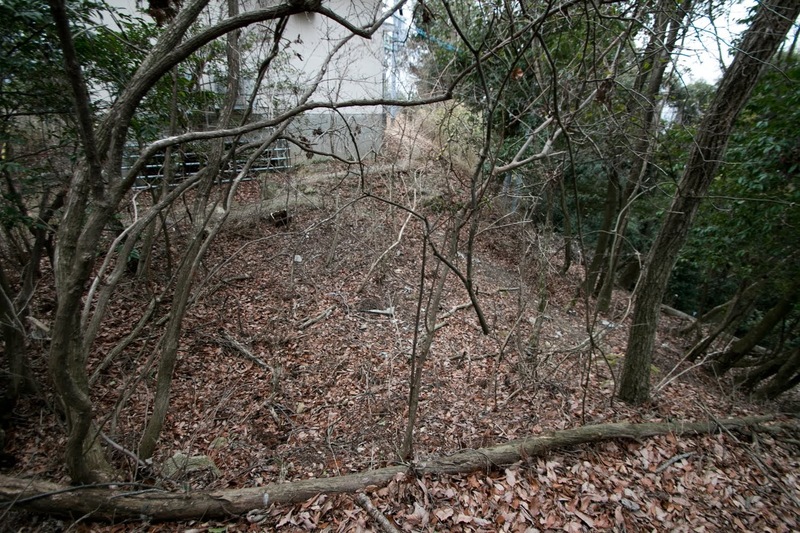 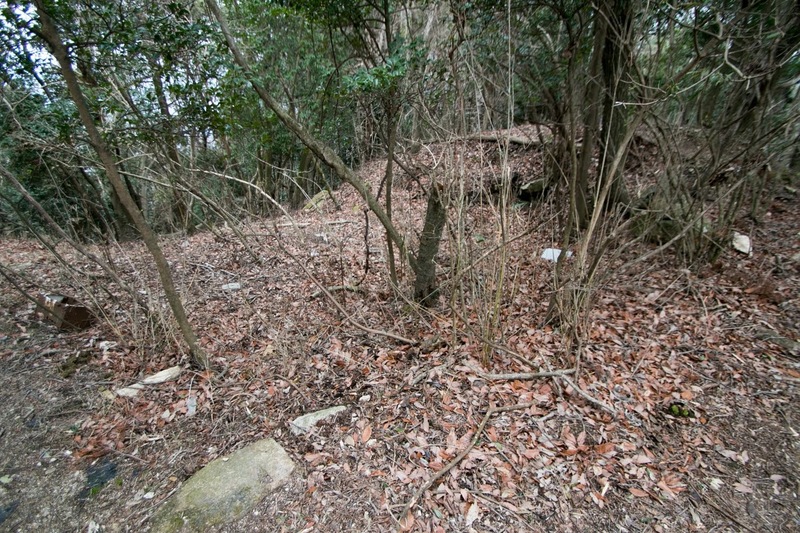 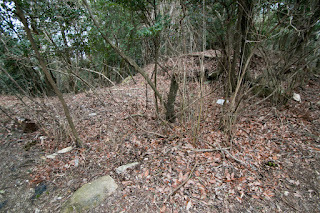 At this point, Oda army only had 500 soldier at Usayama castle and lost its general. 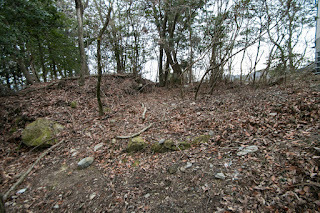 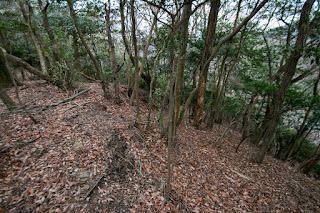 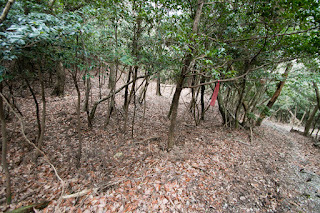 Asakura and Azai army next attacked Usayama castle with 20,000 soldiers, but remaining Oda army lead by Motomasa Kagami (1542-1600) later known as a brave general under Nagayoshi Mori (1558-1584), well stood this attack at Usayama castle and gained time. During this time, Nobunaga returned his army to Kyoto city and barely protected Kyoto city. 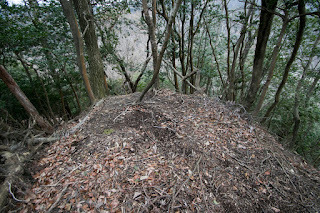 But Nobunaga had to face with Asakura army and Azai army besieged at Hieizan mountain, being surrounded by various enemies. 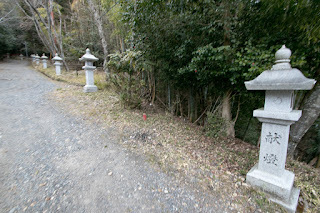 Losing his younger brother Nobuoki Oda (?-1570) or confident general Masahisa Sakai (?-1570), Nobunaga barely could make peace with Asakura army and Azai army and escaped desperate crisis. After that Nobunaga still fought with Asakura clan and Azai clan for three years, until the ruin of Asakura clan and Azai clan in 1573. 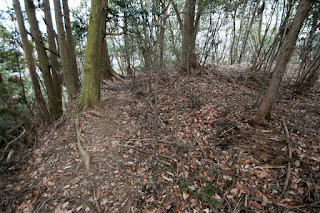 After the fall of Azai clan, Nobunaga gave Sakamoto area near Usayama castle to Mitsuhide Akechi (1521-1582) who was already placed as a commander of Usayama castle. Mitsuhide newly built Sakamoto castle (Shiga prefecture) at lake side to grasp marine transportation and commerce of Sakamoto town, thus Usayama castle was abolished at this time and stones might be used for the construction of Sakamoto castle. 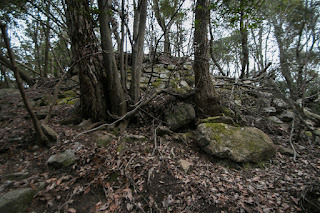 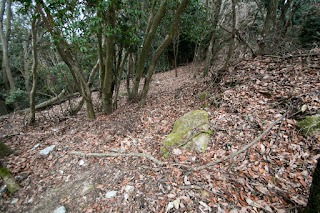 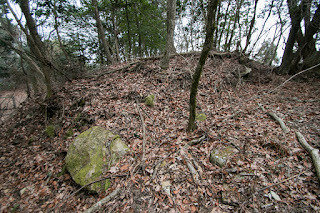 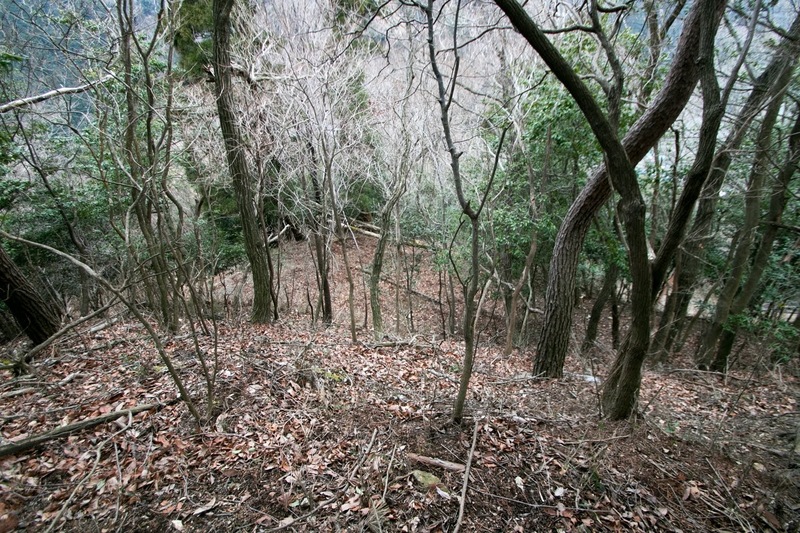 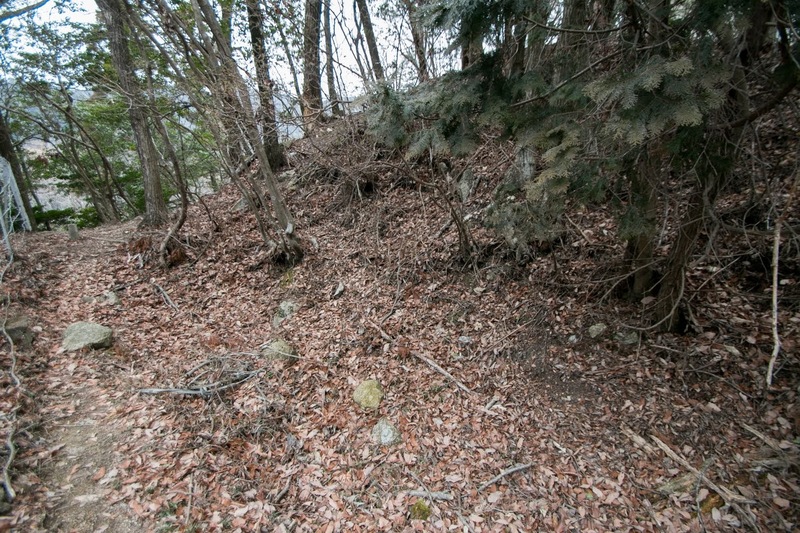 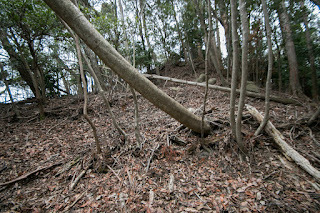 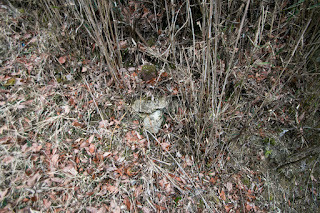 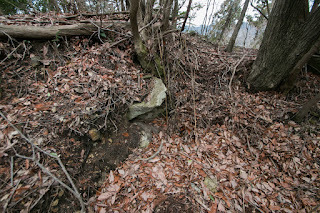 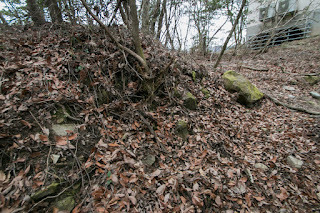 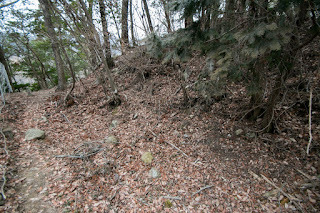 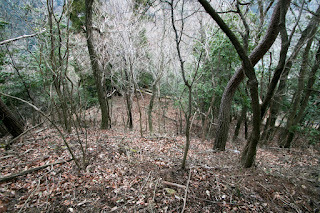 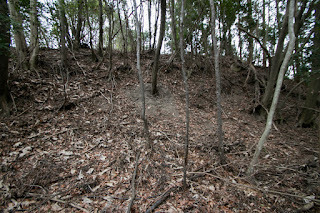 Today all building and major part of stone walls were lost, but structure of the castle roughly remain on the mountain. 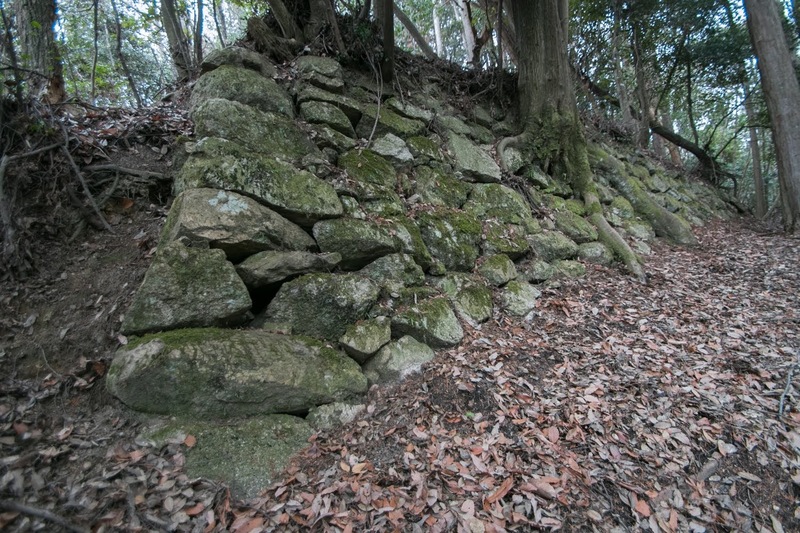 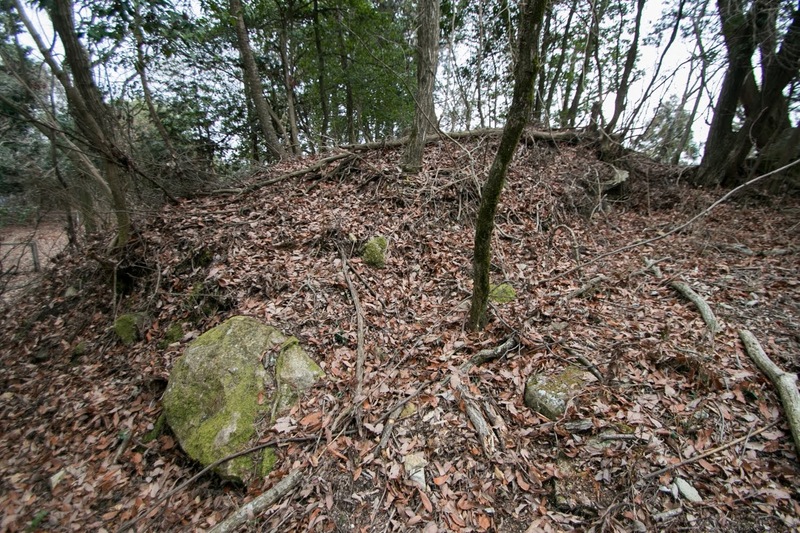 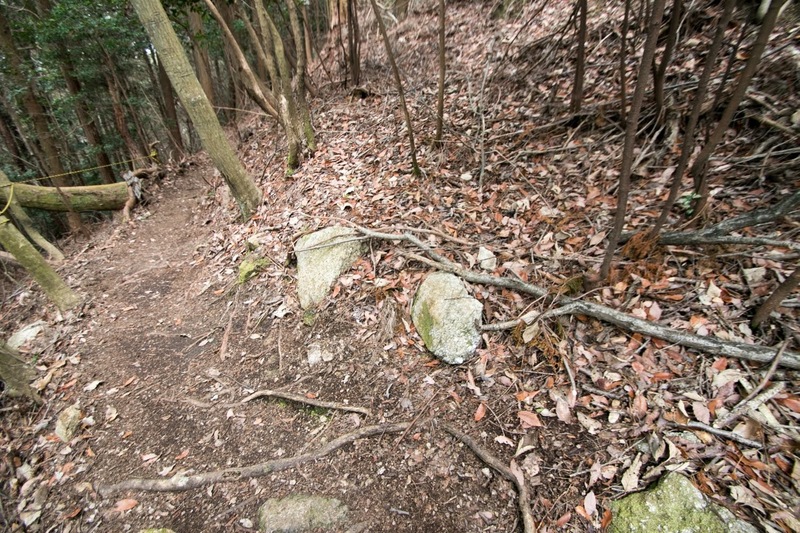 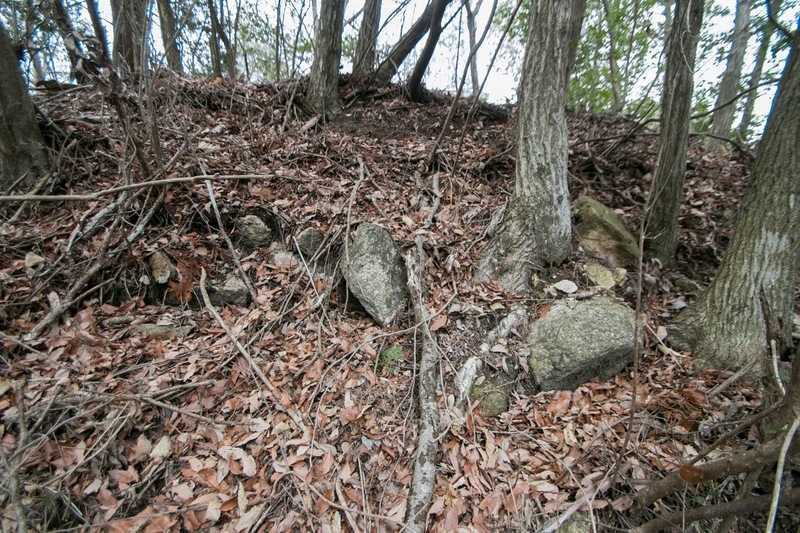 Stone wall partially remain at the edge of secondary area and below of central area, but angular corners and straight line of the area indicates usage of stone wall at every line of central and secondary area. 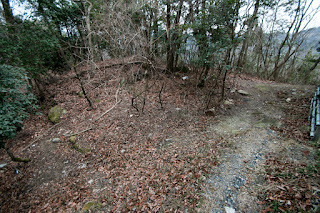 The life of Usayama castle was short only about three years, but keeps its name long time as a place of fierce battle and the origin of modern style castle, above all. 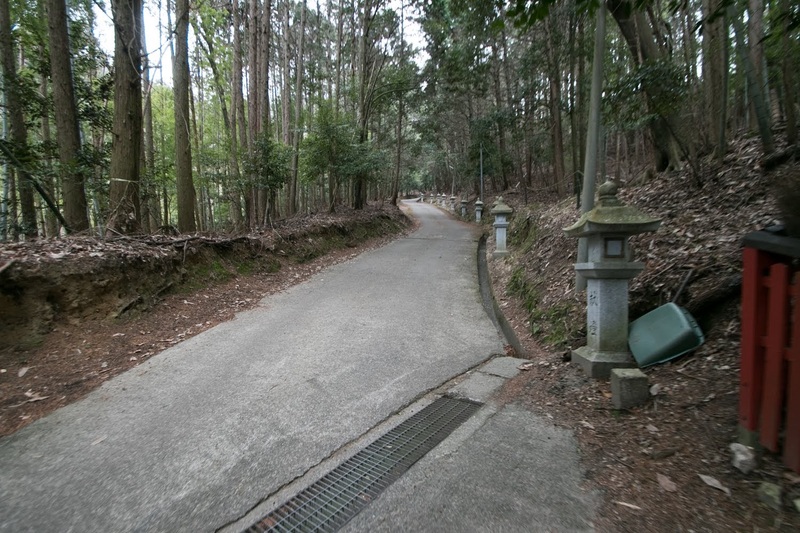 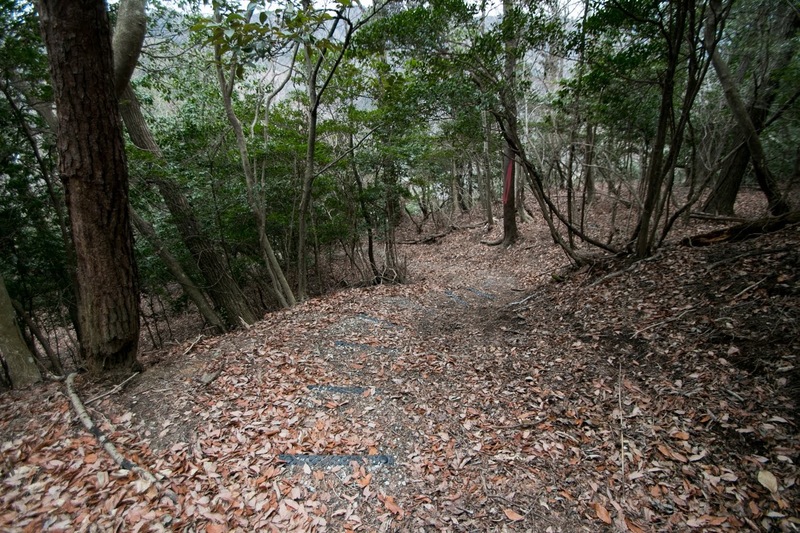 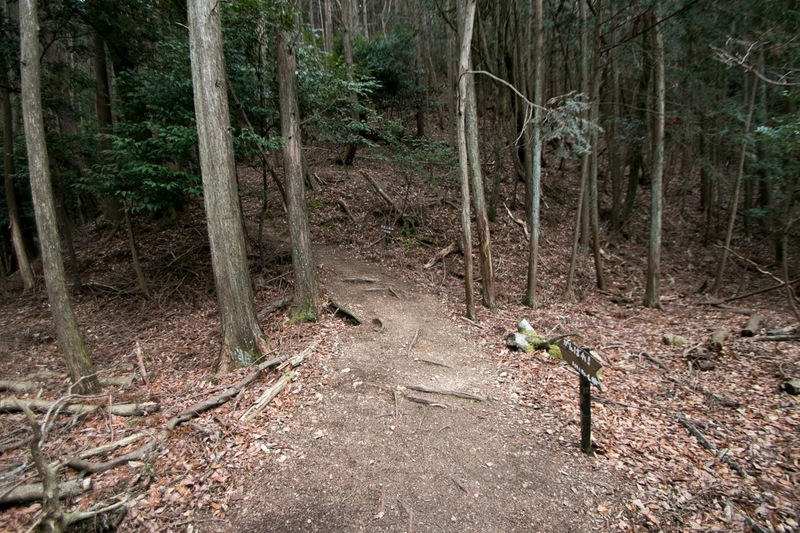 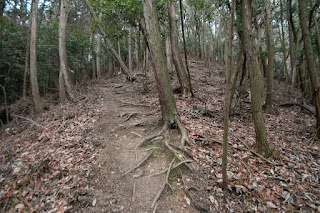 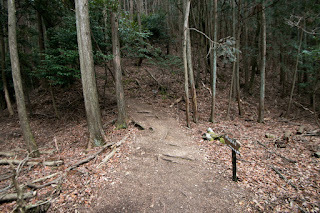 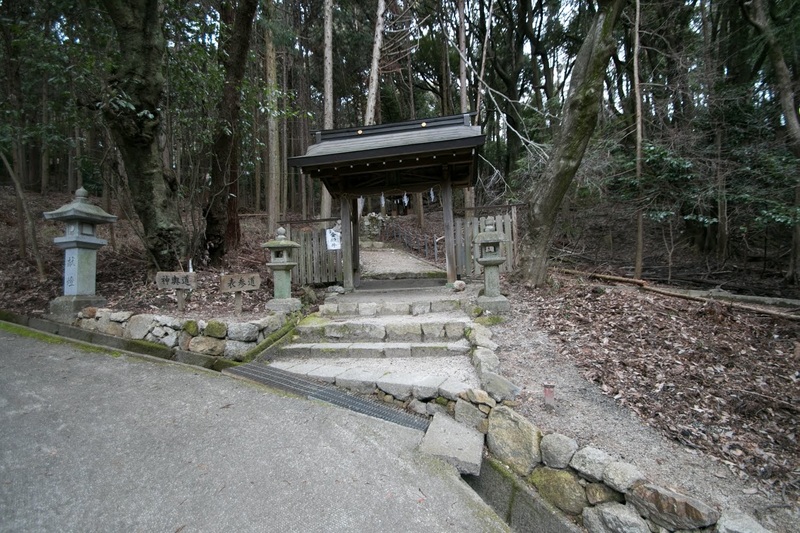 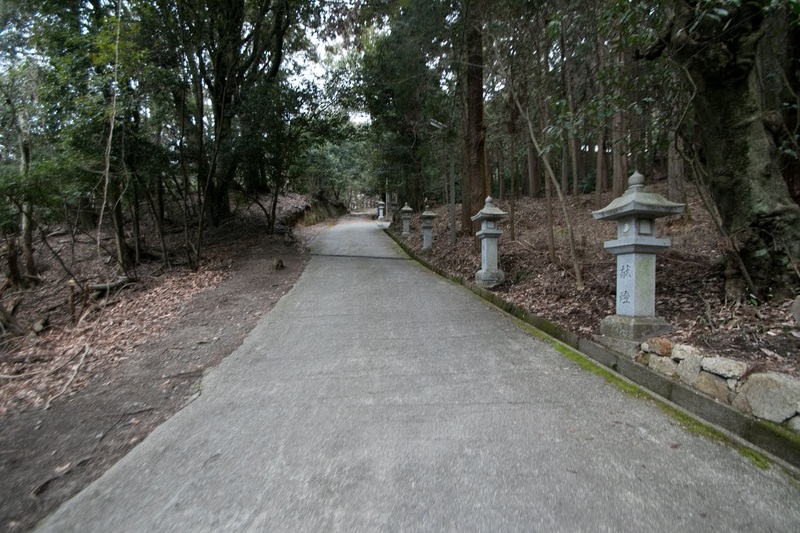 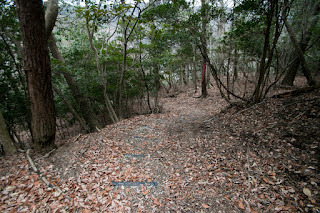 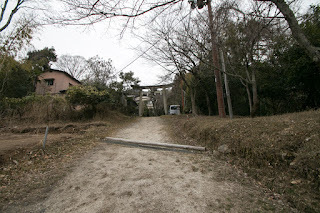 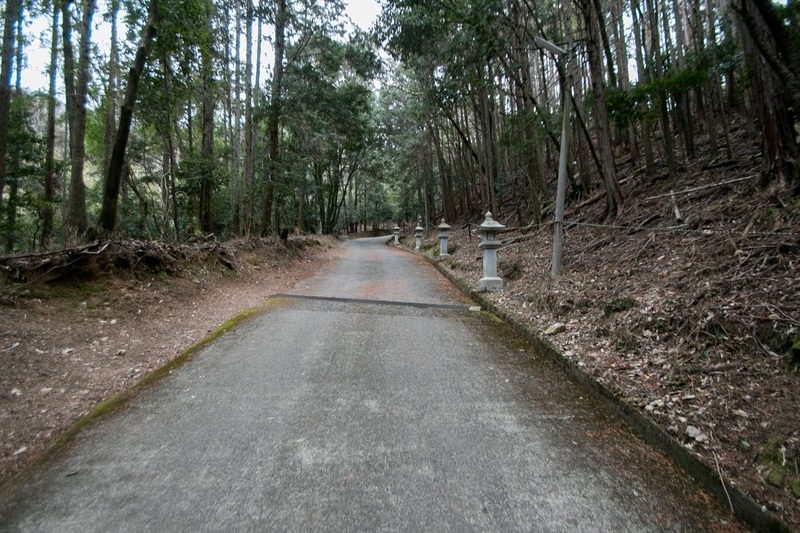 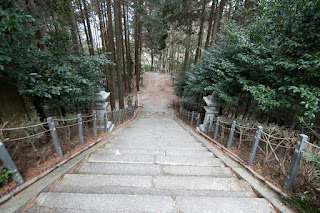 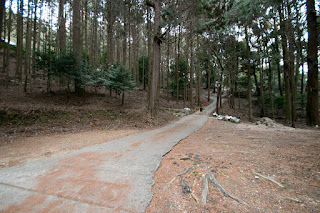 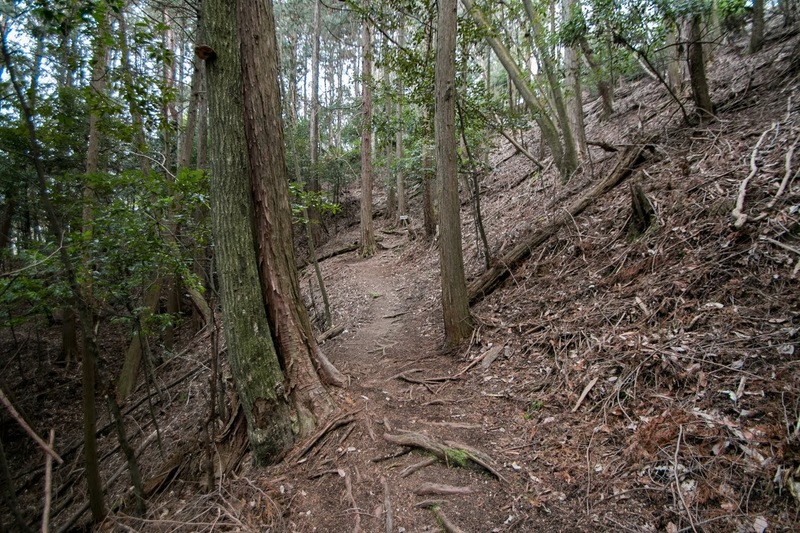 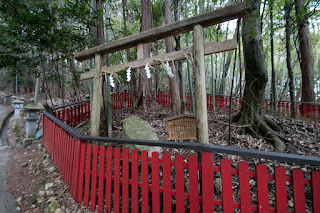 15 minutes walk from Keihan-Dentetsu Ishiyama-Sakamoto line Omi Jingumae station to entrance of climbing route near the main shrine of Usa Hachimangu Shrine (Otsu city), at the back of Omi Jingu Shrine. 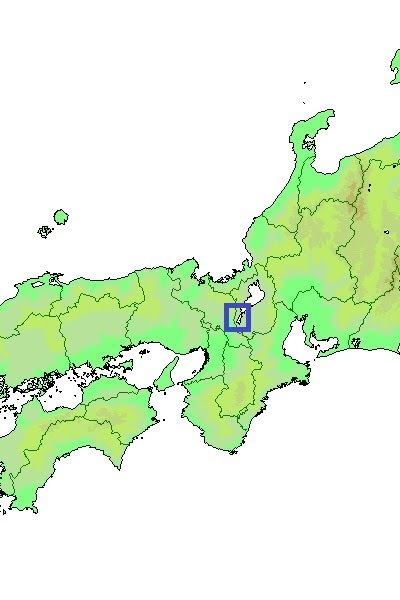 20 minutes drive from Tomei Expressway Otsu-Higashi interchange. 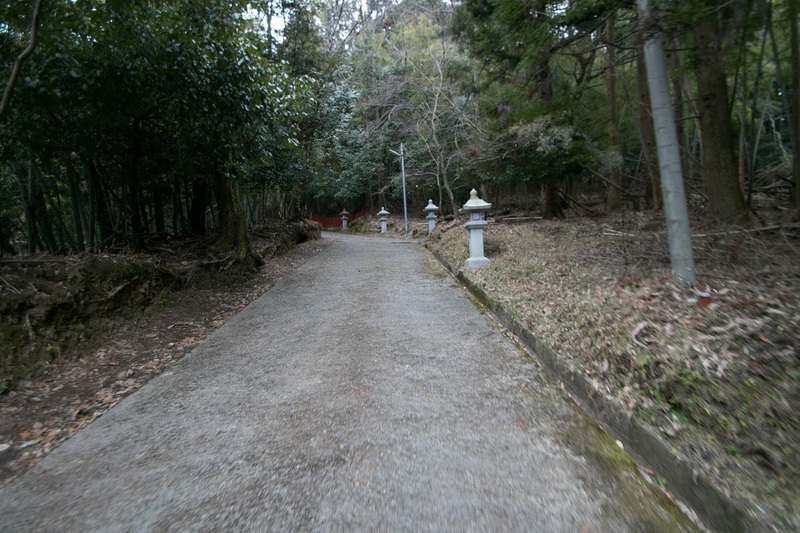 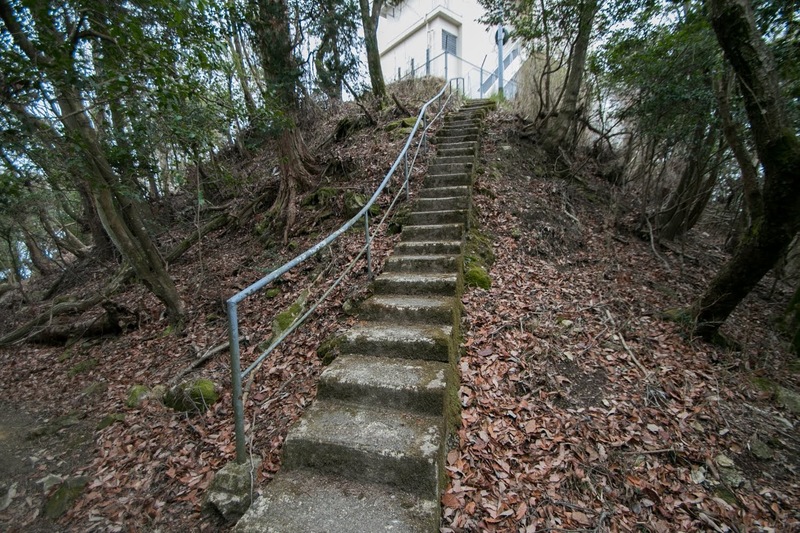 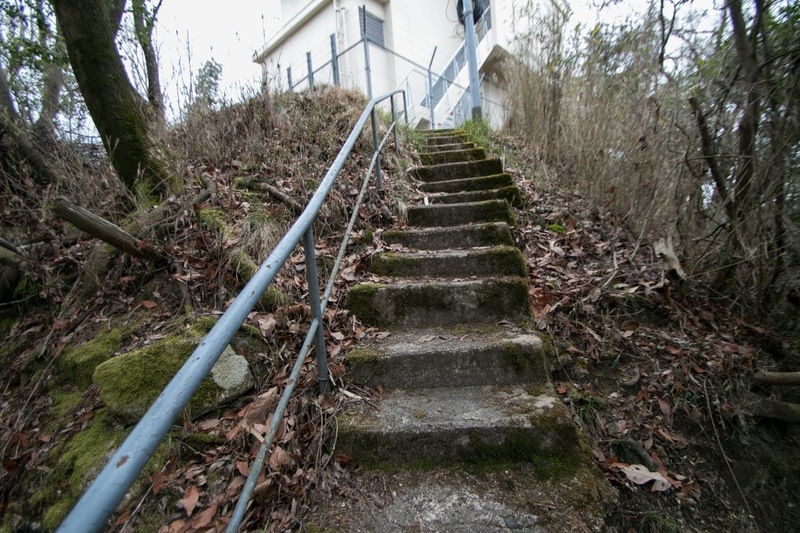 20 minutes walk from entrance of climbing road to hilltop castle.